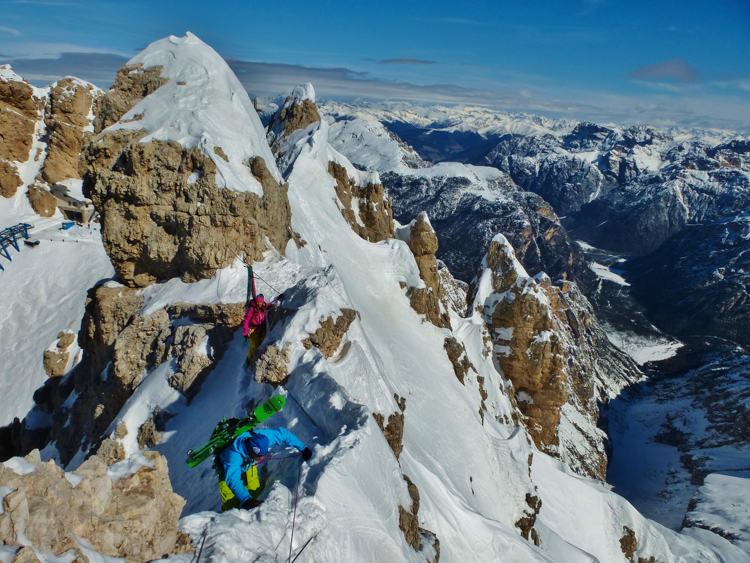 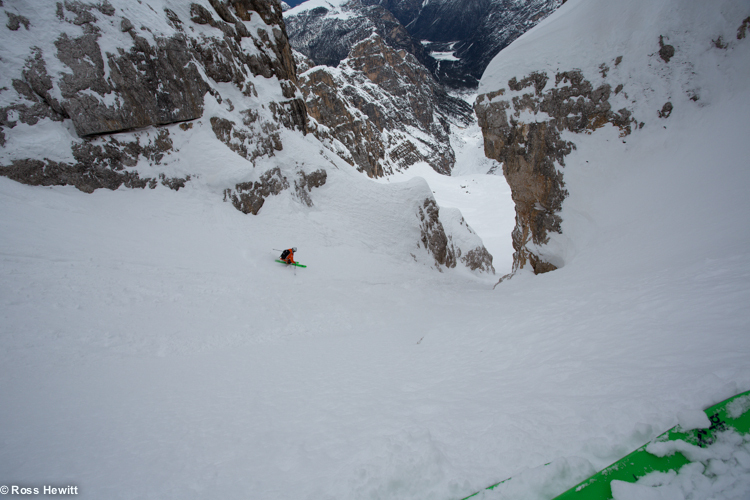 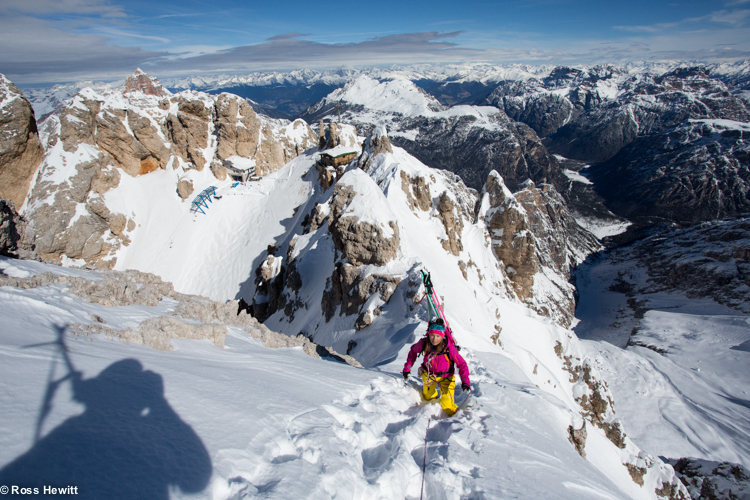 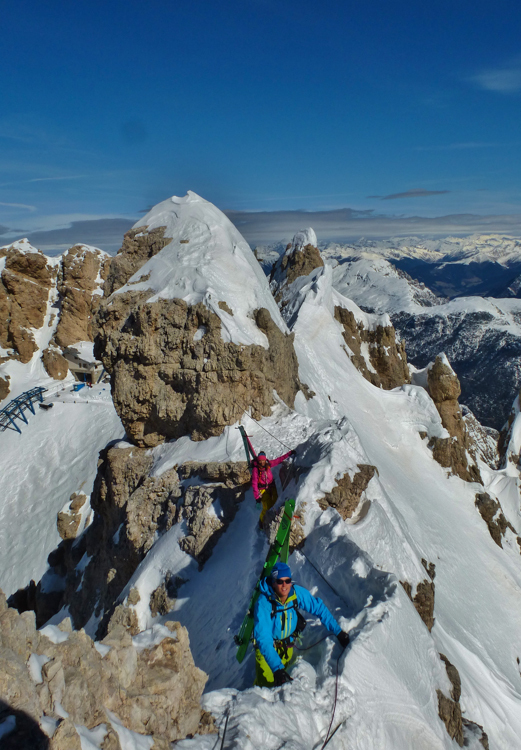 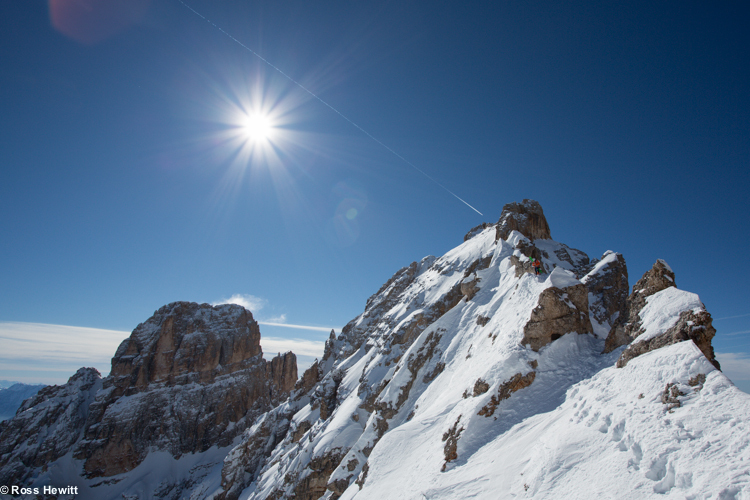 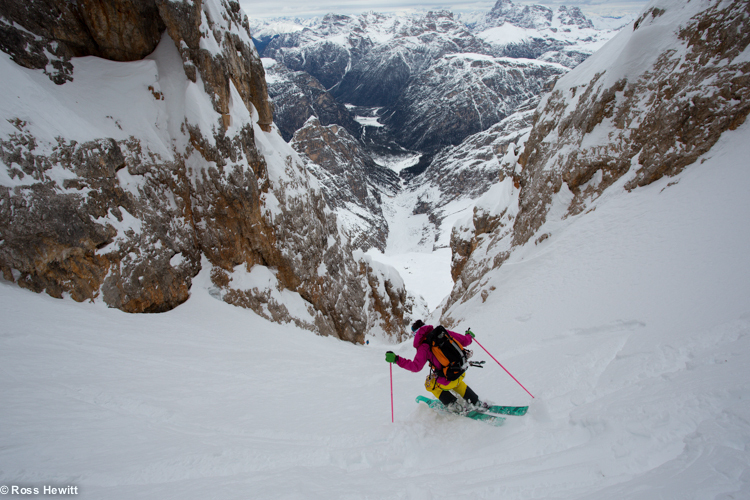 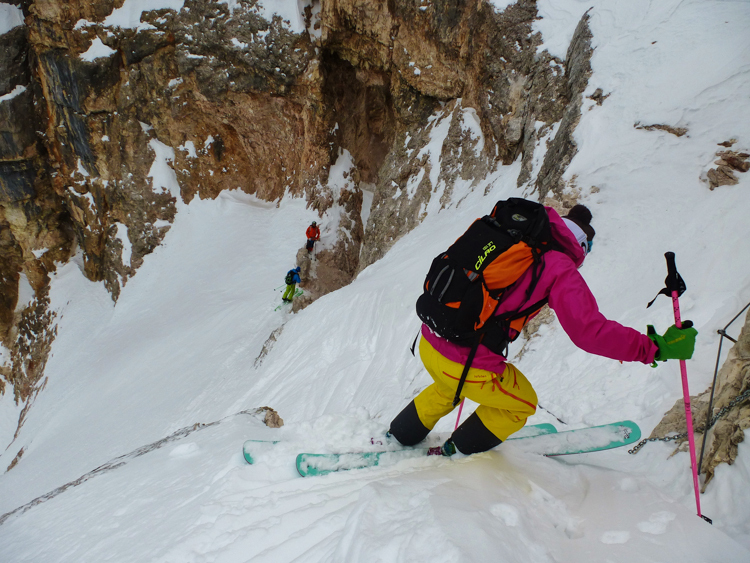 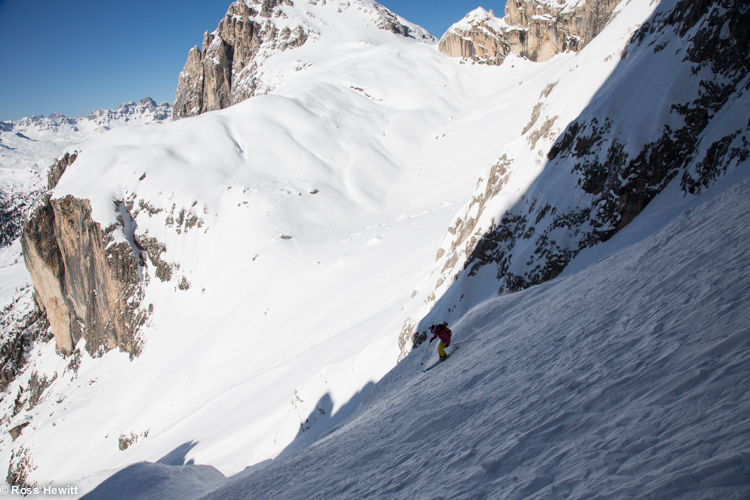 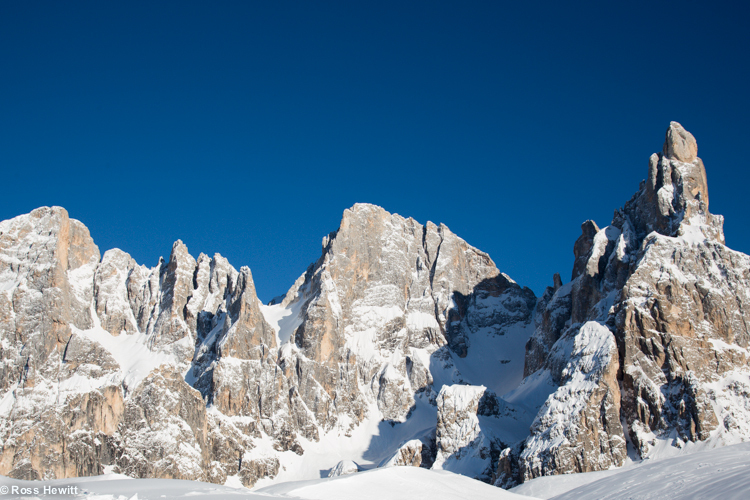 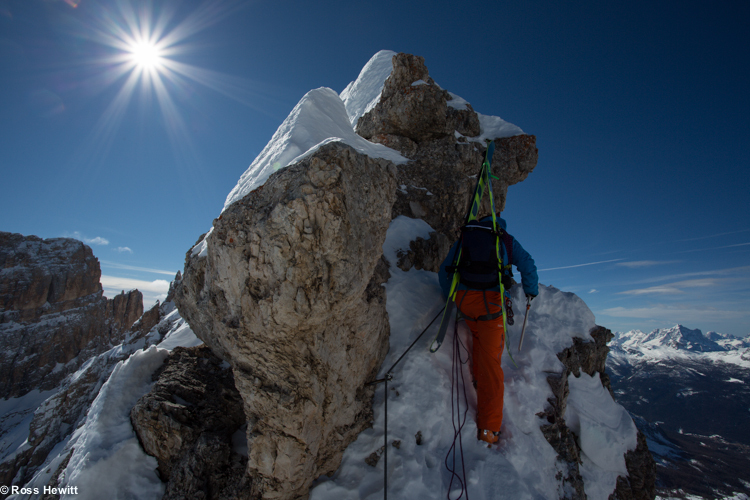 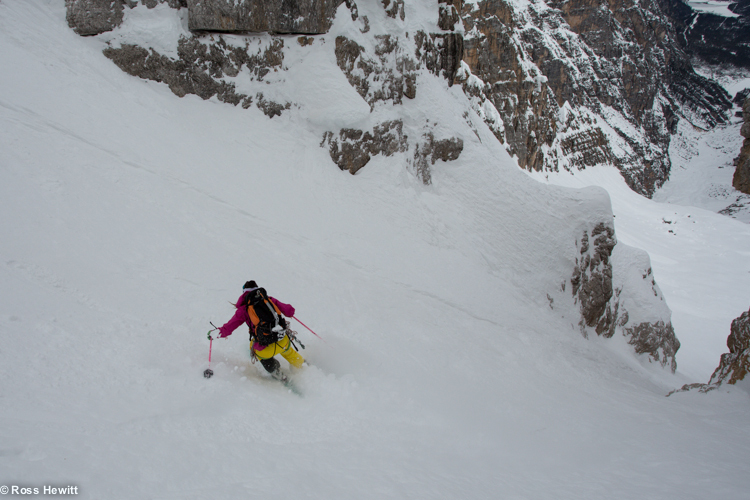 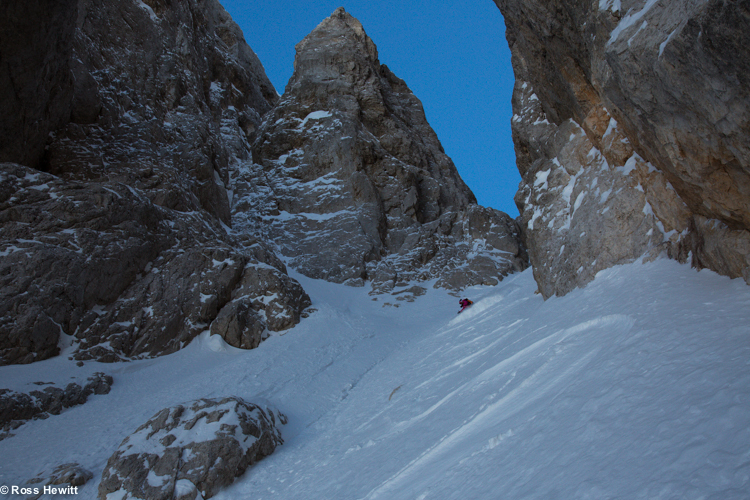 Photos from Tommasco Cardelli (White Spirit Guides, Dolomites) of your recent trip to Cristallo and the Vallencant Couloir. 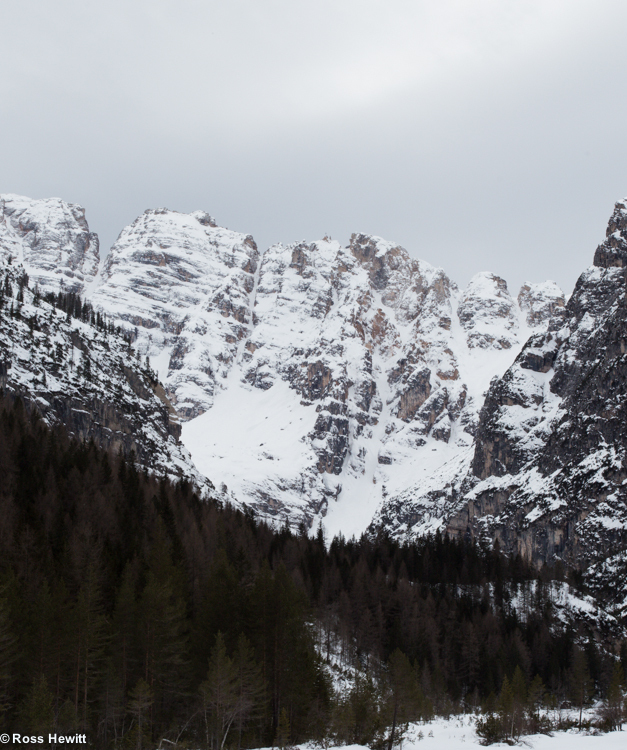 When Minna first sent me a note asking if I wanted to deploy to the Dolomites for the weekend, I have to say I was less than enthusiastic. 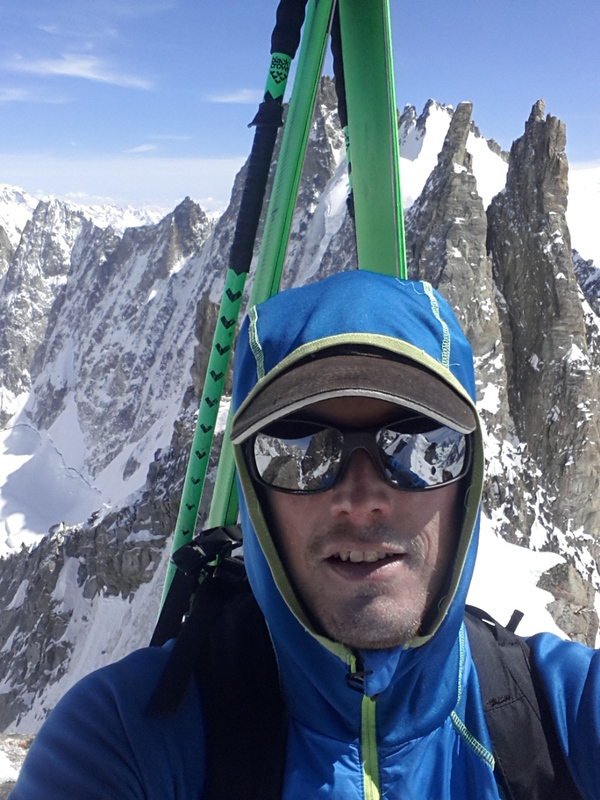 I’d just finished a heavy week training on skins, bikes and pushing weights, I had work to do and DIY to finish. 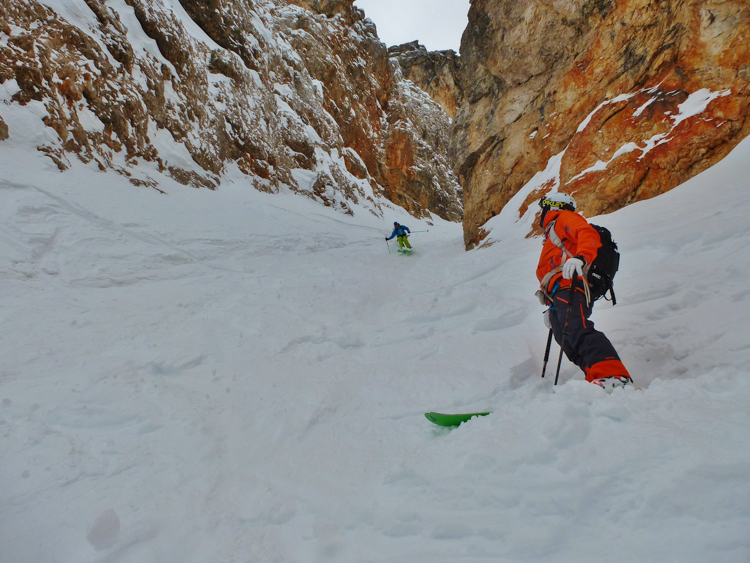 The perpetual climate change hurricane was destroying the snow in Cham and I felt like I could use my time more efficiently at home than getting up at 4 am and driving half the way to Kalymnos and back in the hope of some snow. 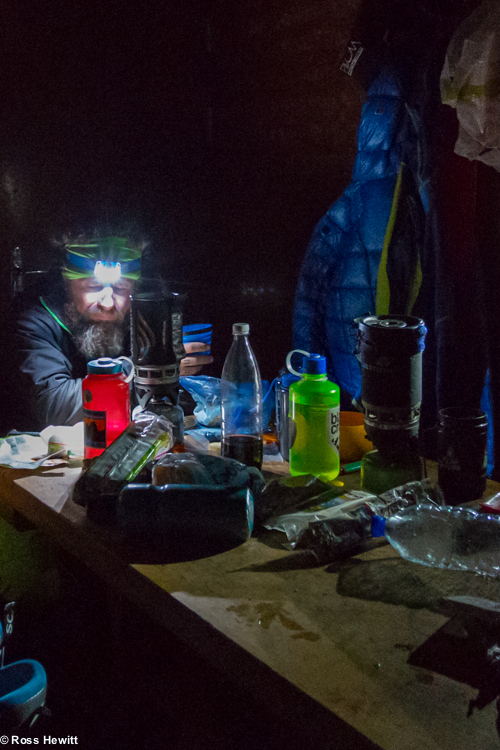 Its been a long time since we spent every winter weekend driving through the night chasing Scottish winter climbing conditions and I have to say I don’t miss the driving. 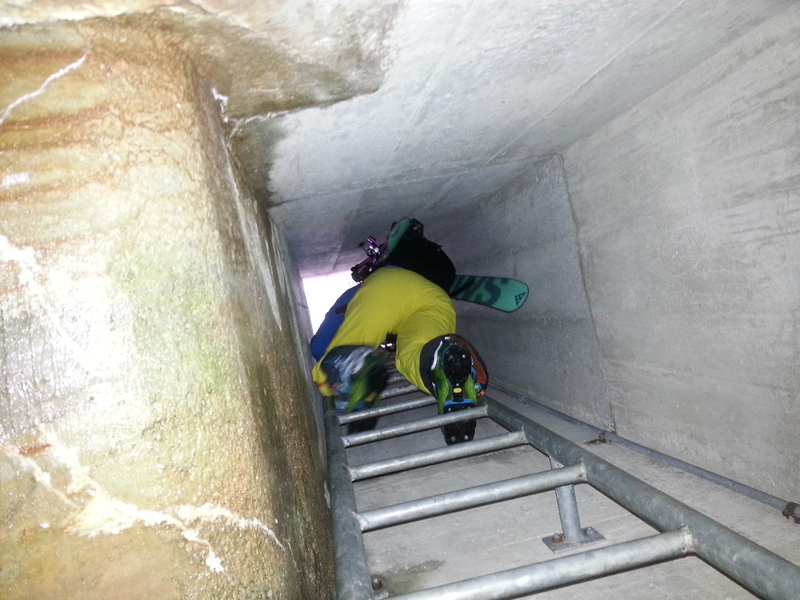 Then she mentioned 80 cm. 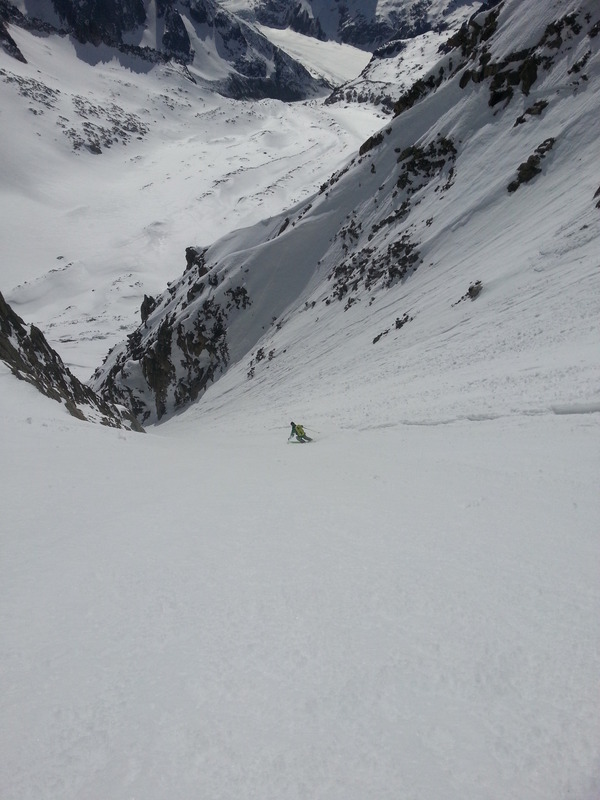 And no wind. 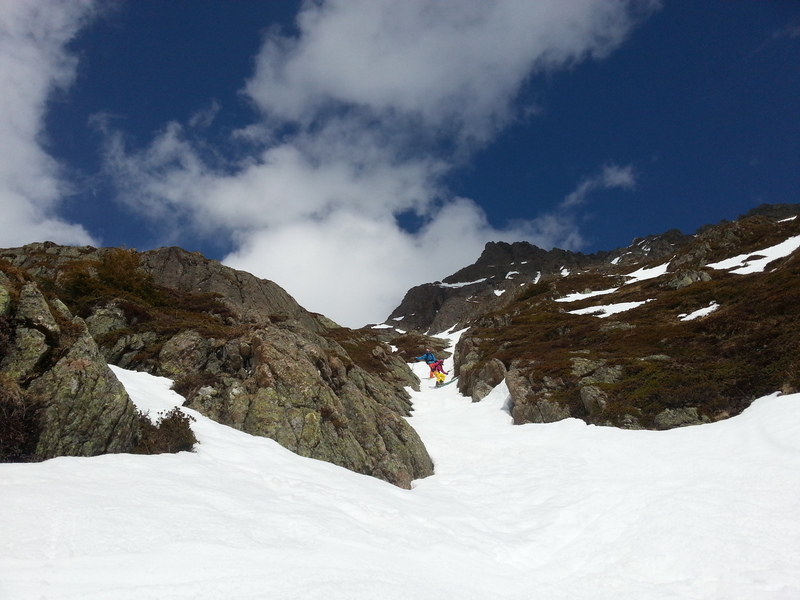 Well maybe! 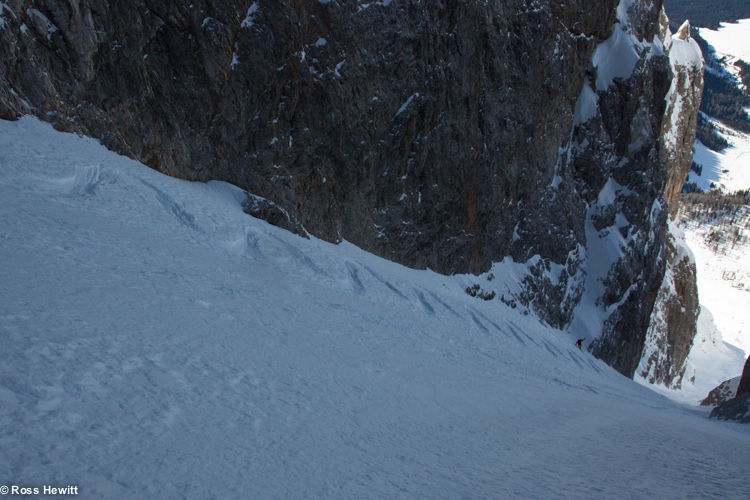 Arriving at Passo Rolle we set of for the Burreloni Couloir and at this point I found the plan was to climb the line rather than ski to the top. 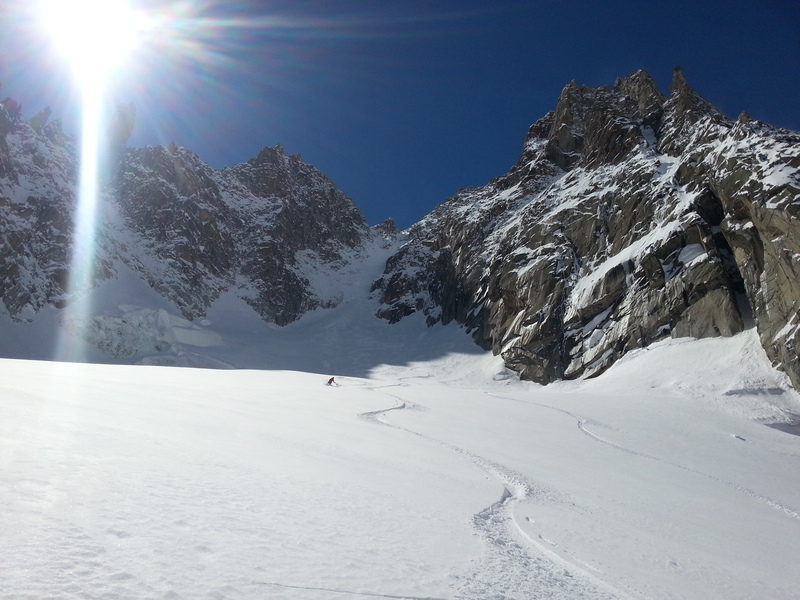 I’d left the spanking paddles at home and with so much snow about I didnt have much hope of success which was fine as my body was tired and sore and it was nice just to be in the sunshine discovering a new place. 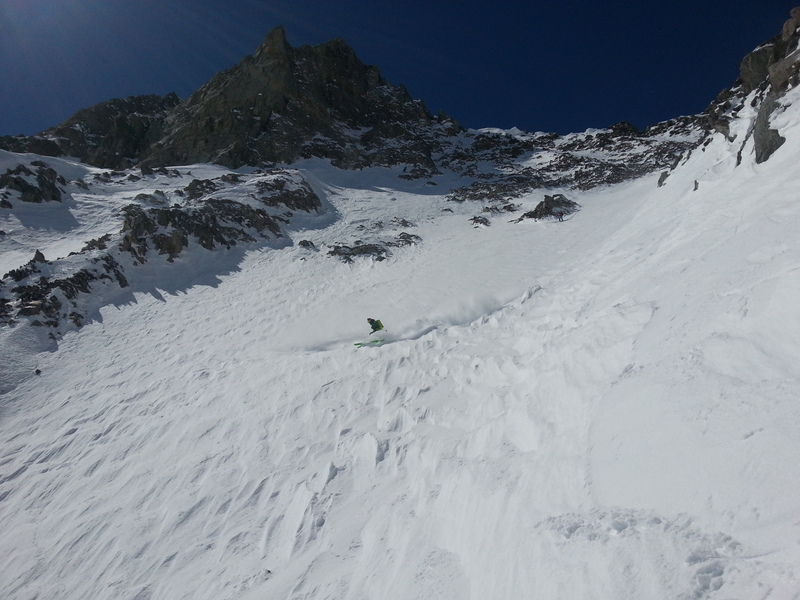 As we entered the cirque, the slide path of a Cat 5 avalanche triggered in the hot afternoon sun the day before confirmed how much snow was about. 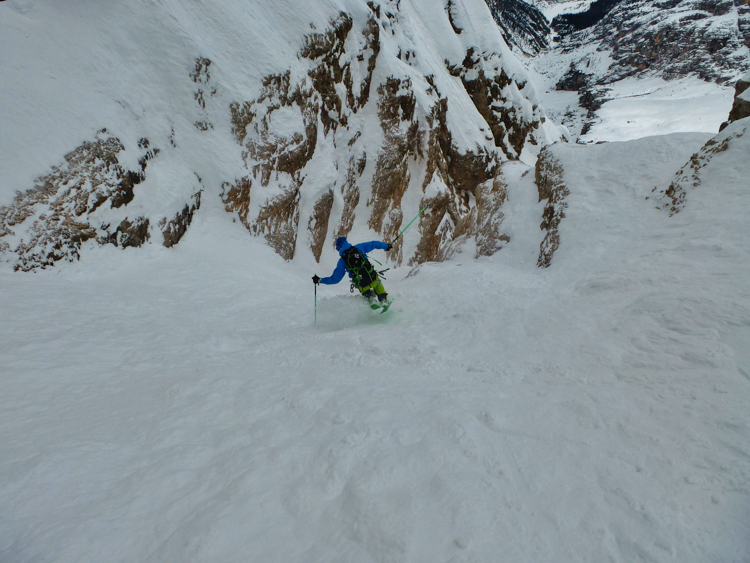 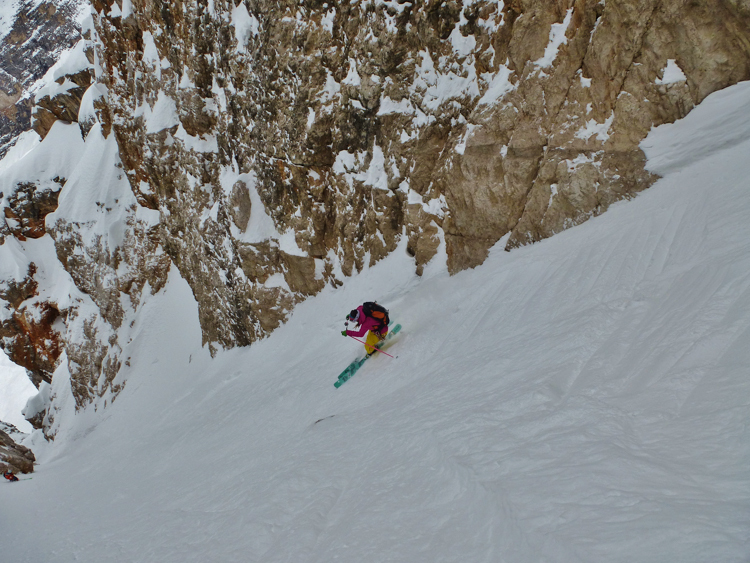 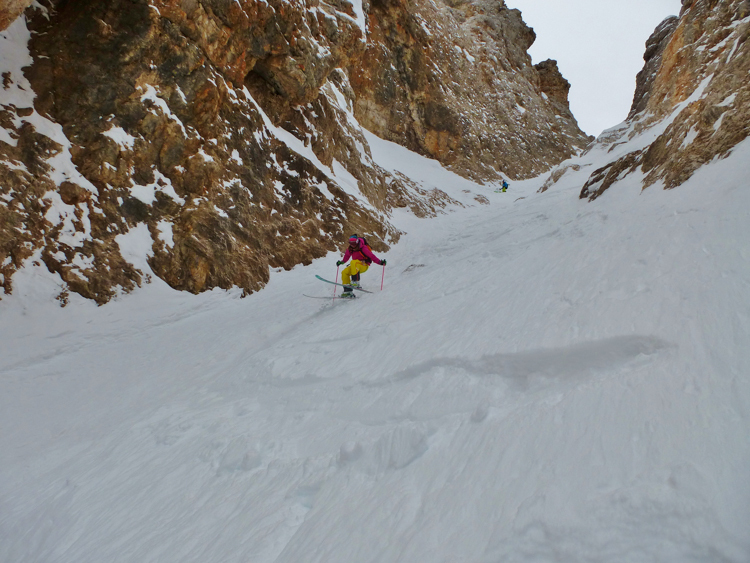 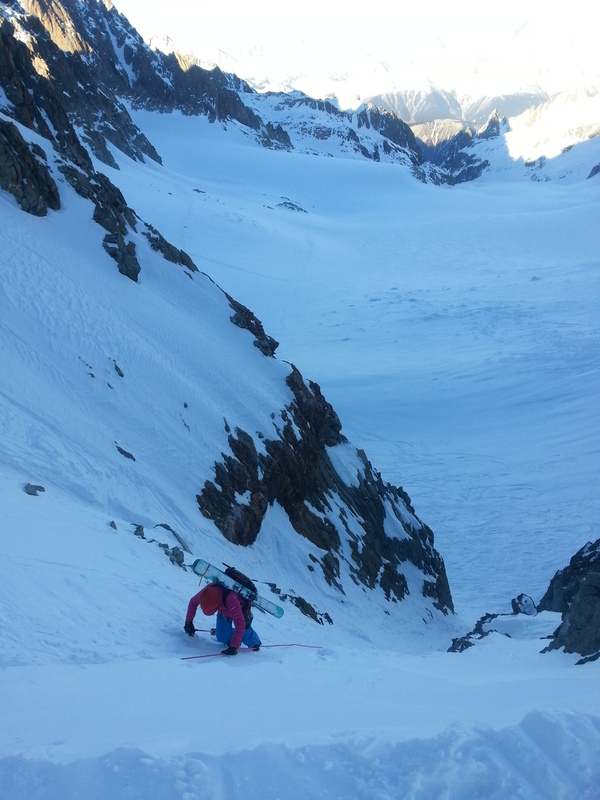 We skinned up towards the couloir and started the monumental task of swimming up the couloir. 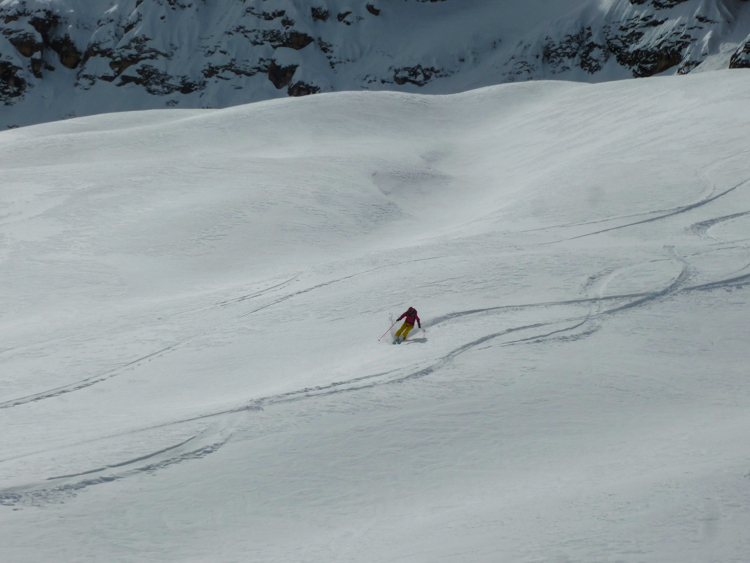 The ski down held super sluffy powder on the left bank and it was a real pleasure skiing with the snow running all around – we havent had much of that this season. 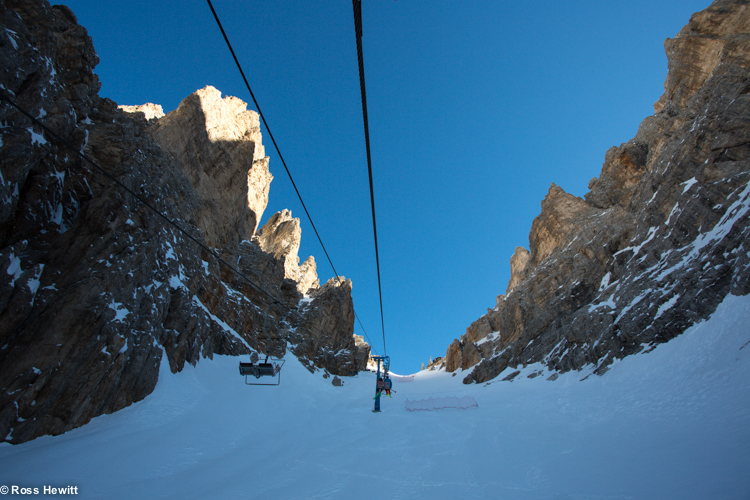 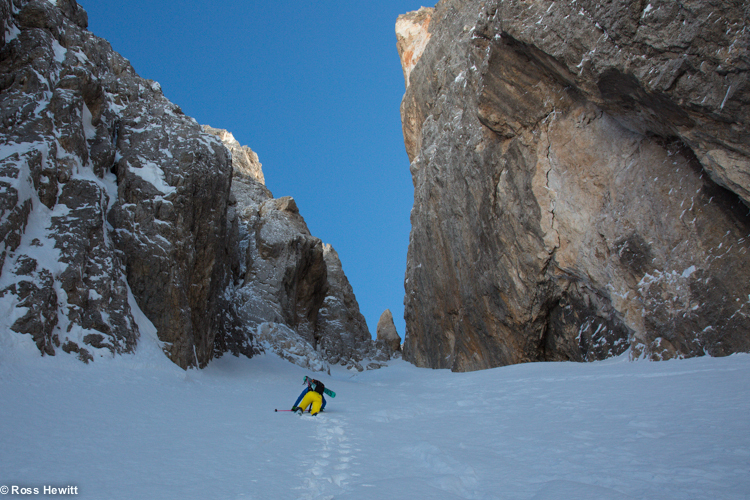 Those Dolomiti lines really are ancient hallways gouged through the big walls, very Baffinesk. 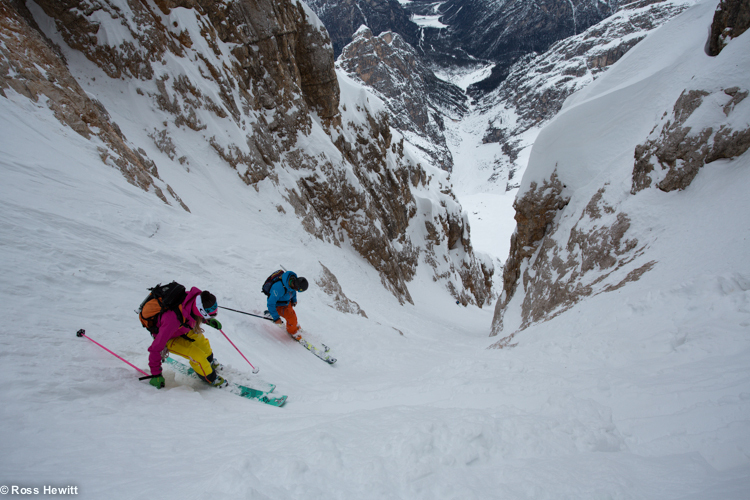 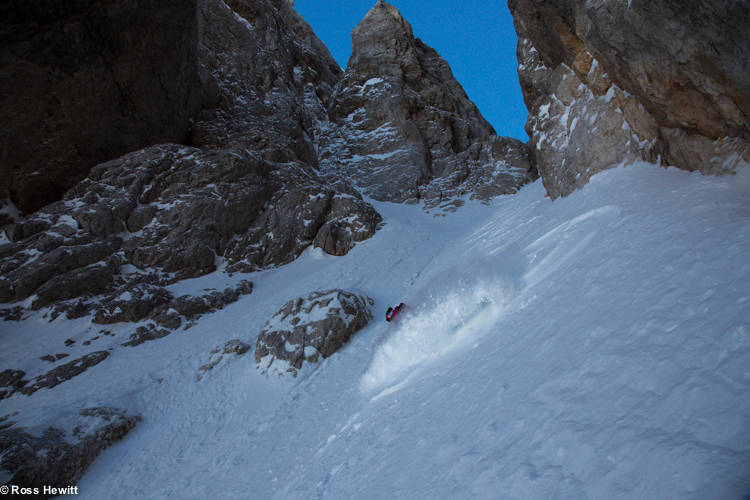 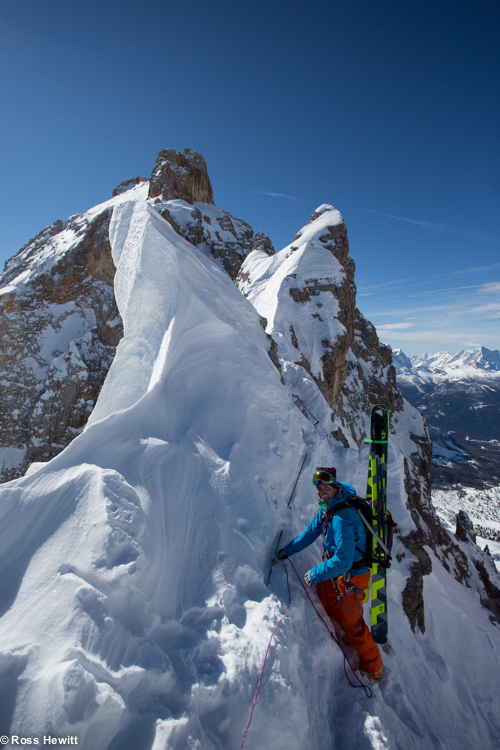 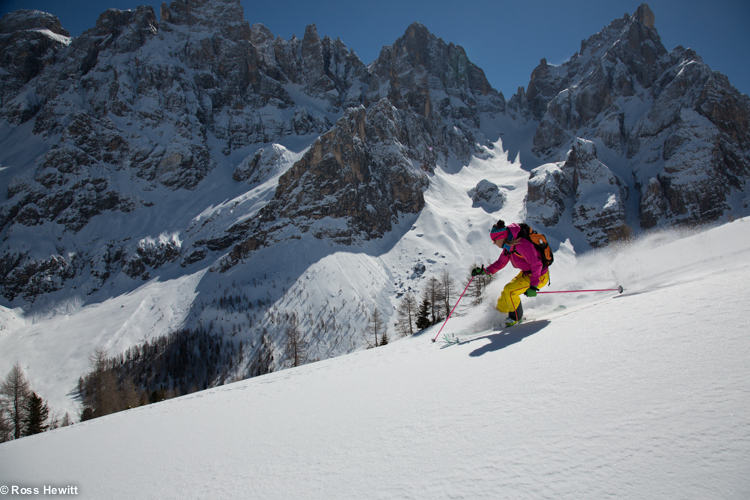 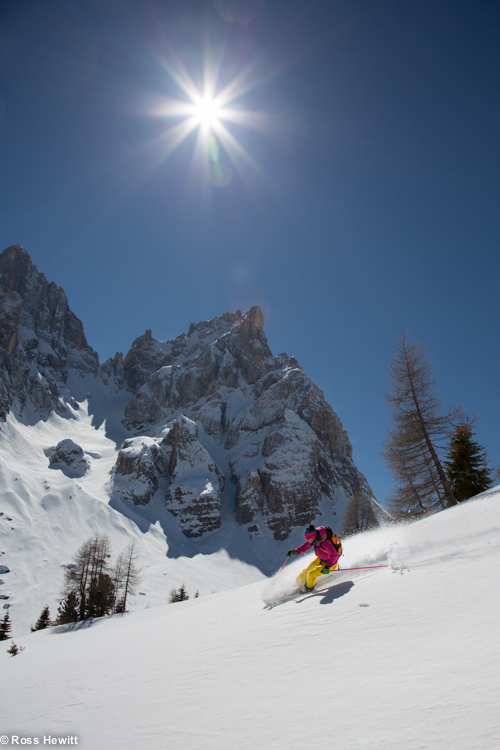 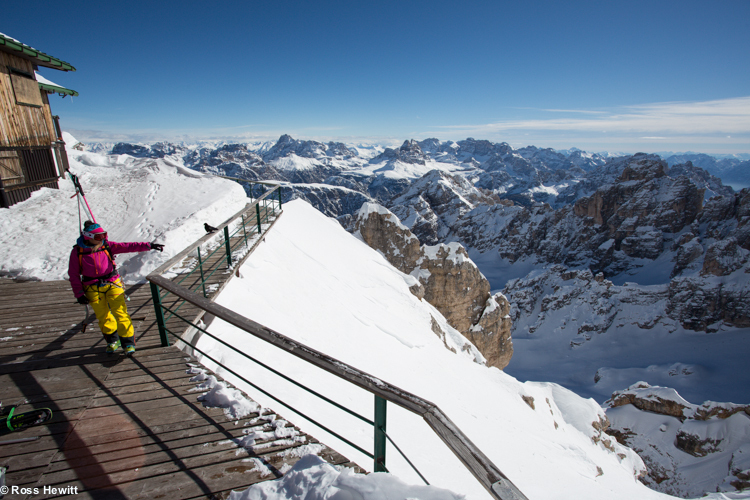 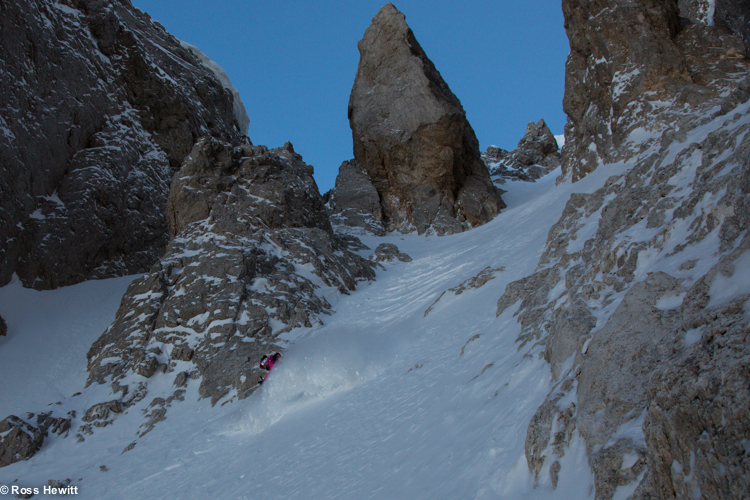 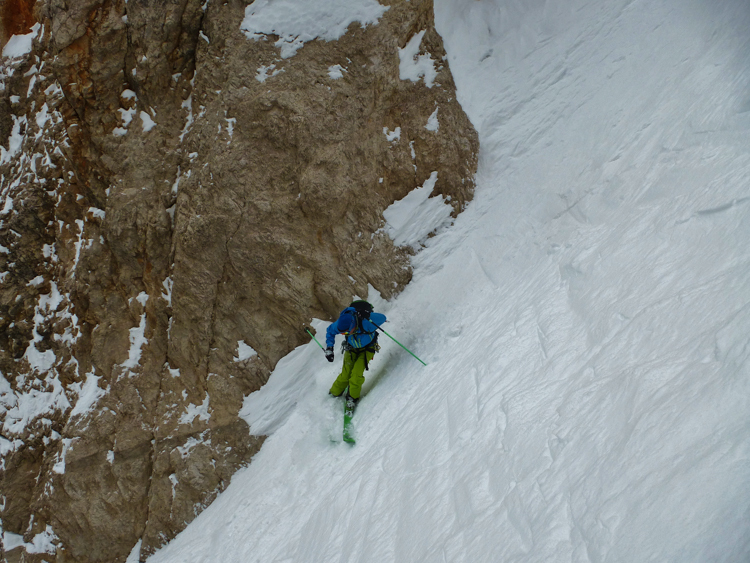 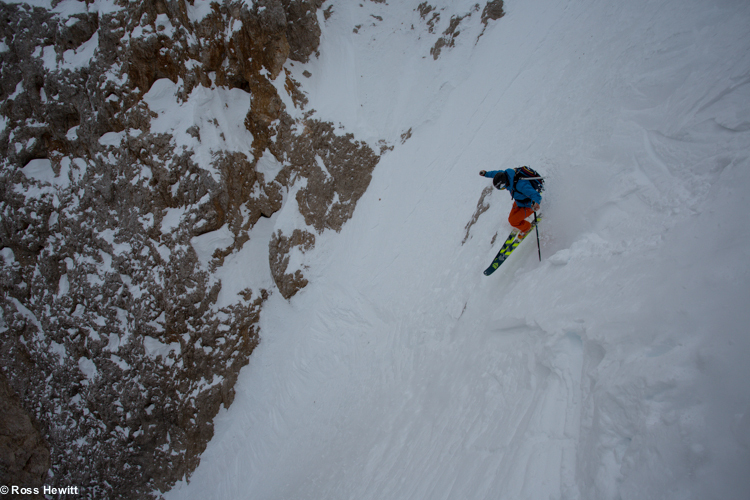 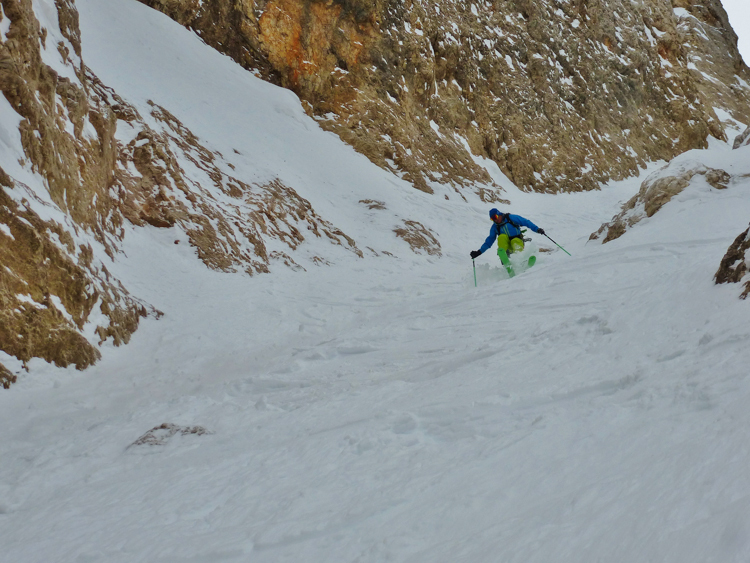 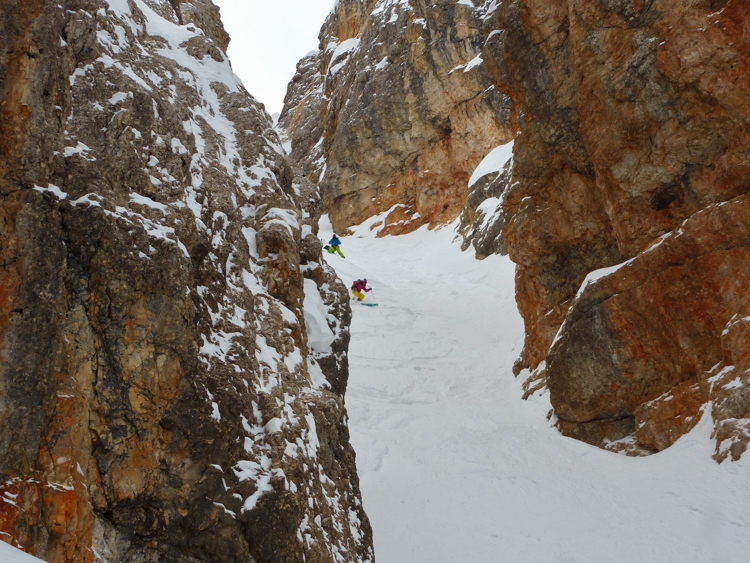 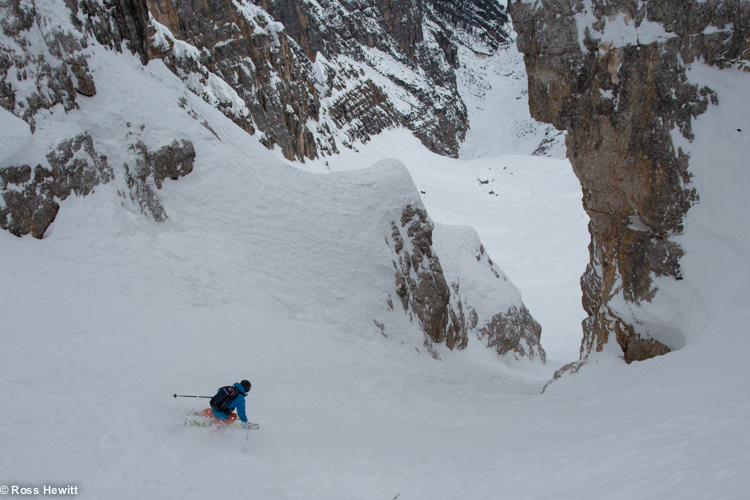 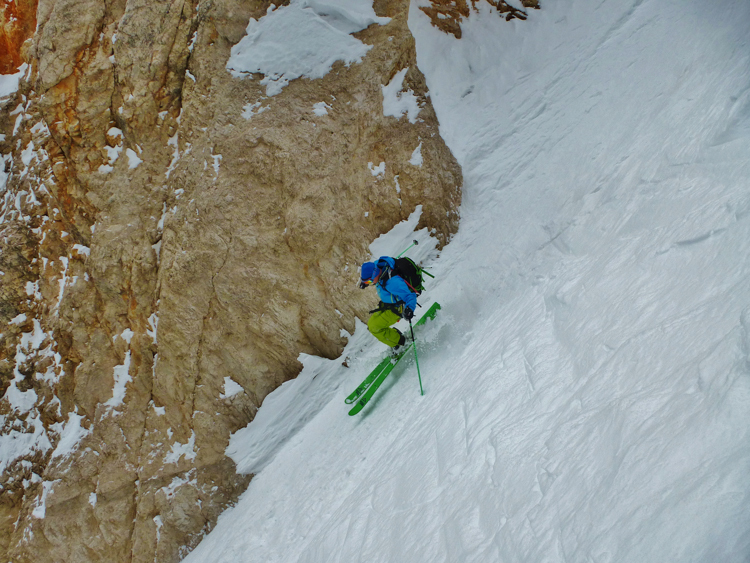 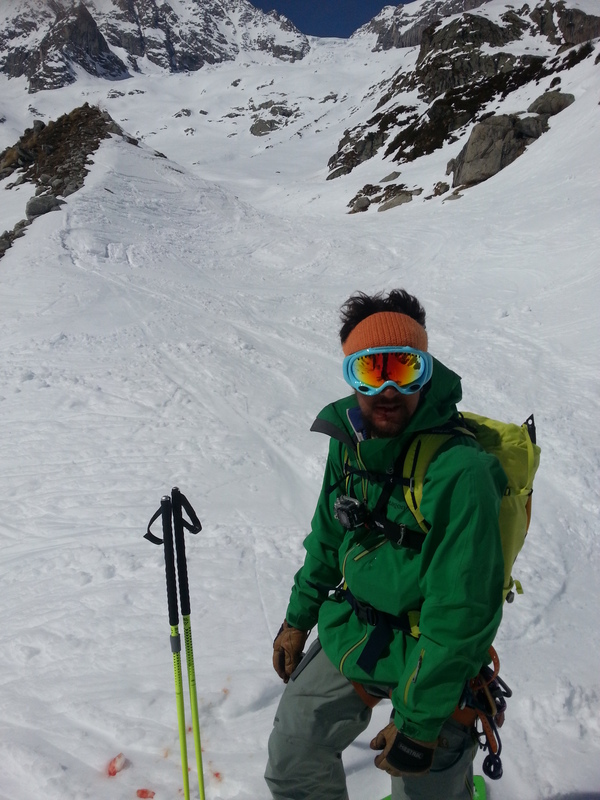 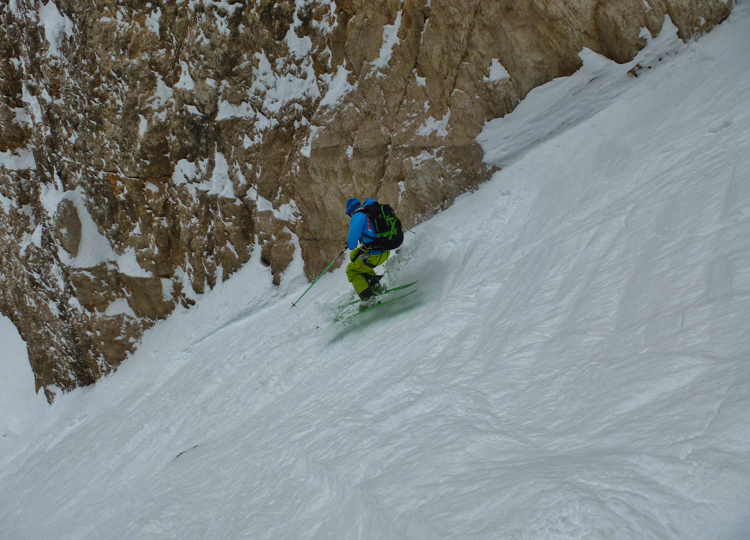 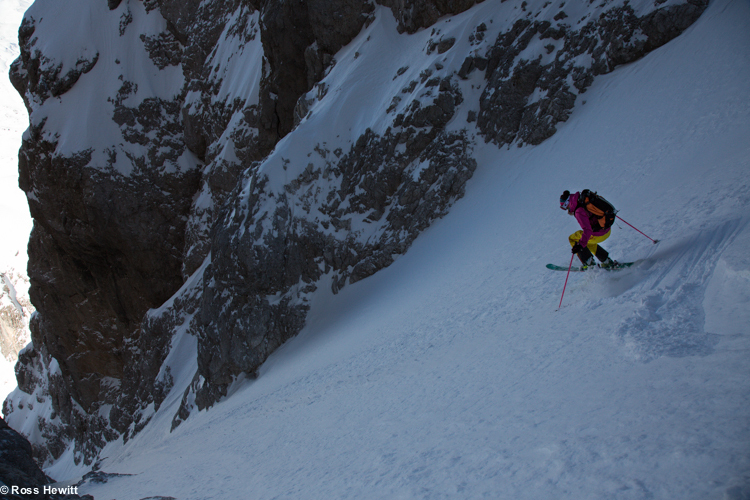 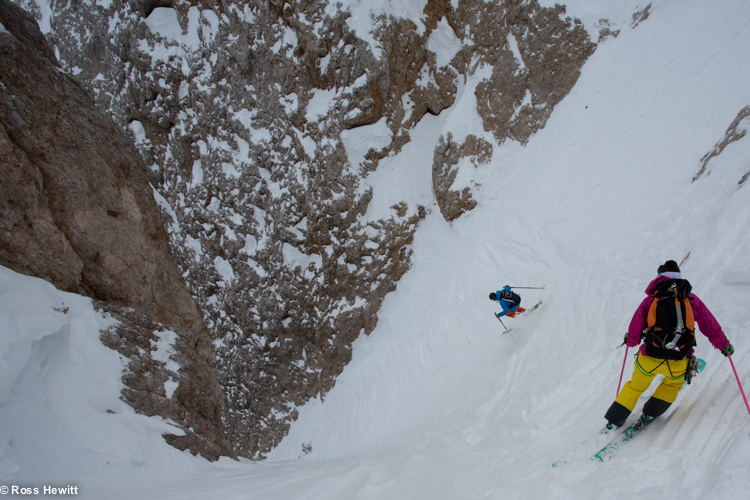 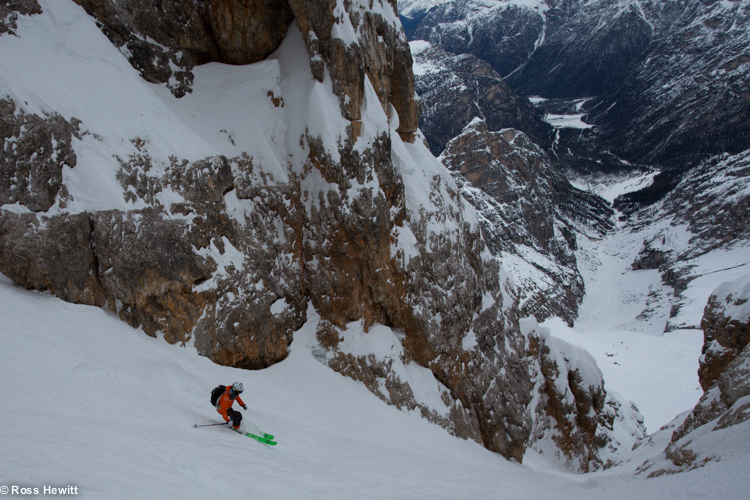 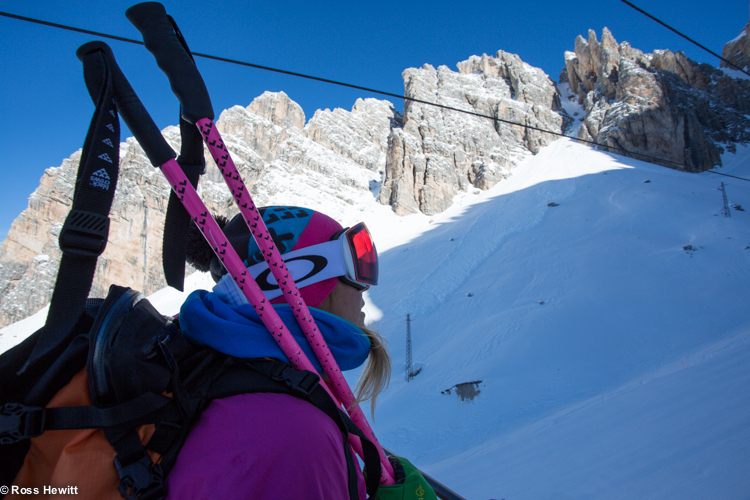 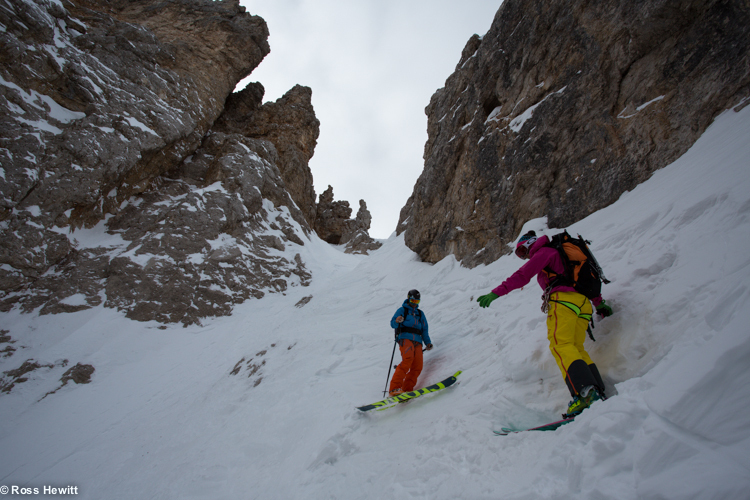 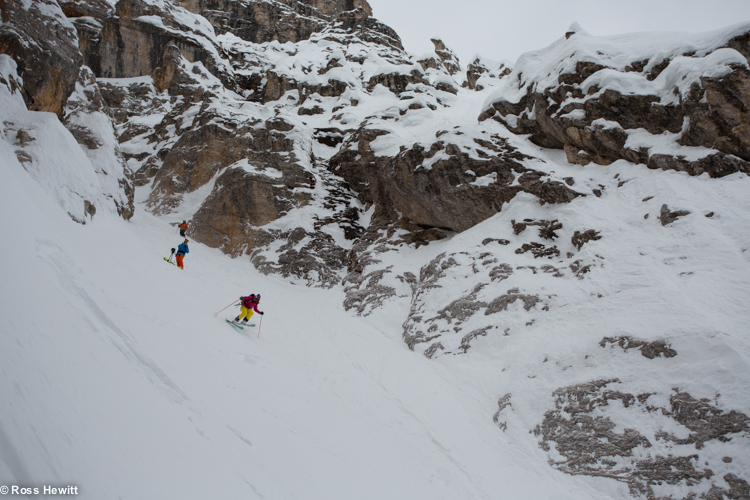 Next day Domolmiti Guides Tommasco Cardelli and Cristian Dallapozza joined us to ski on the Cristallo. 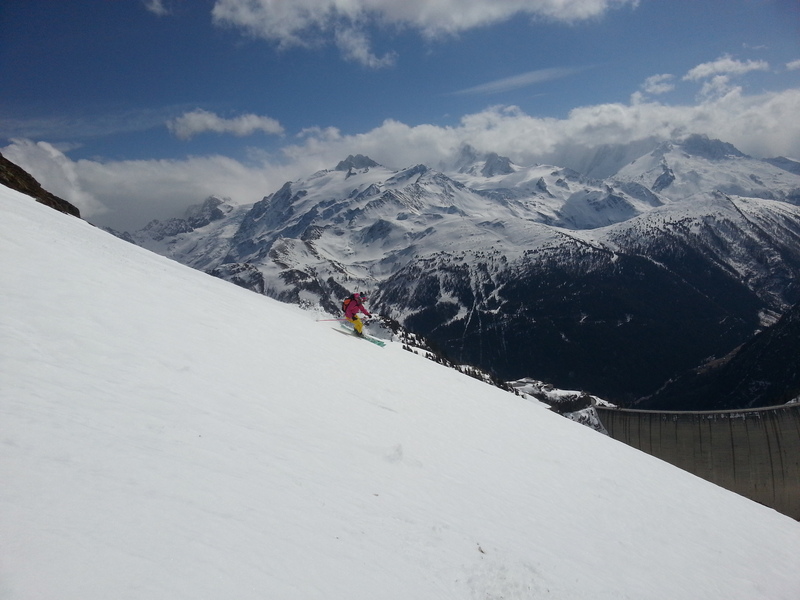 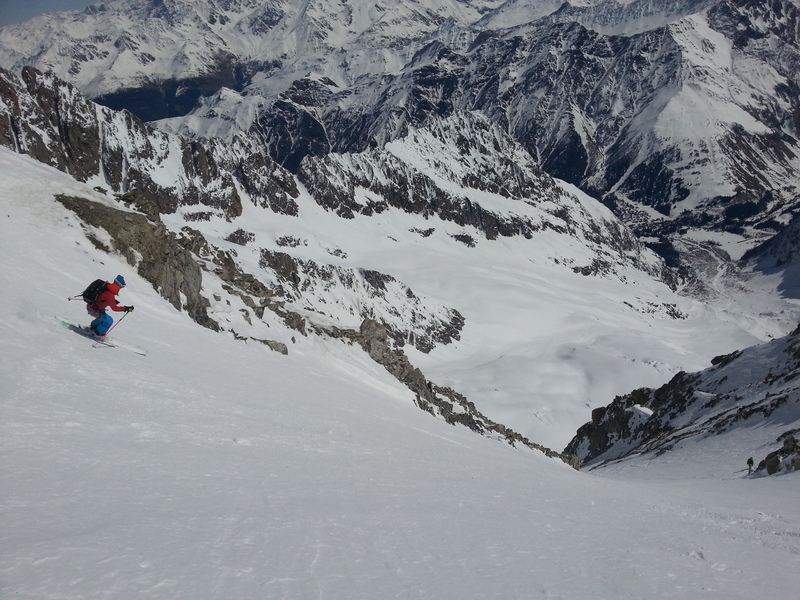 Conditons were perfect with no wind so we decided to climb along the ridge and ski the Vallencant. 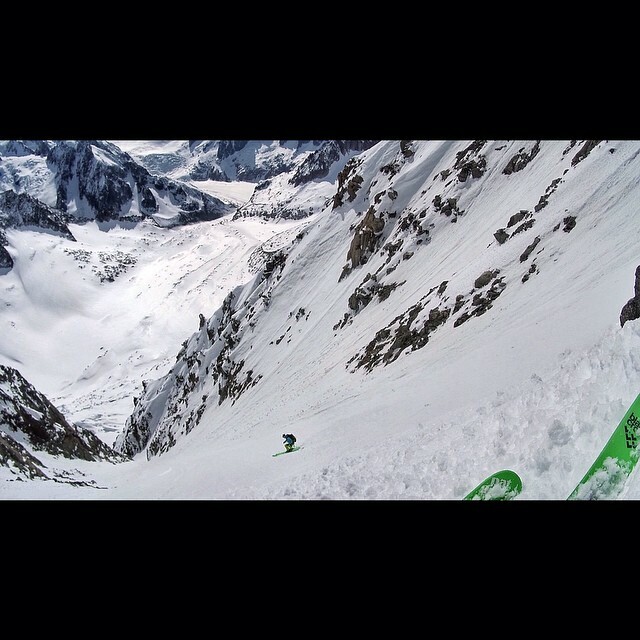 I’ve been wanting to ski this one for about 20 years so it was great to finally go. 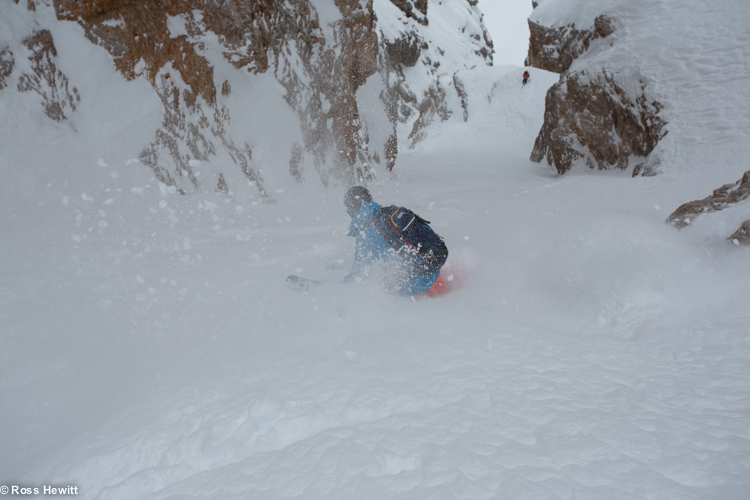 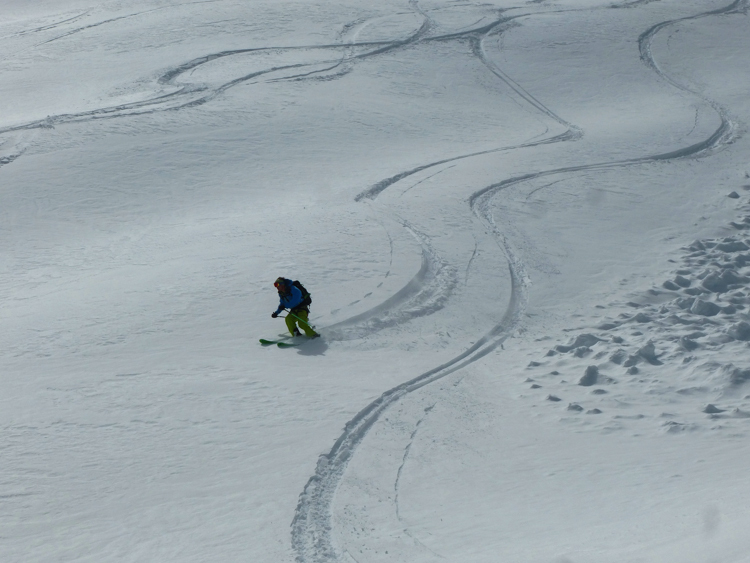 After a firmer top section we hit the pow and the fun started. 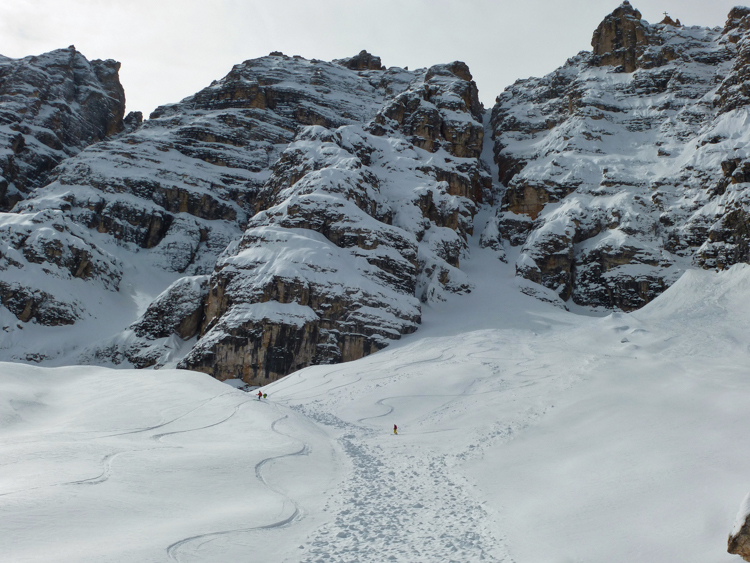 In the afternoon we skied the beautiful Bus Tofane under the big walls and finished the day with a well earned beer and Pizza. 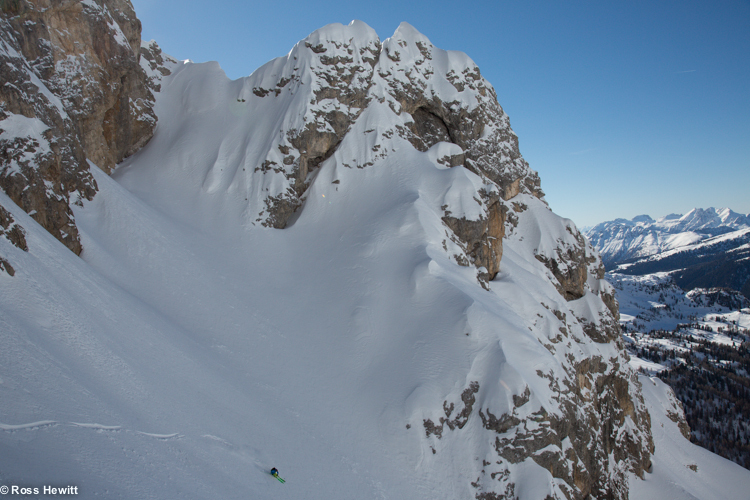 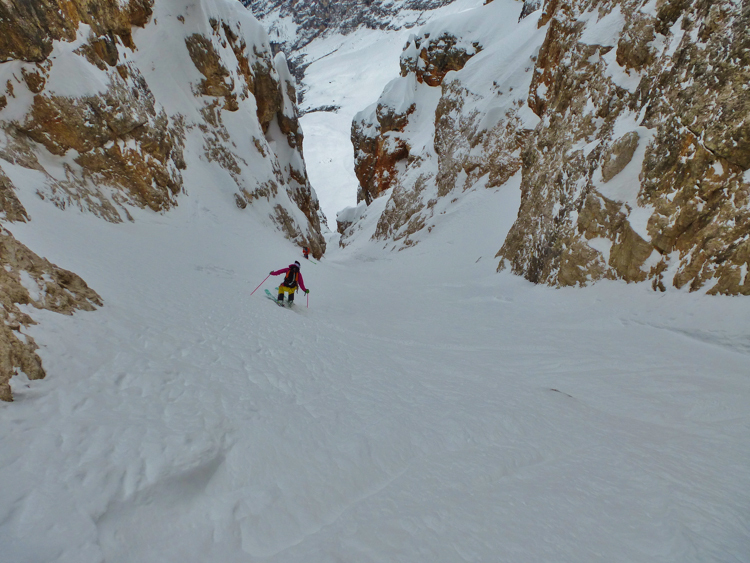 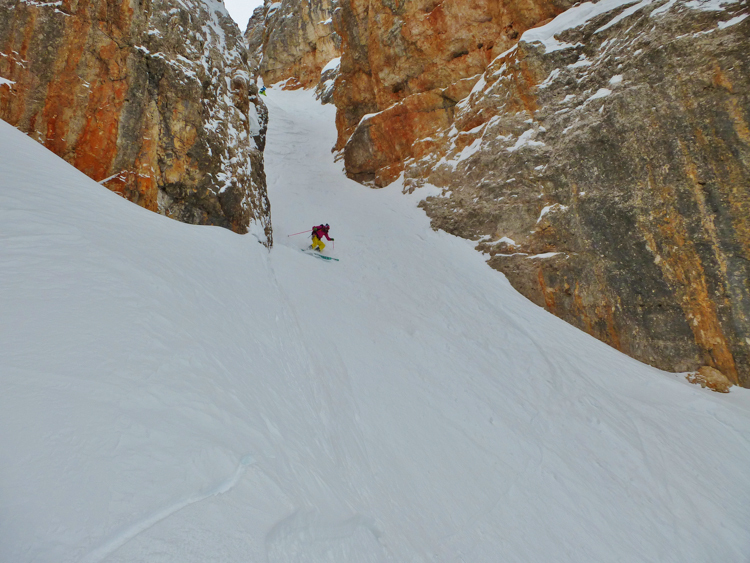 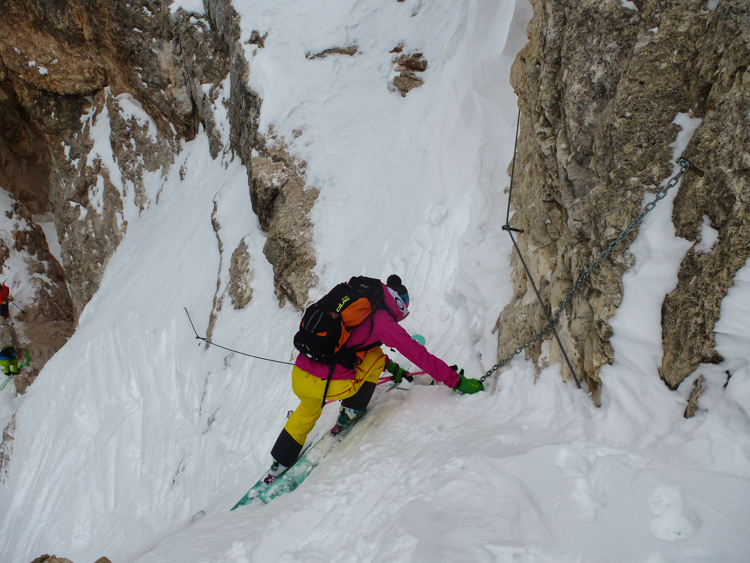 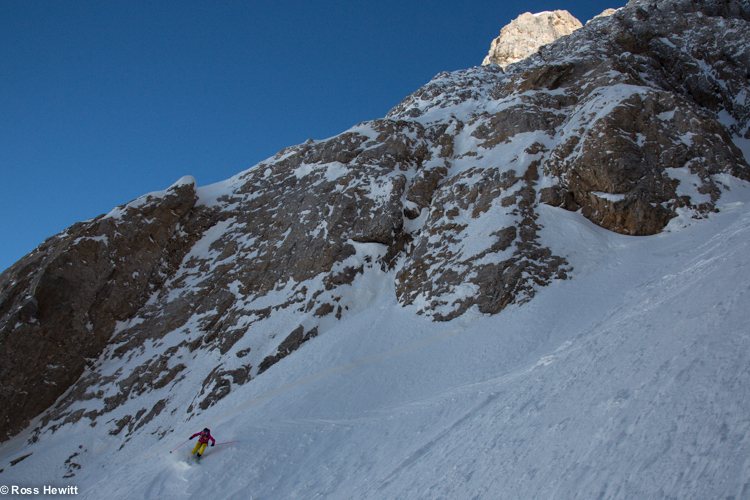 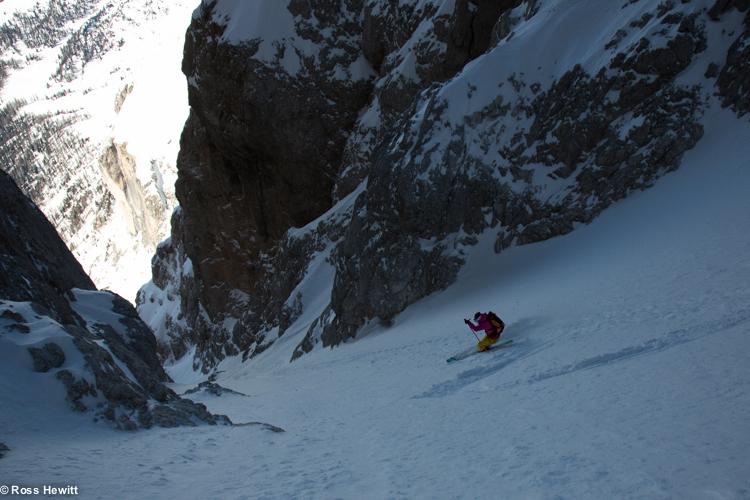 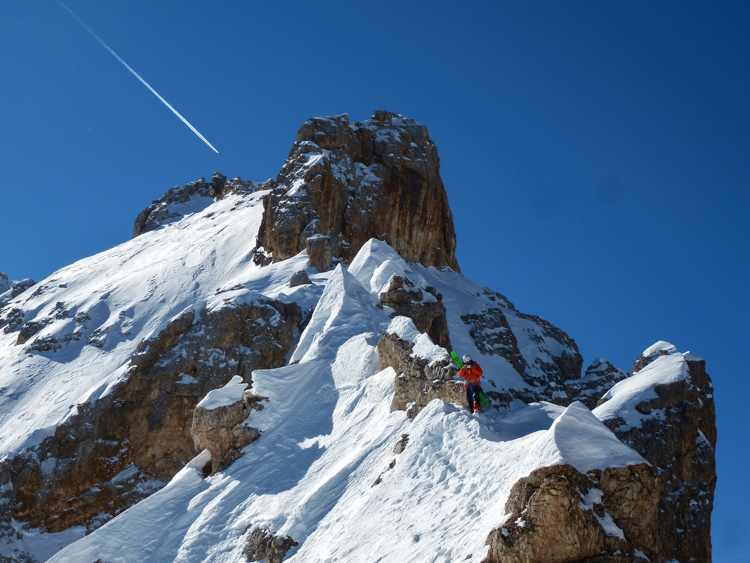 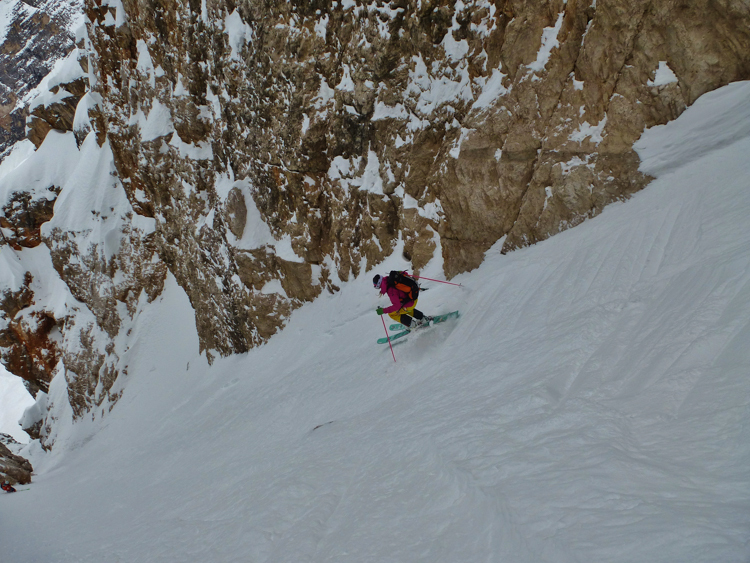 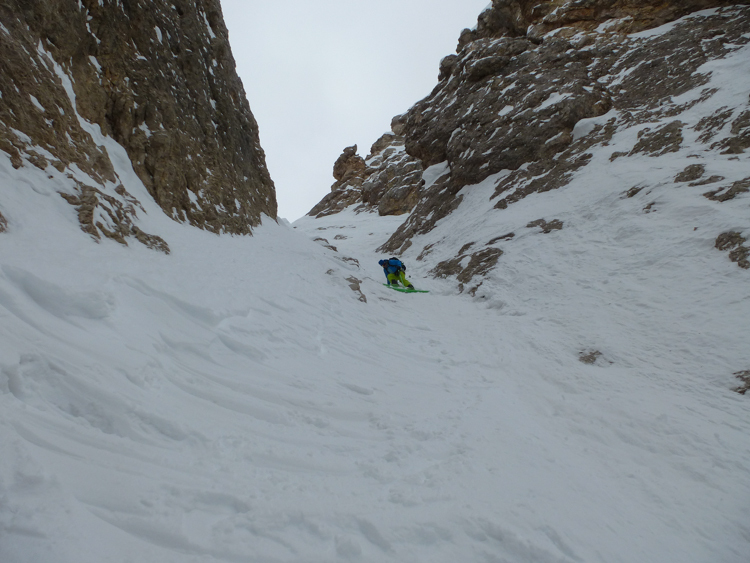 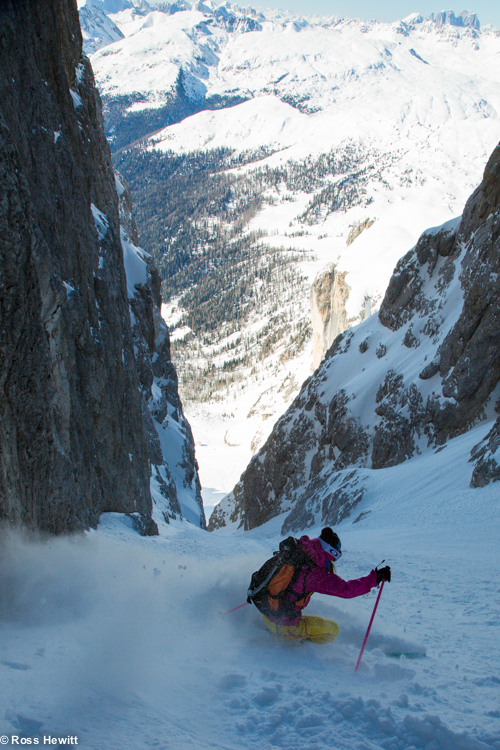 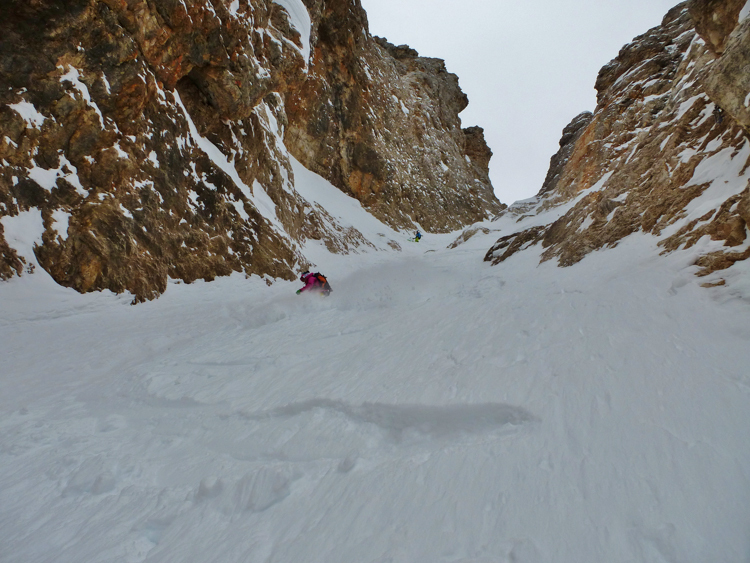 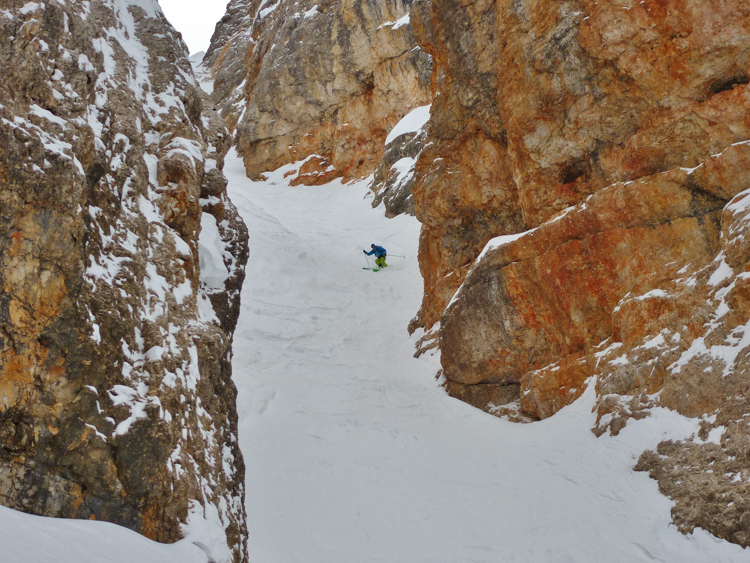 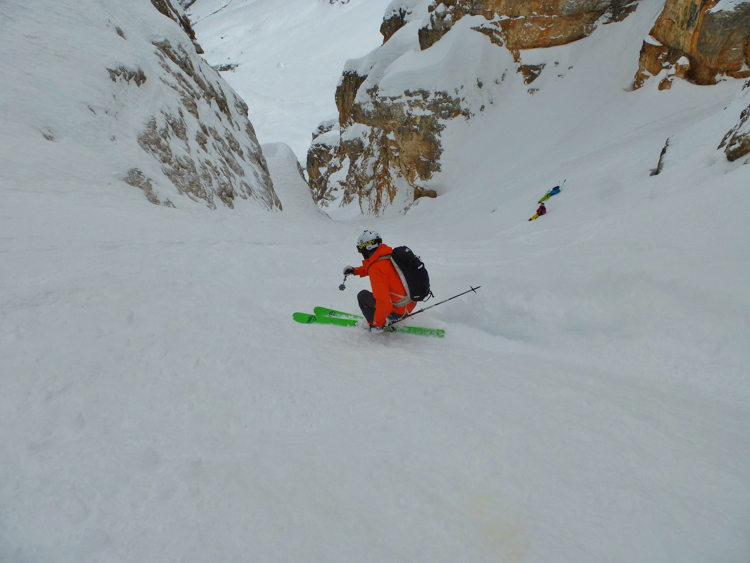 Our last day out was on the Marmolada where we skied some complex line avoiding limestone slabs down the North West Face. 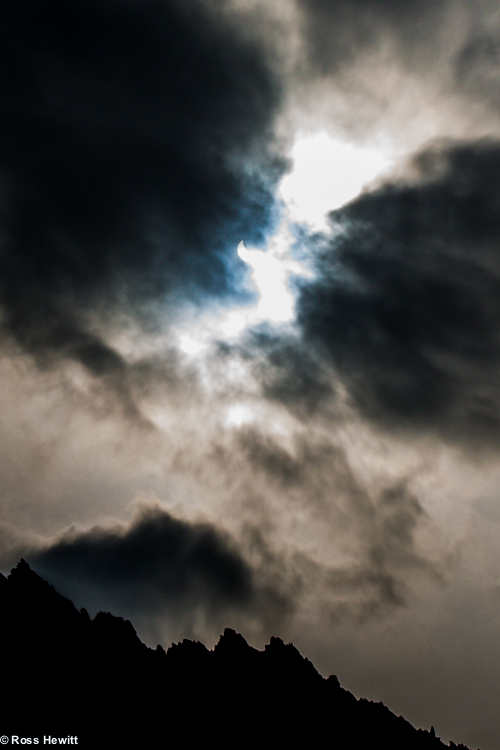 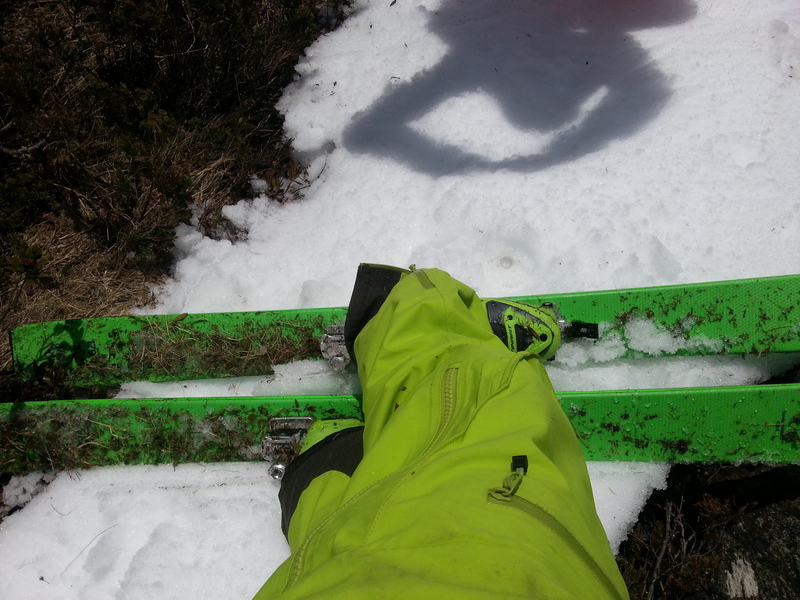 It was a real Cairngorm howler of a day with low vis so I didnt bother taking a camera. 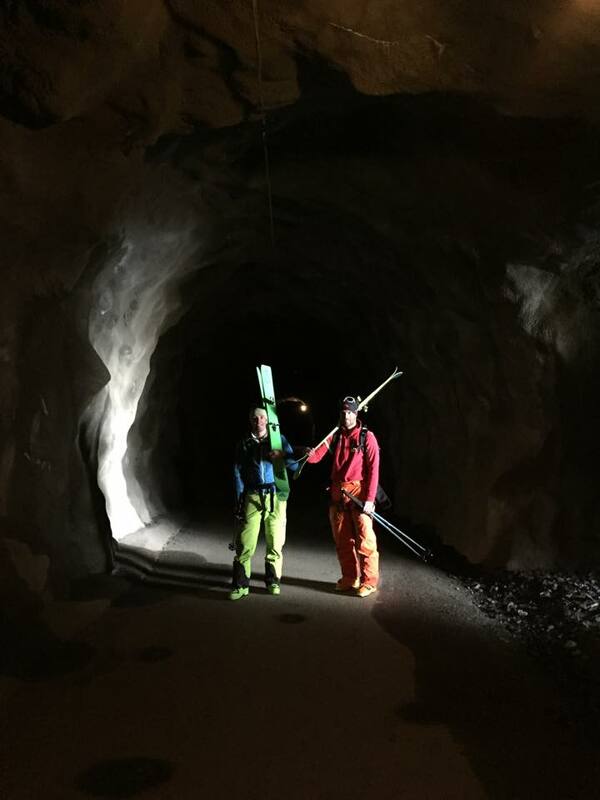 A big thanks to Minna for doing all the driving, to Tommi for letting me stay and to both Tommi and Cristian for showing us some great stuff. 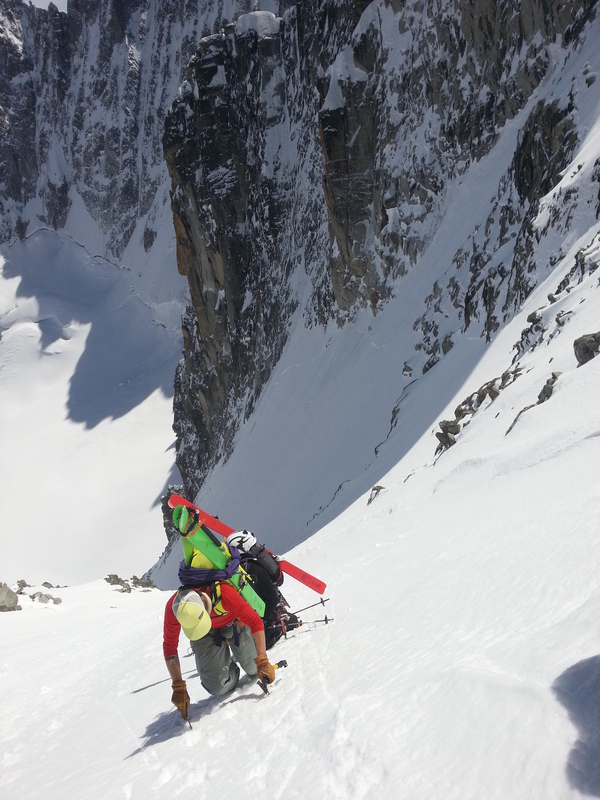 Corn harvesting on Bel Oiseau south west couloir from the summit to the dam with Minna Riihimaki and Tommasco Cardelli. 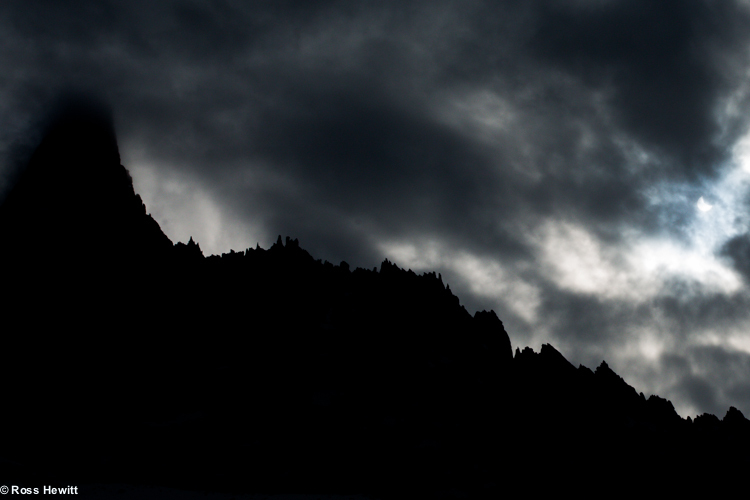 The day got weird near the end. 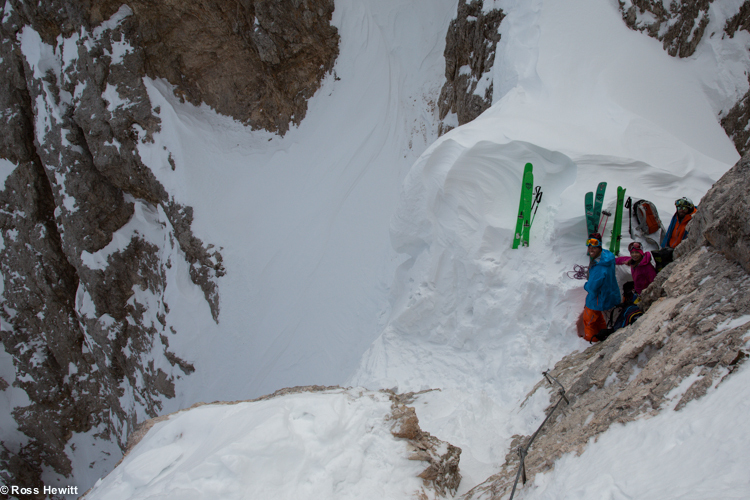 Getting the angle on the line to see if there’s enough snow. 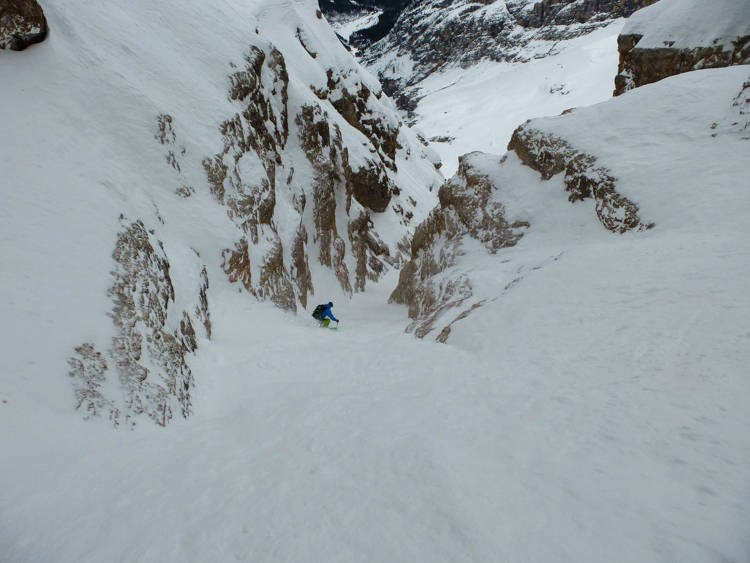 Complicated terrain below, looking for the deepest gully that will have snow. 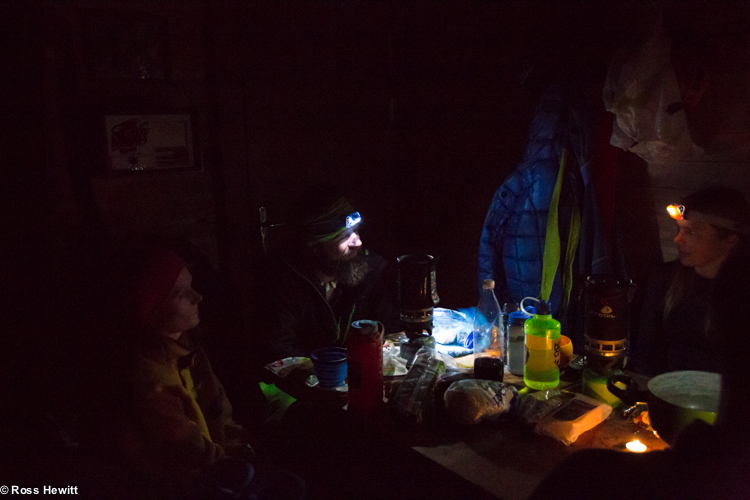 Guides training coming in useful! 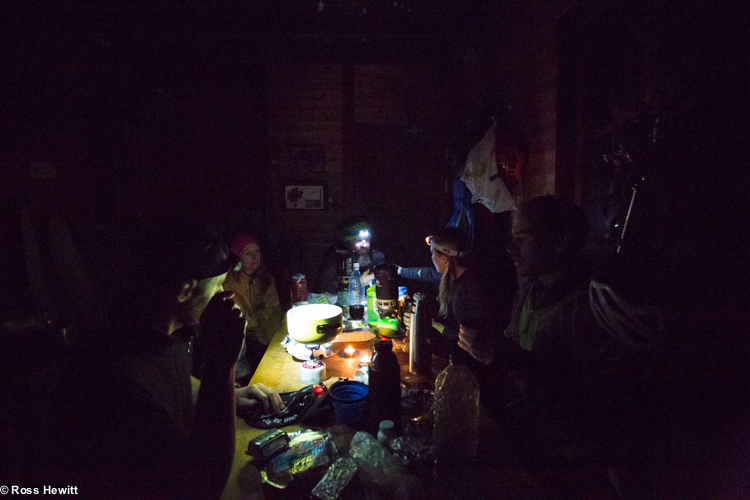 A long walk in the dark with only a phone as a torch. 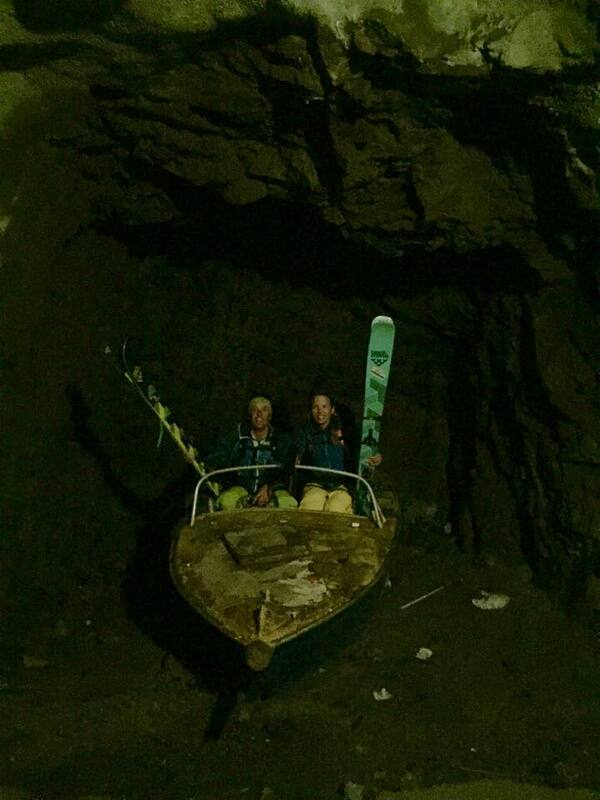 We found some strange things. 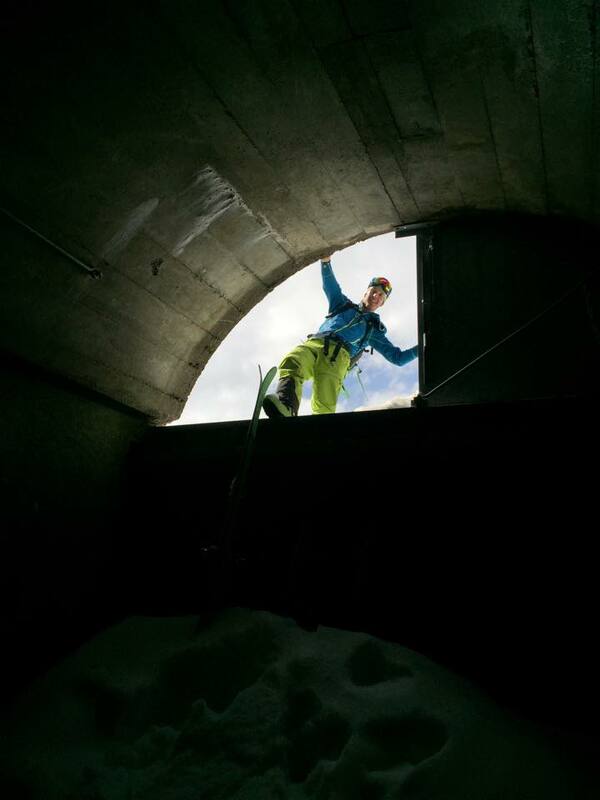 Before Tommi opened the door to freedom we were climbing this ladder in the pitch dark trying to hold our only source of light, a phone! 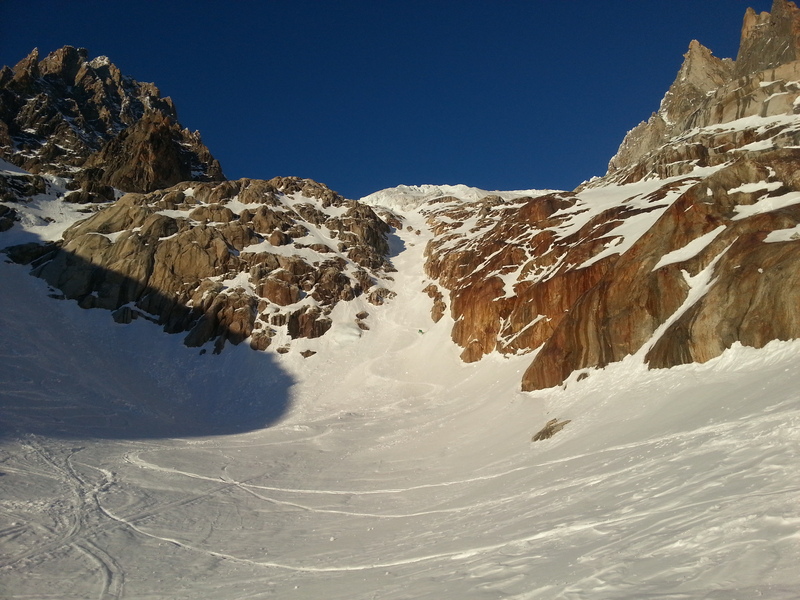 Its always a pleasure to travel under the North Wall of the Argentiere Glacier and study the big ski lines and dream about the few hours they might be in condition in April or May. 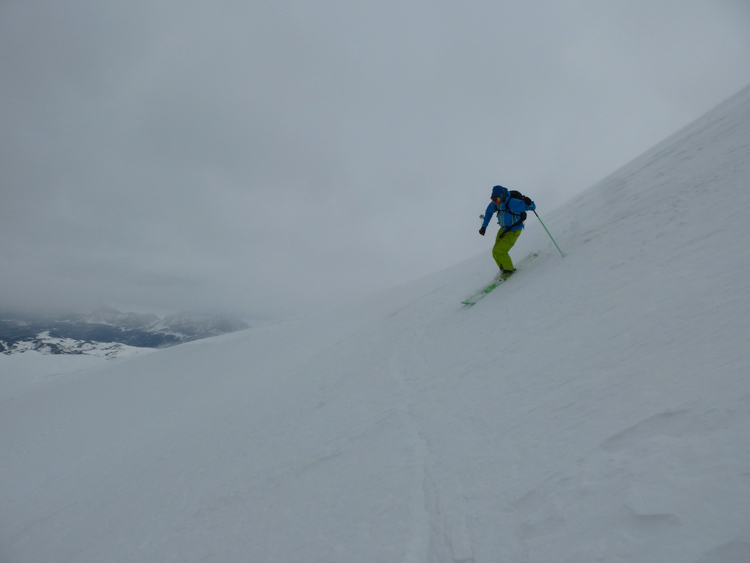 We hoped to ski some of the mid altitude couloirs in the hope they were more sheltered from the wind but in the first I wasn’t able to ski cut the new snow – it would slide a couple of metres then stop, not exactly inspiring confidence. 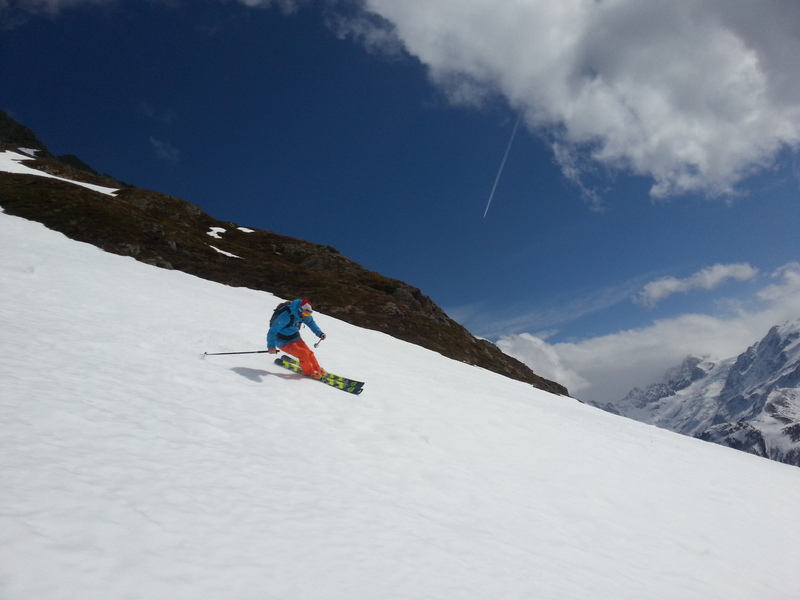 After hanging out at the col and enjoying the surroundings we opted for some meadow skipping back home. 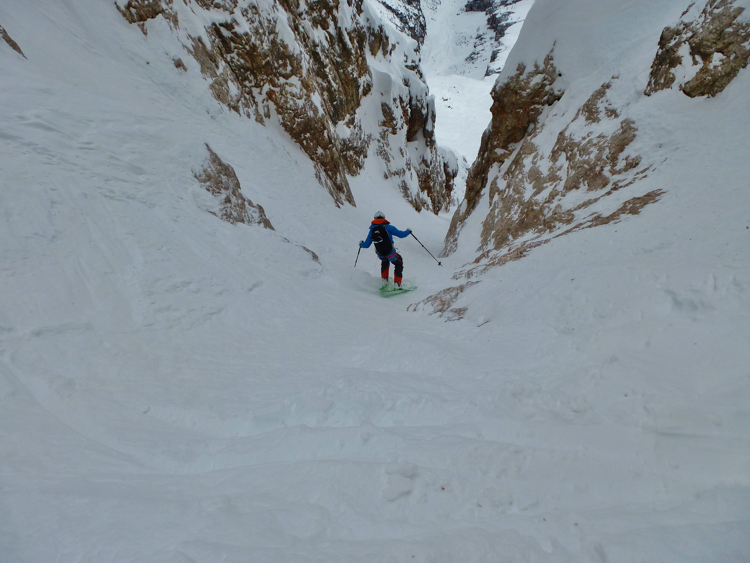 All the North wind we have had has filled in the right hand branch of Y Couloir really well this year and I have been wanting to go there for some time. 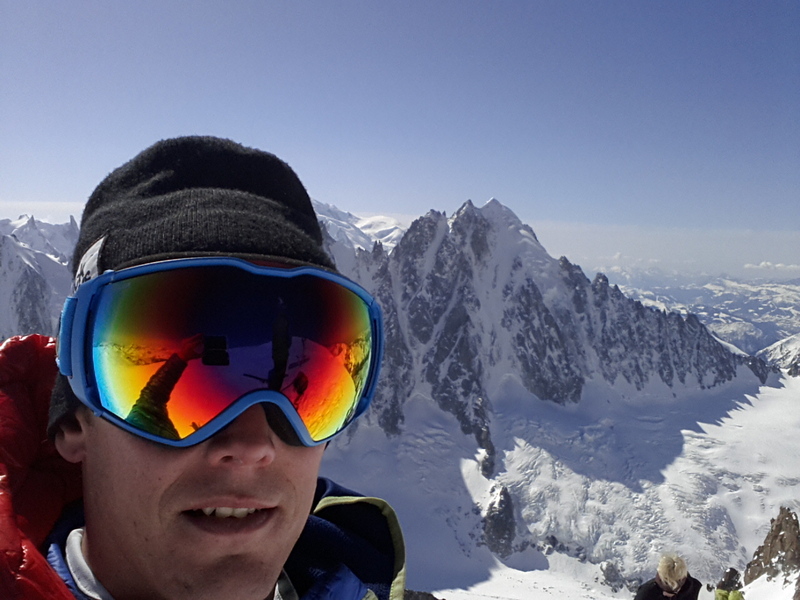 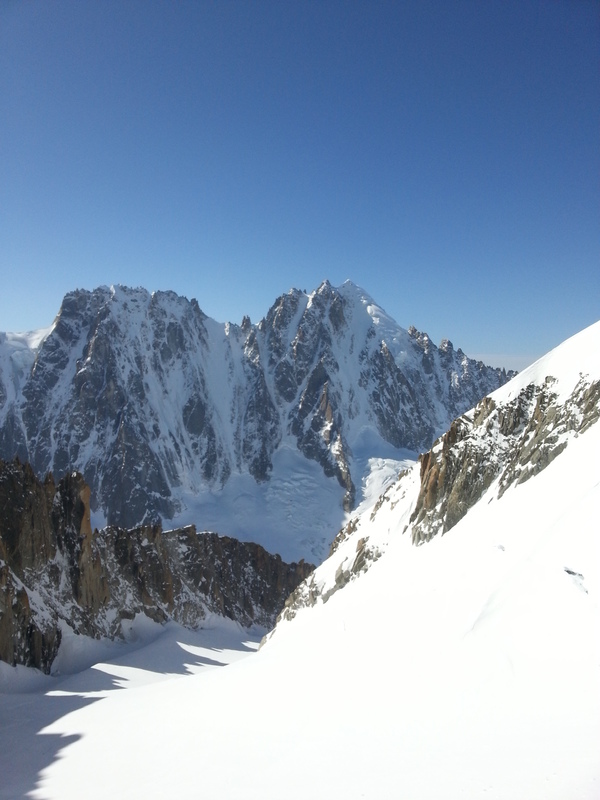 I was weighing up going solo to Croullante or going to the Y but persistent afternoon cloud on the Aiguille du Midi made it an easy decision to go for Y off the first Grands Montets bin. 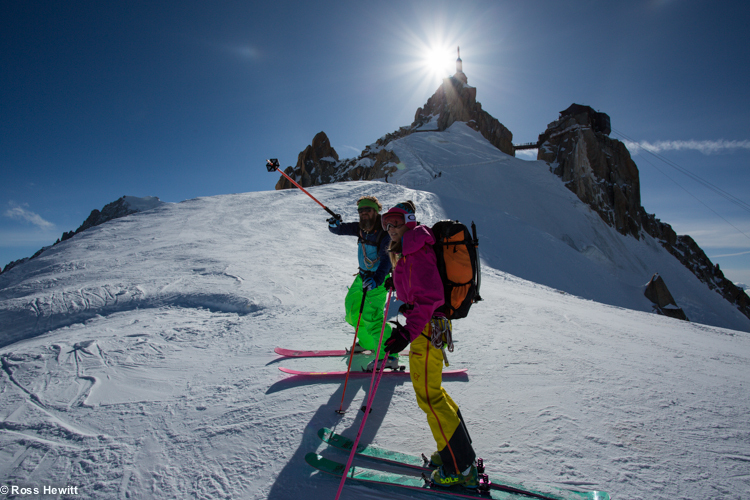 Late in the afternoon my friend Kirsti Lehtimaki from EPIC TV messaged me saying she wanted to ski and had a friend coming too. 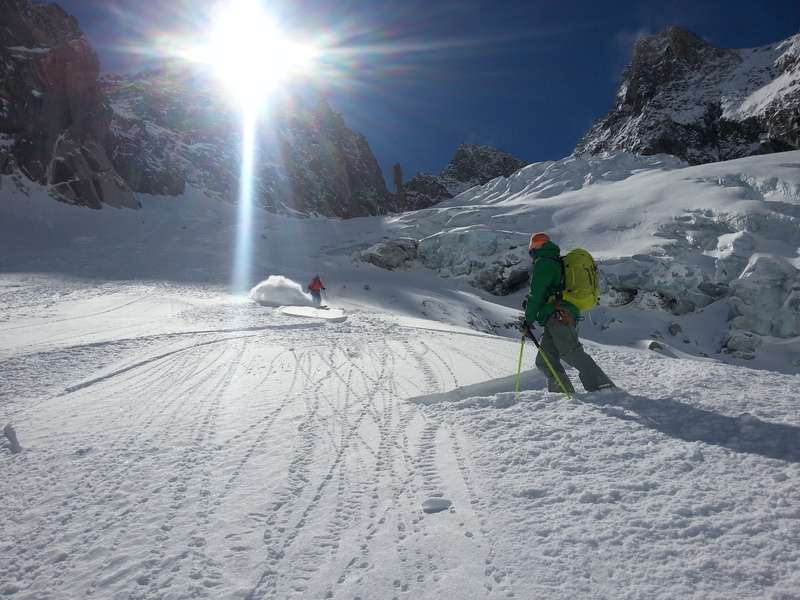 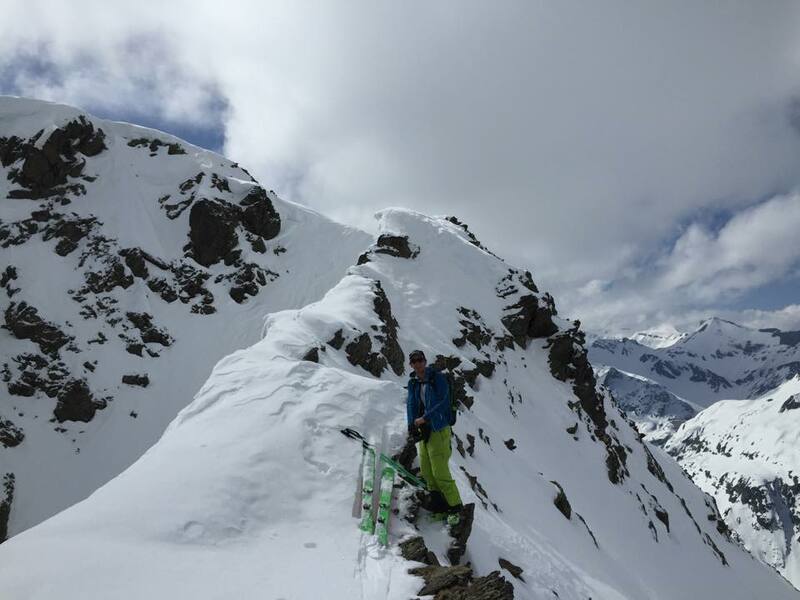 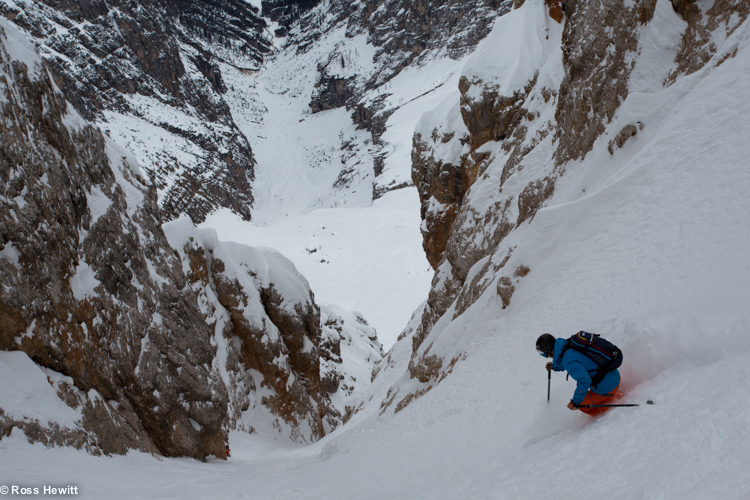 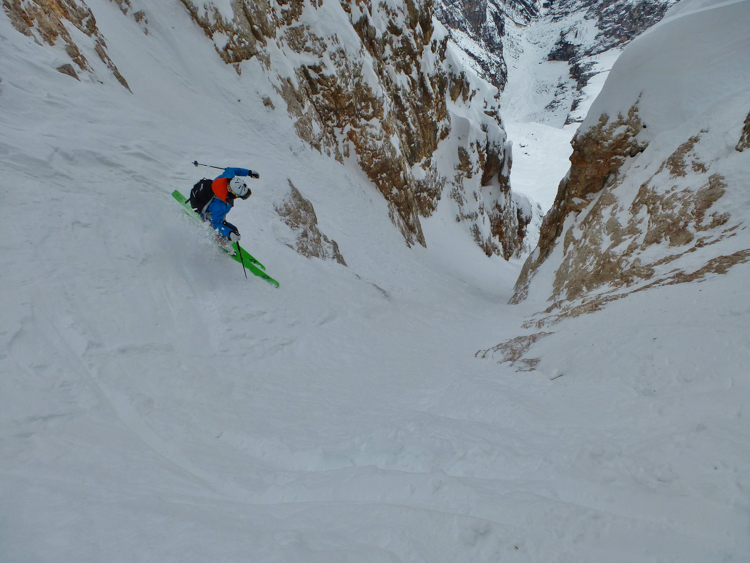 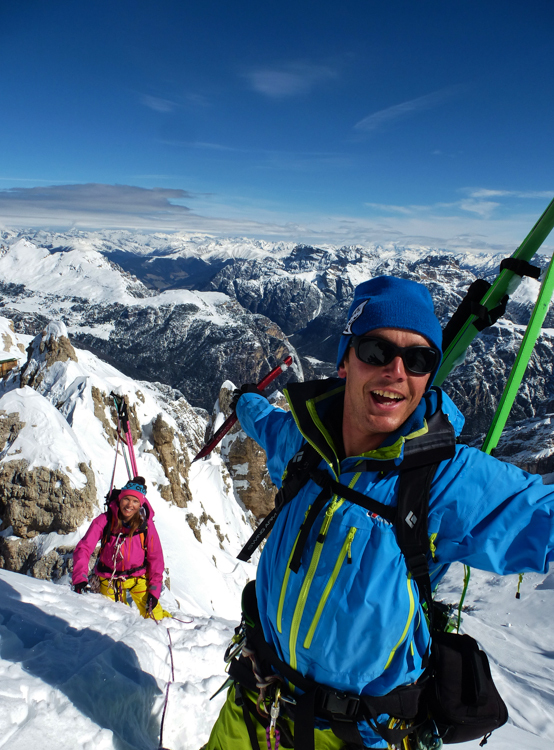 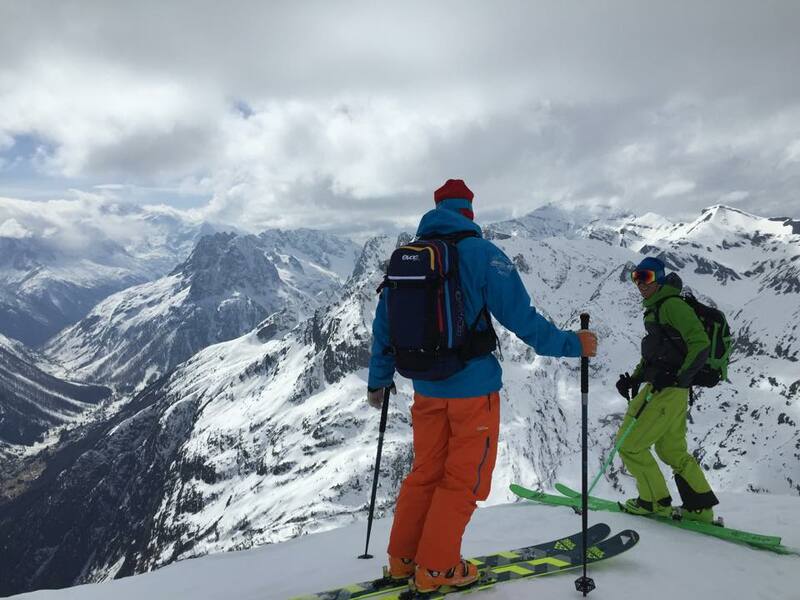 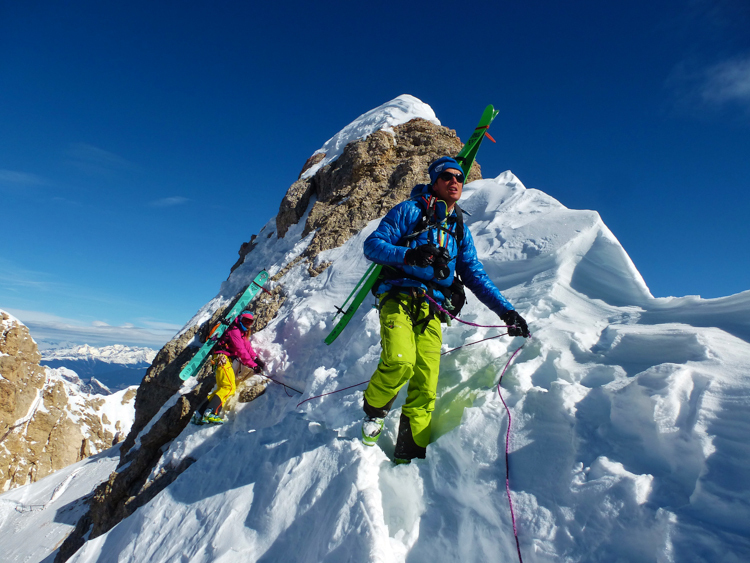 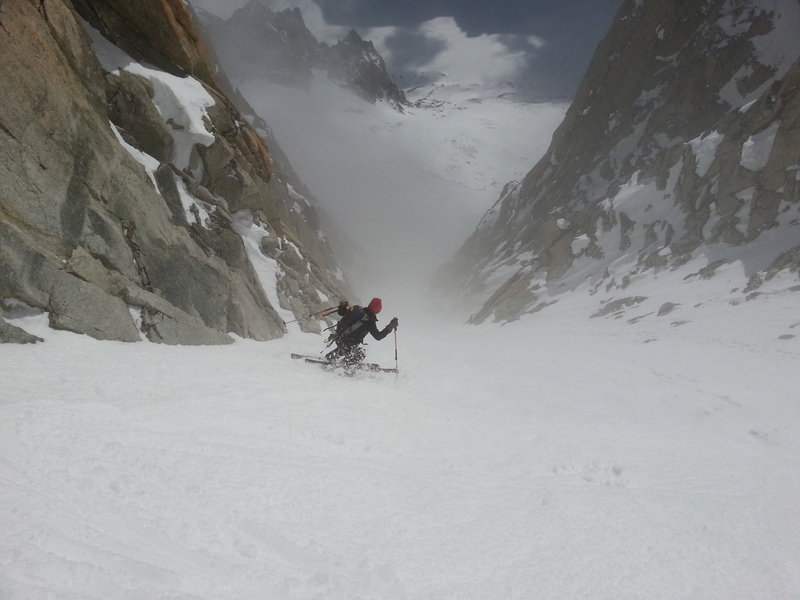 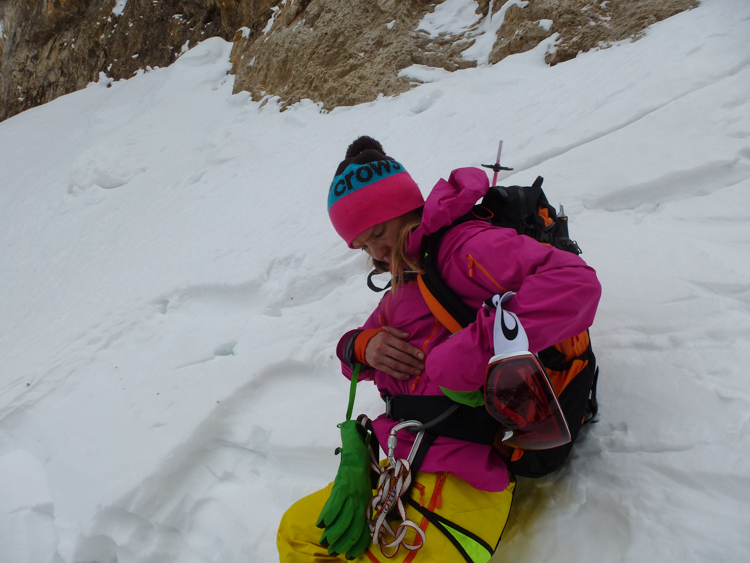 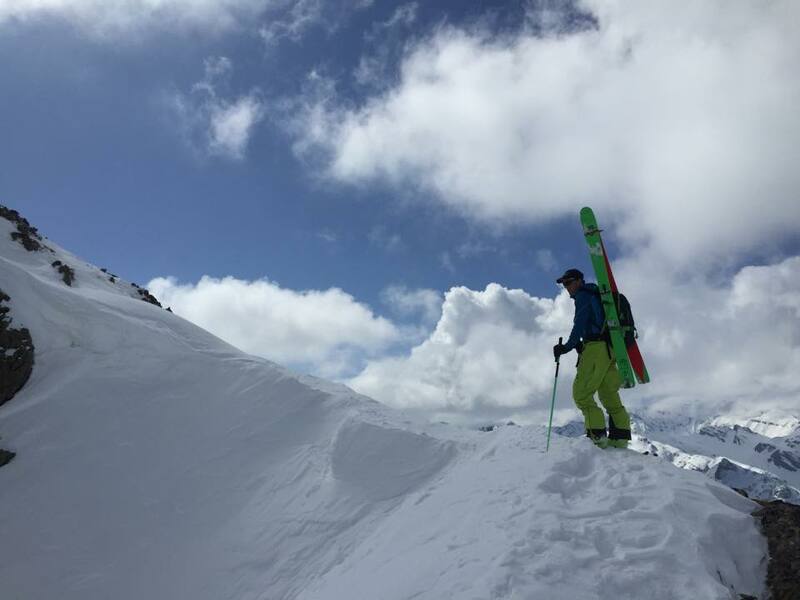 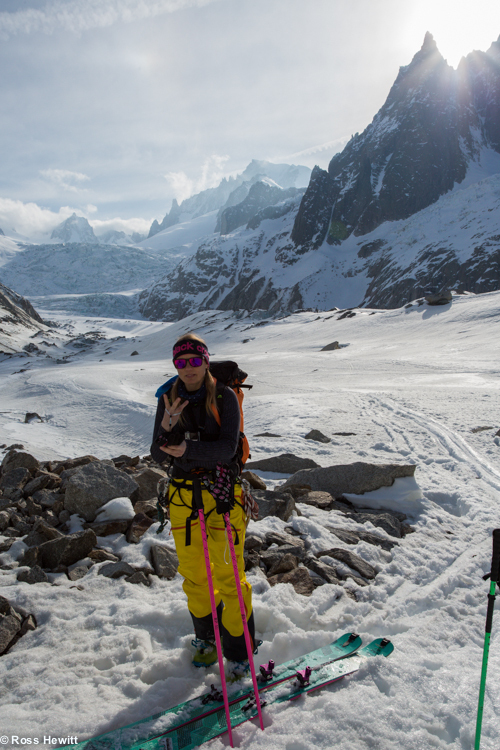 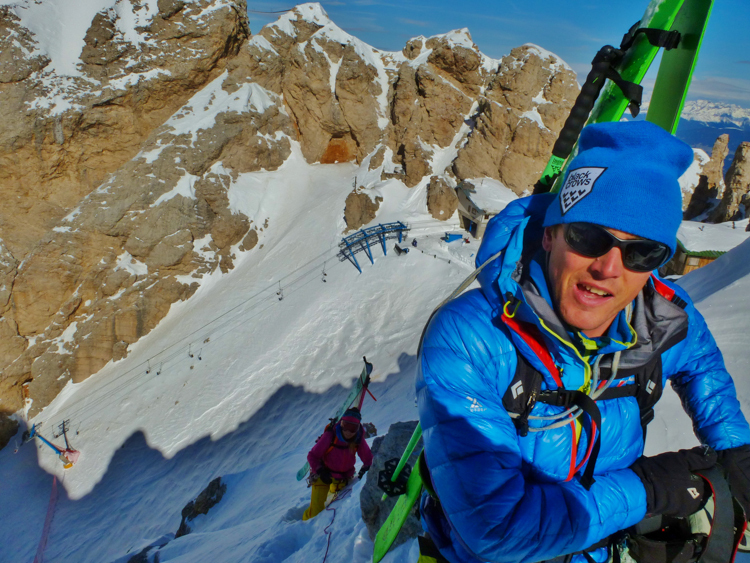 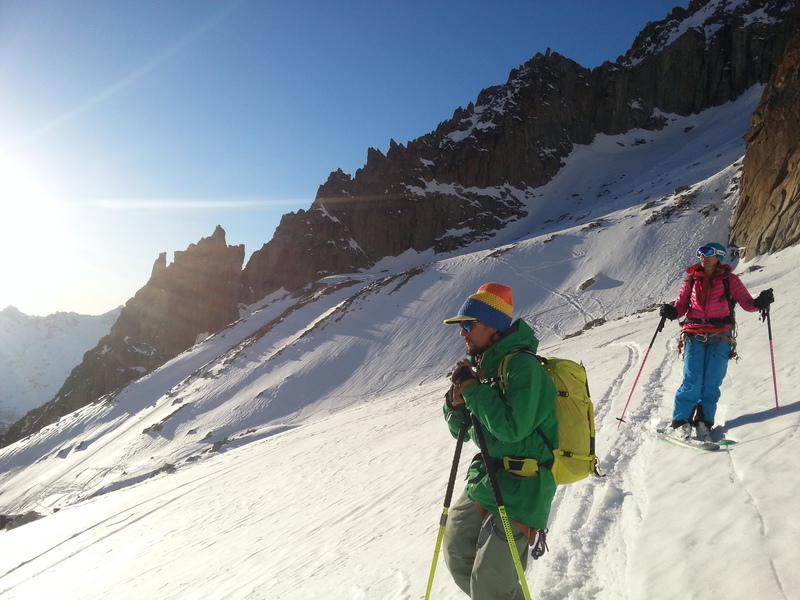 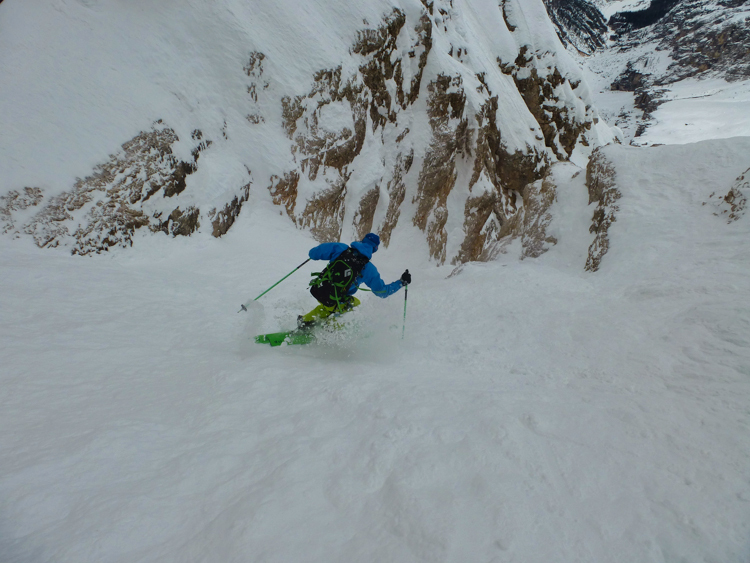 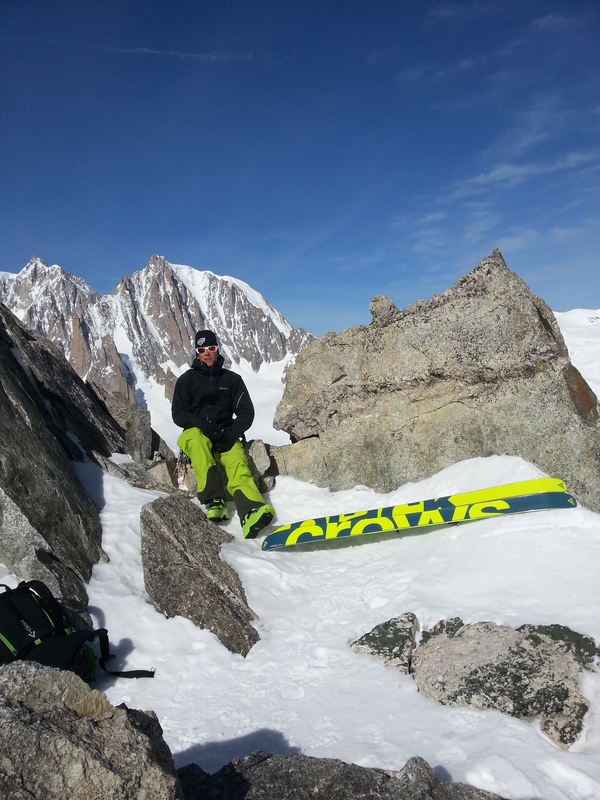 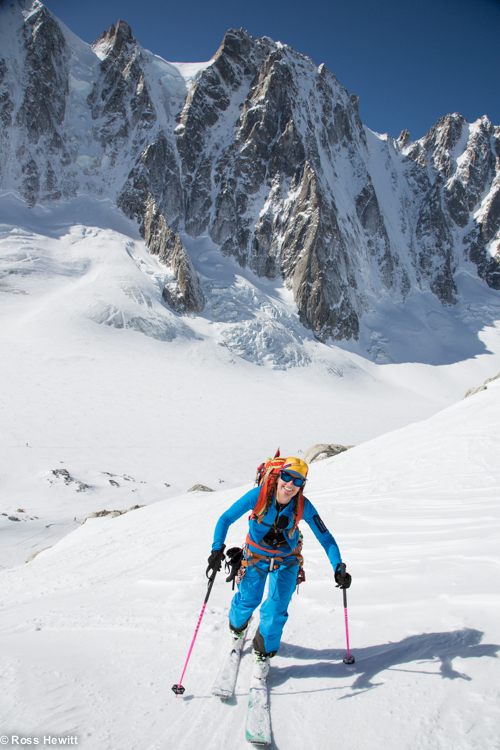 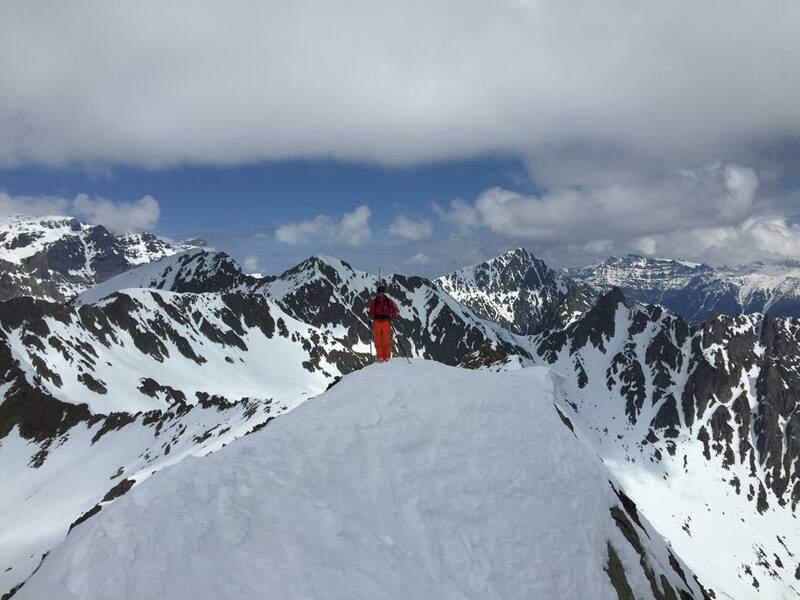 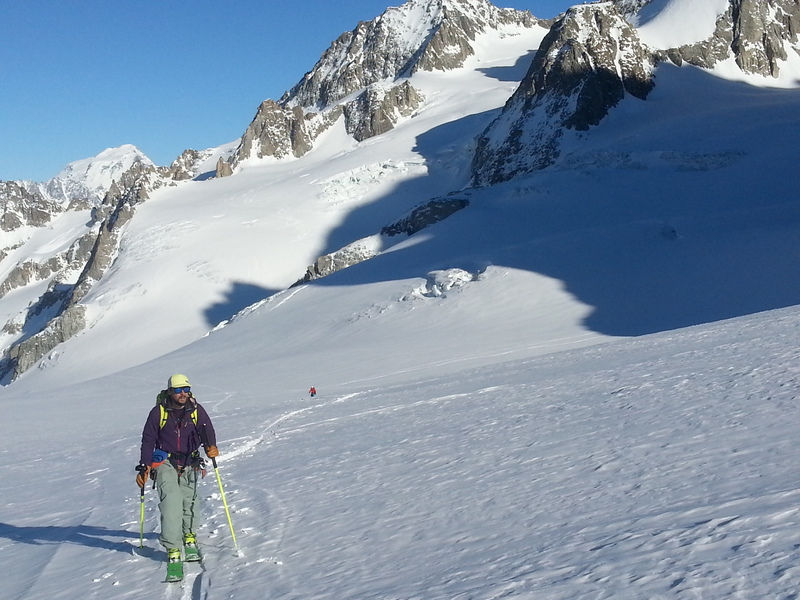 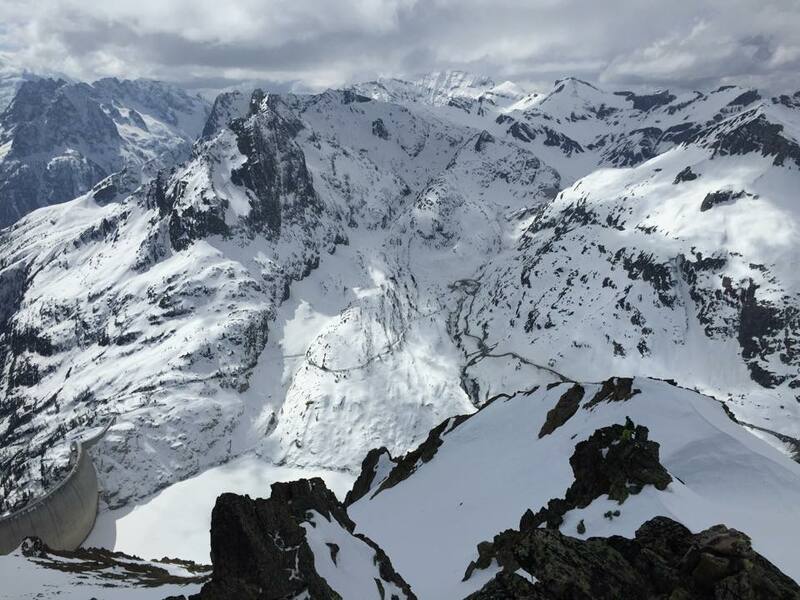 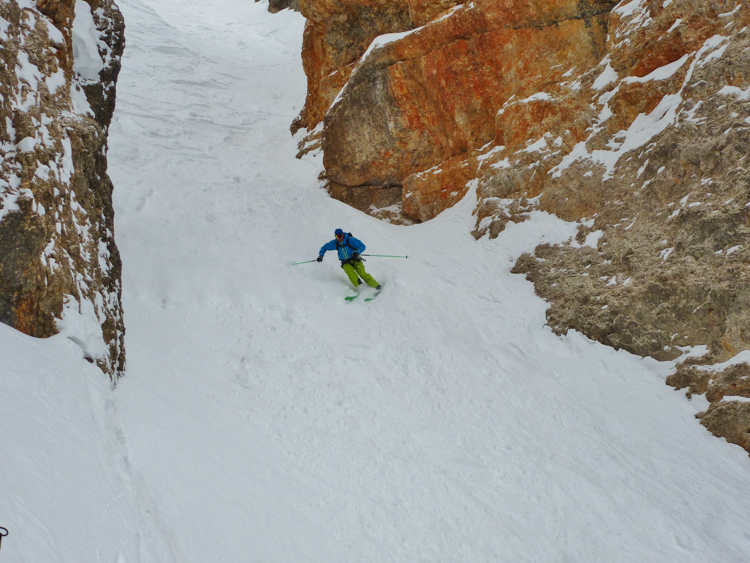 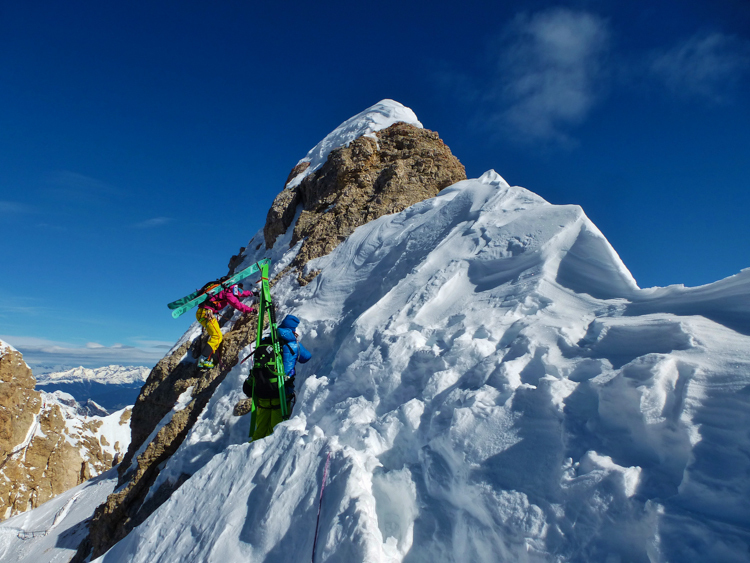 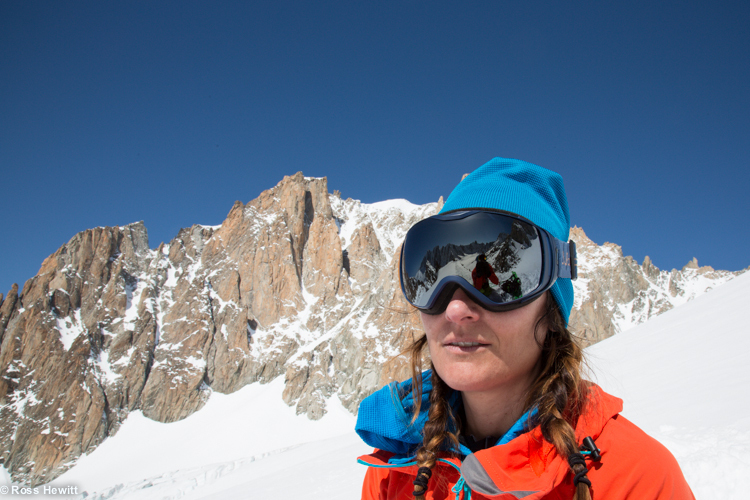 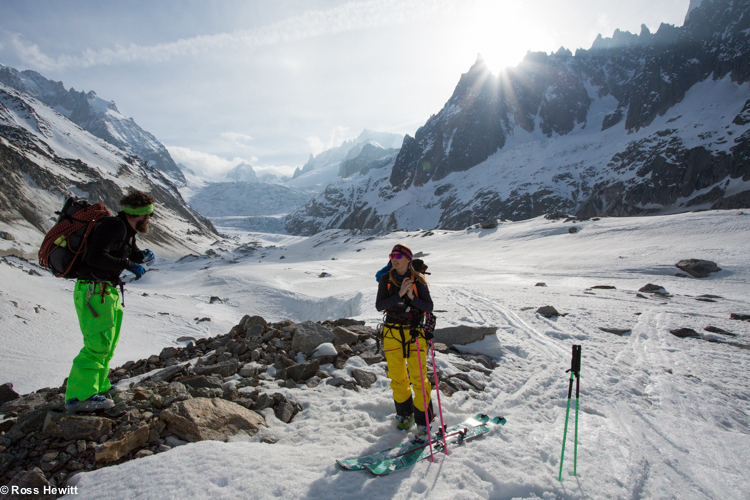 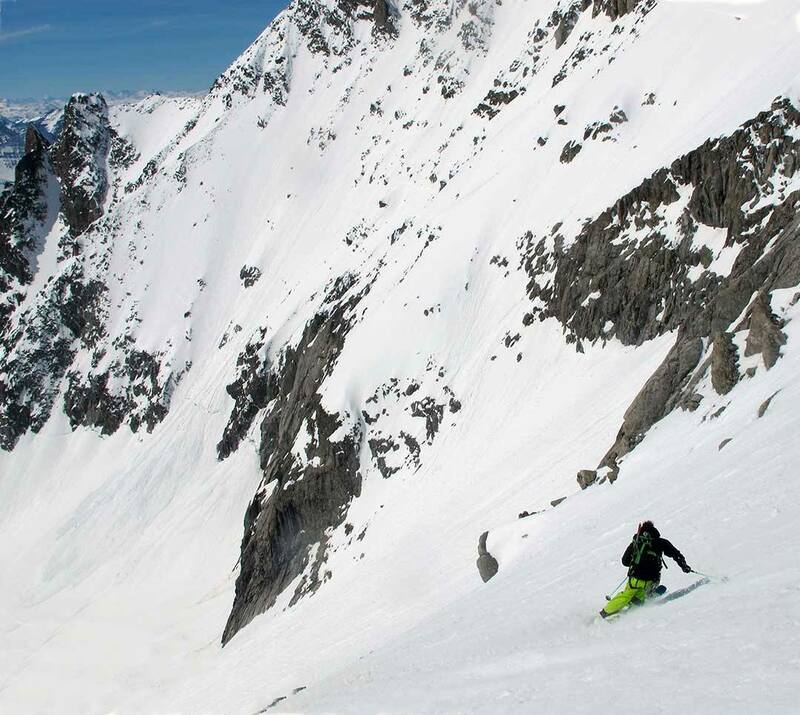 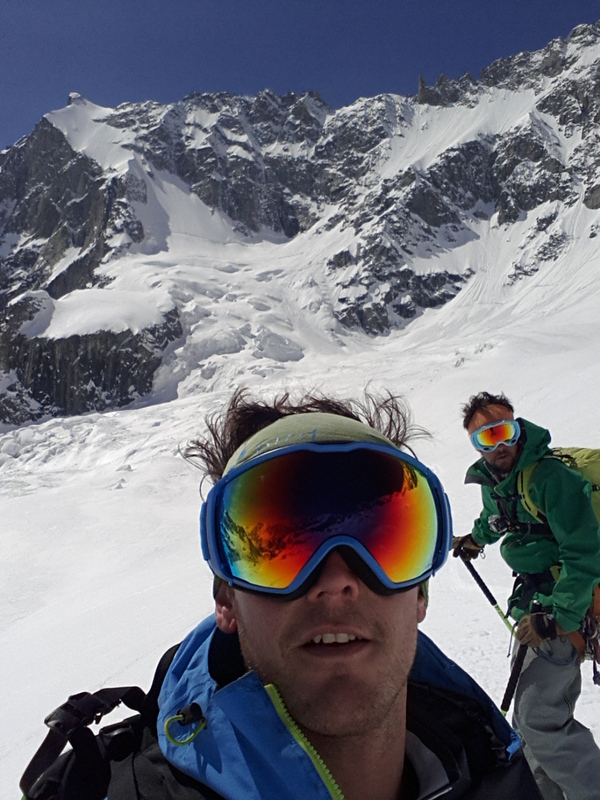 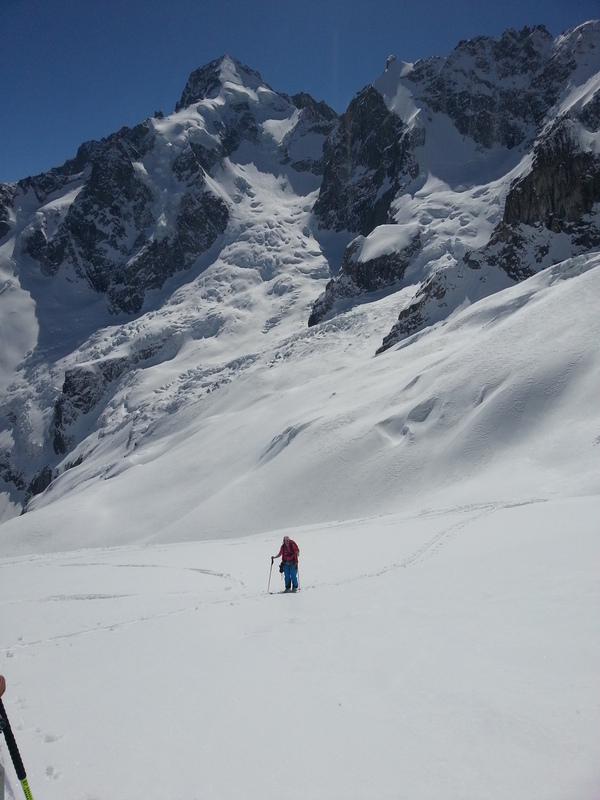 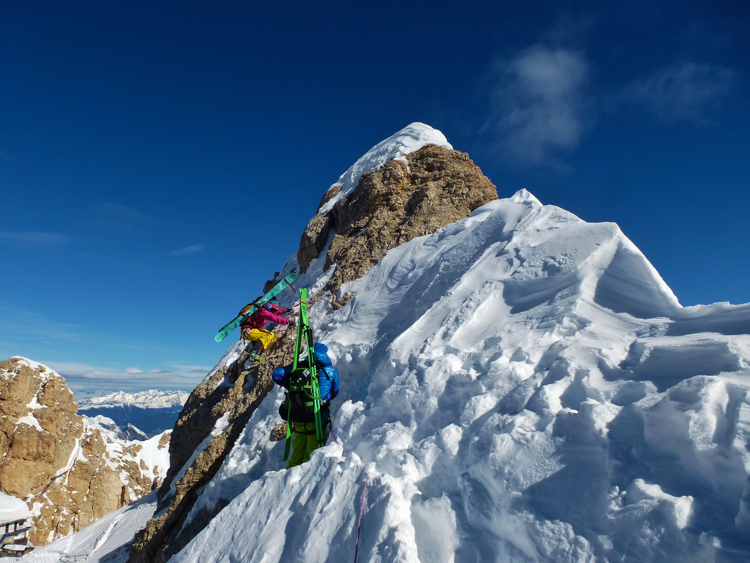 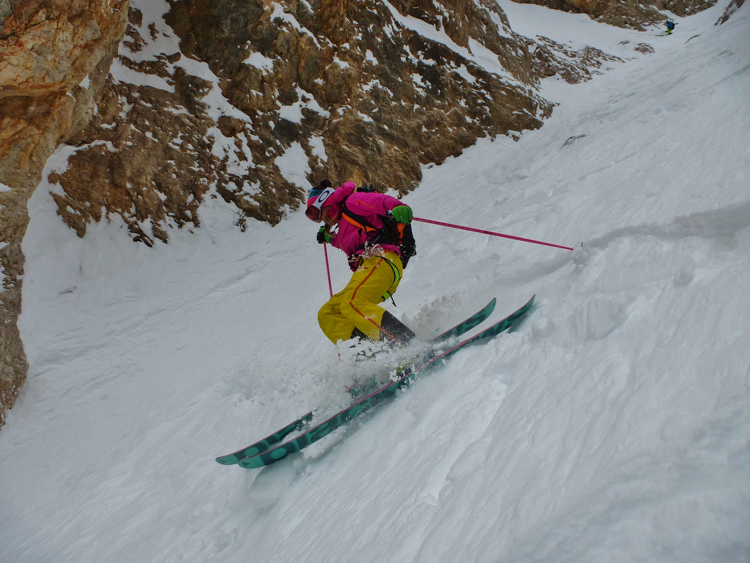 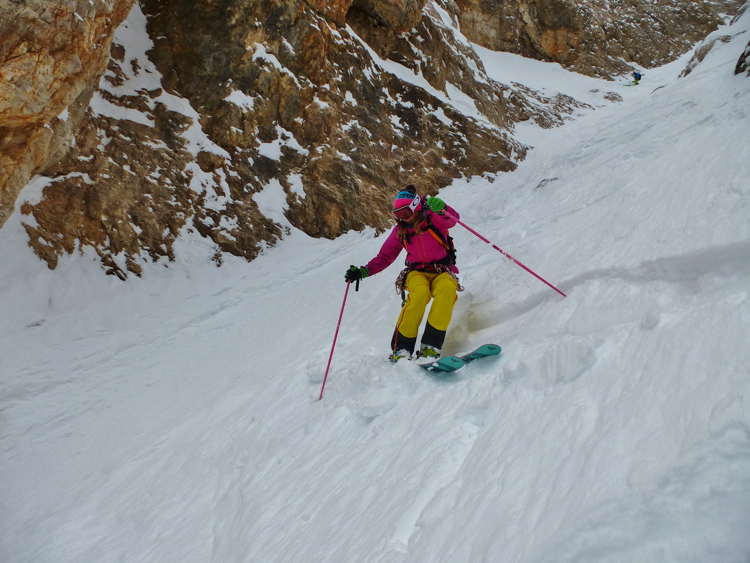 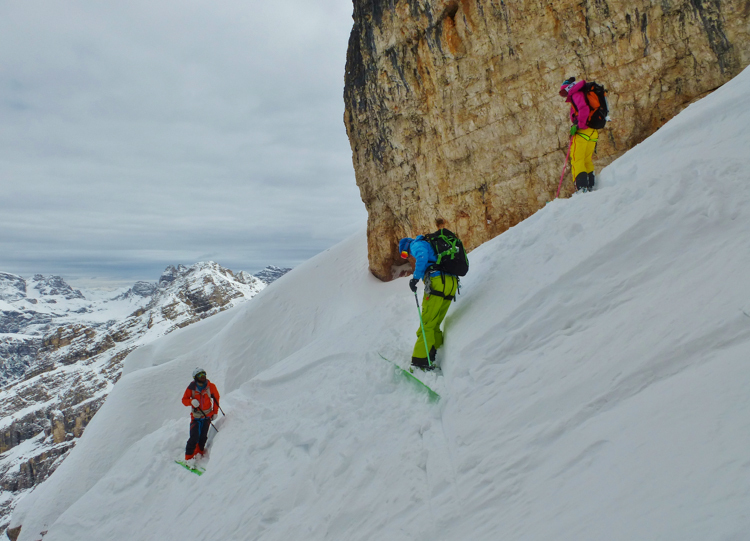 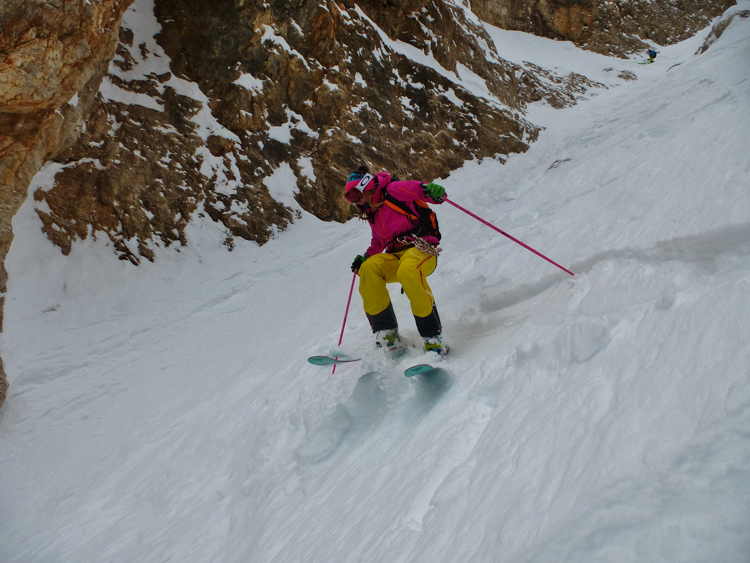 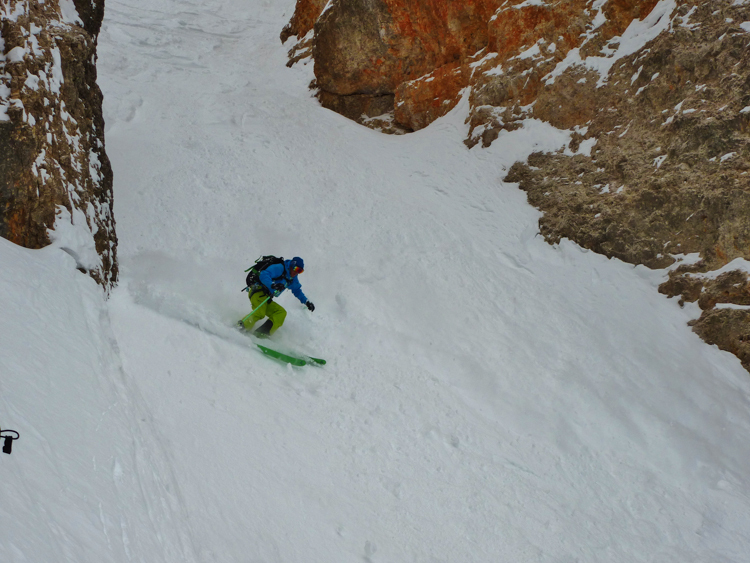 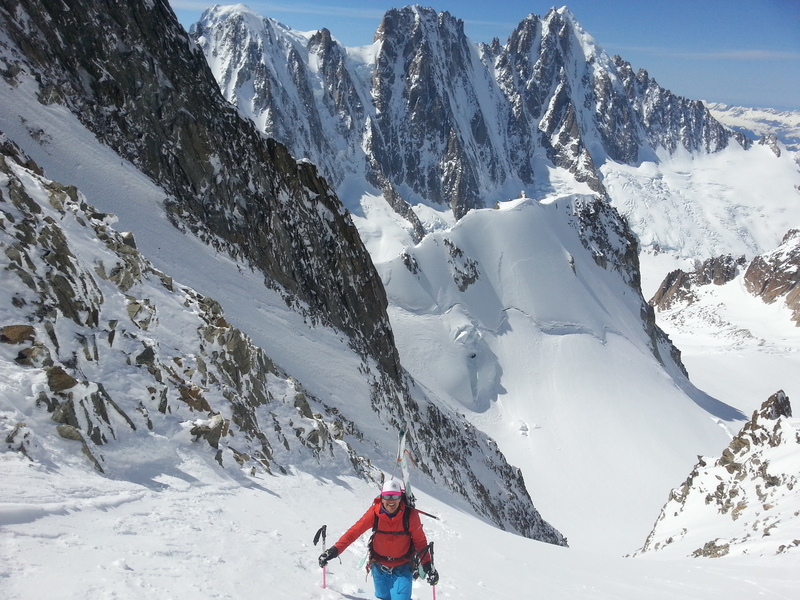 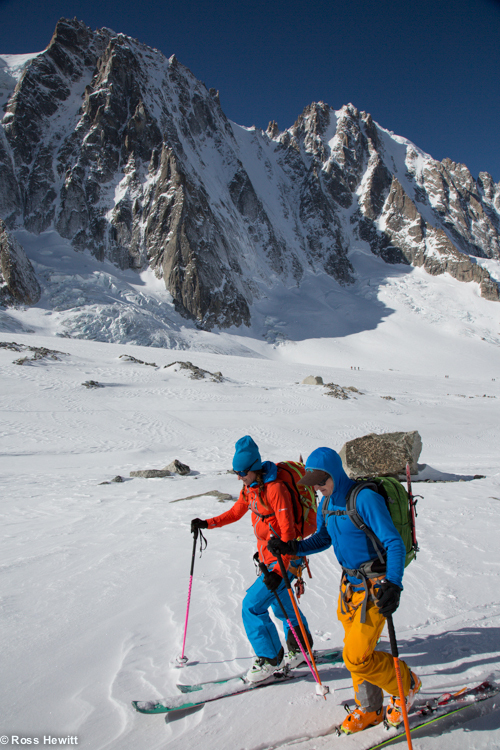 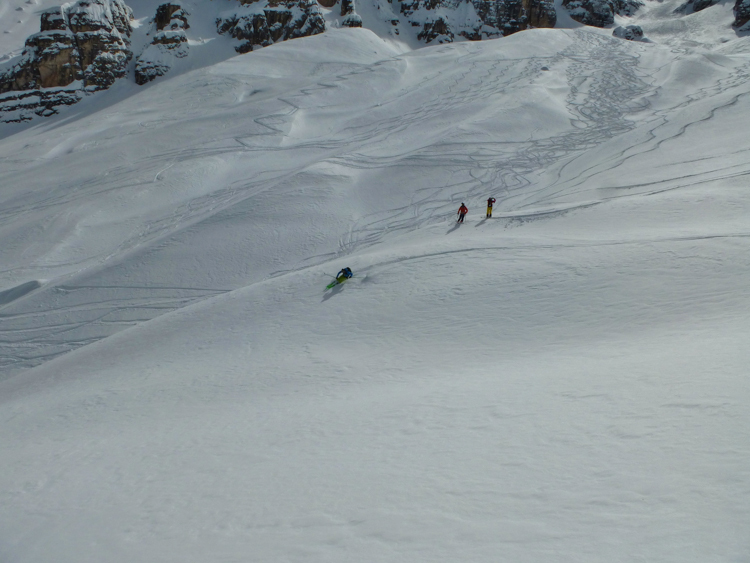 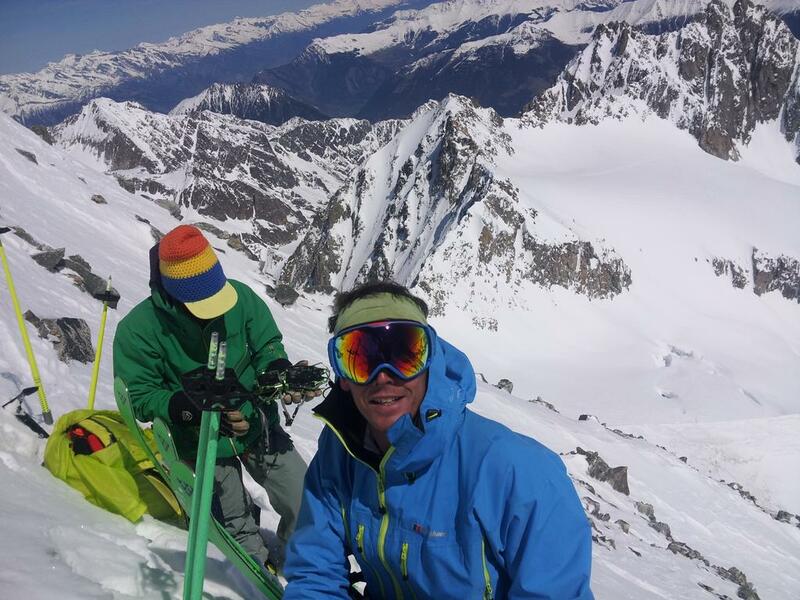 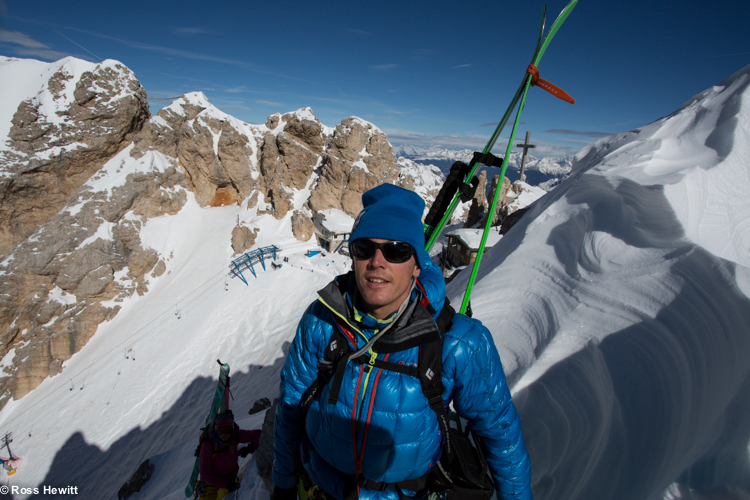 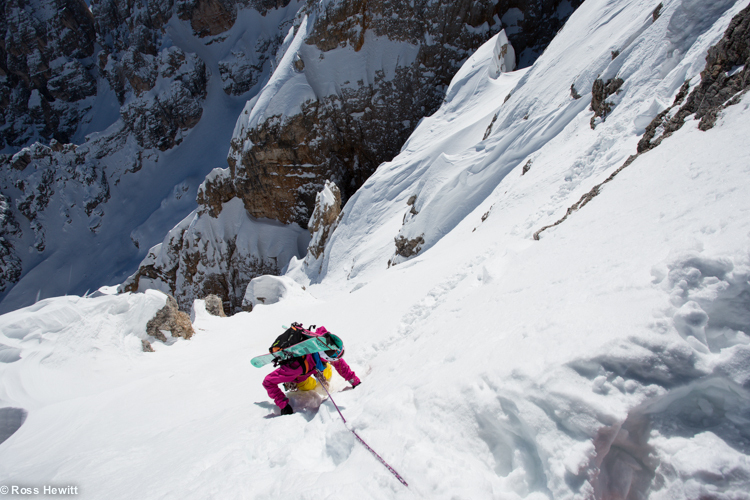 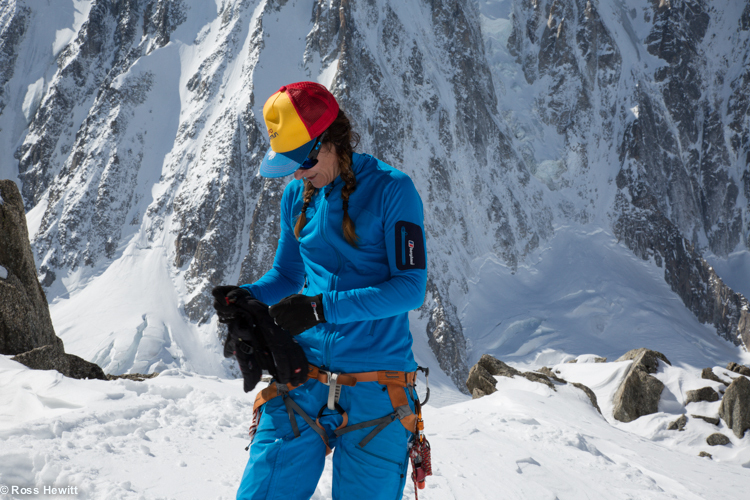 Next morning her friend Matthieu Vigier came along with Chloe Laget and Couttet Berbere so we had a sociable skin up the classic Millieu Glacier. 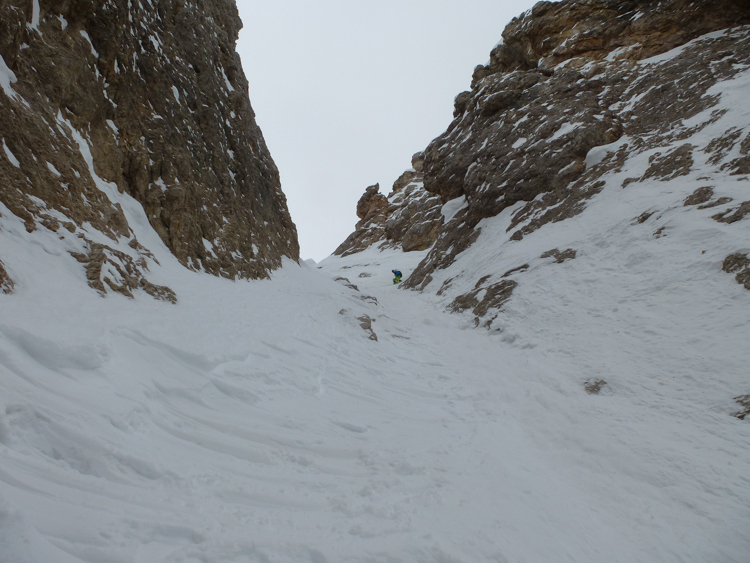 The lack of snow meant very firm conditions on the way up and we used ski crampons for the 1400 m climb. 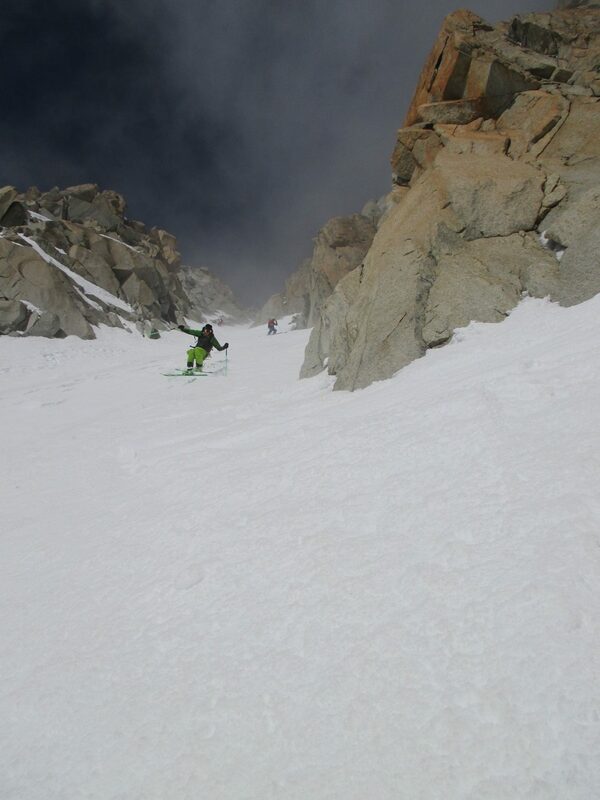 On the summit there was a cold 5 kph wind blowing and I didnt linger long wanting to find the entry to the couloir, having only skied the left branch before. 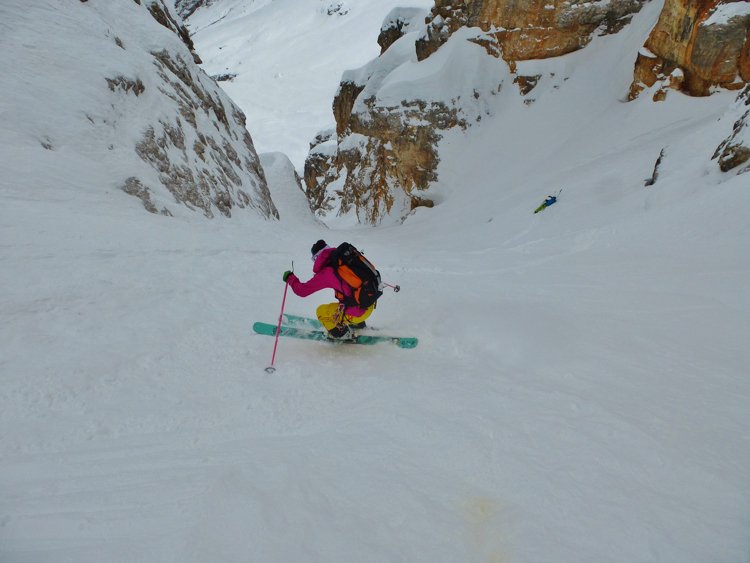 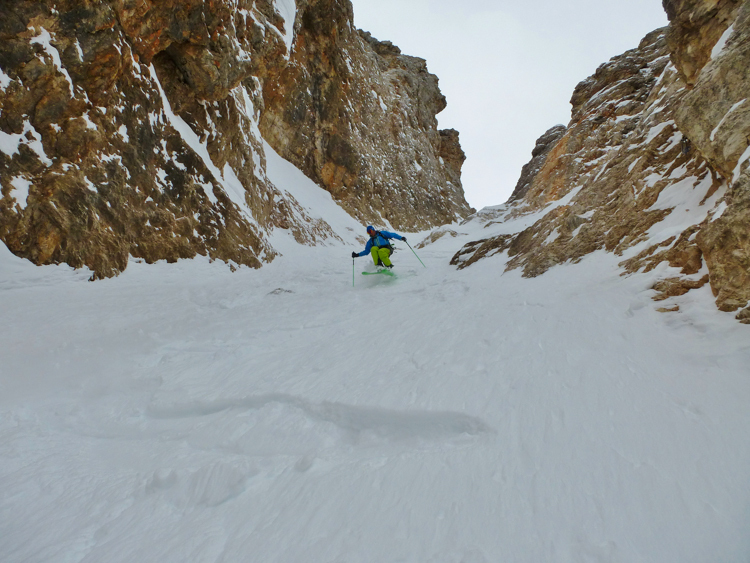 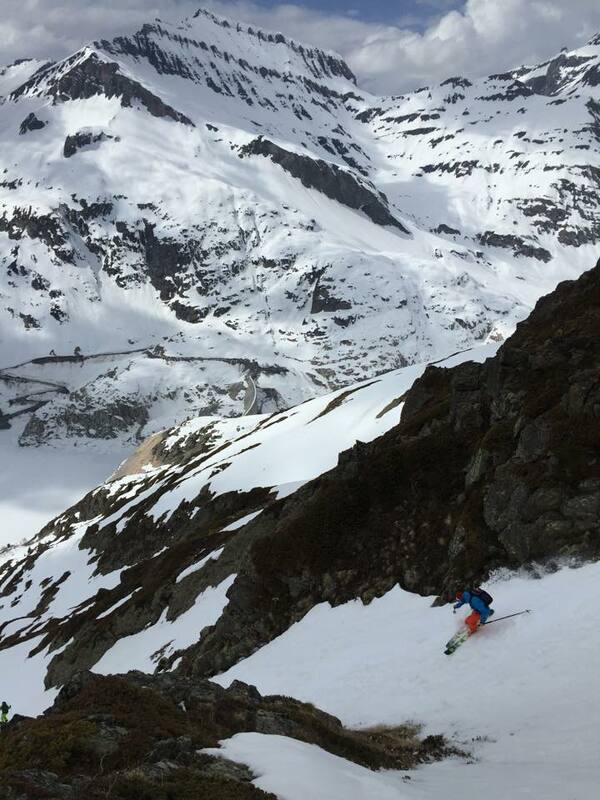 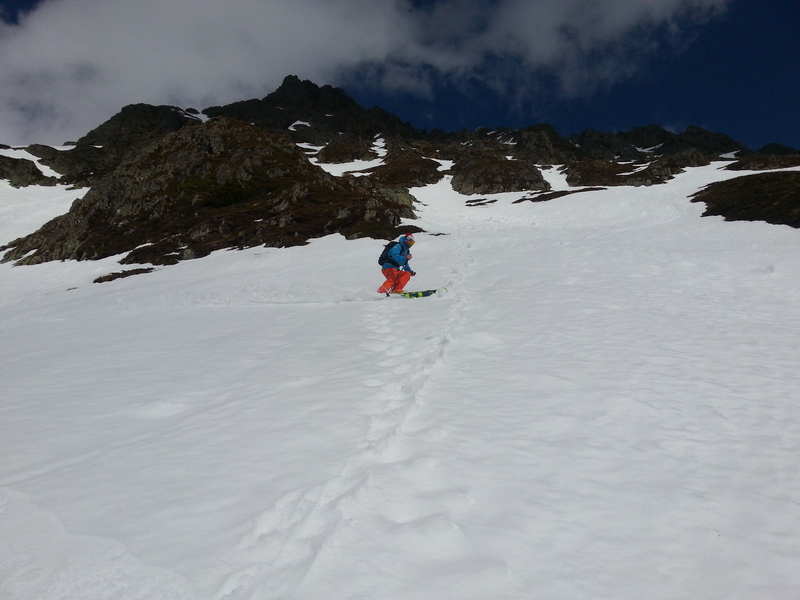 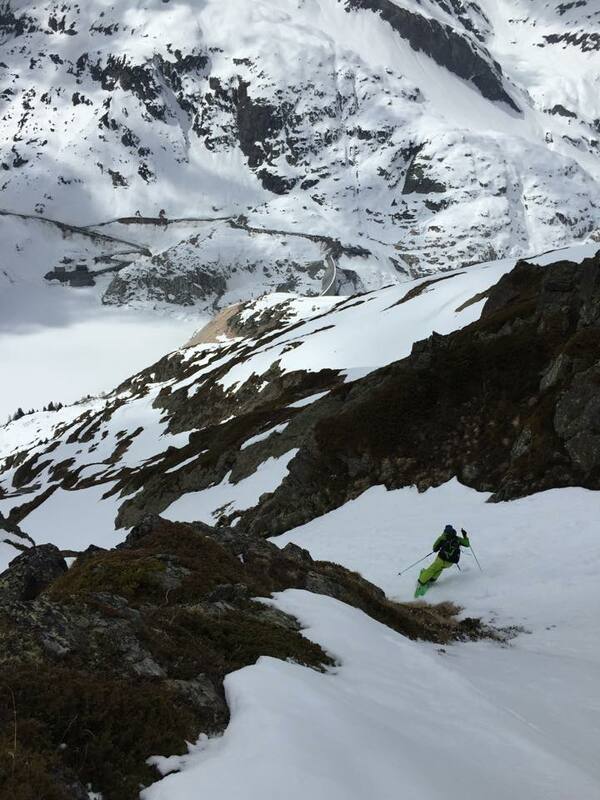 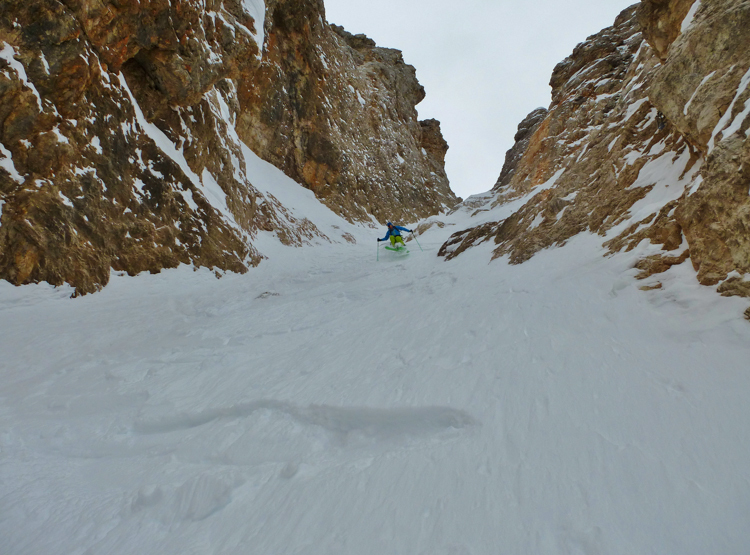 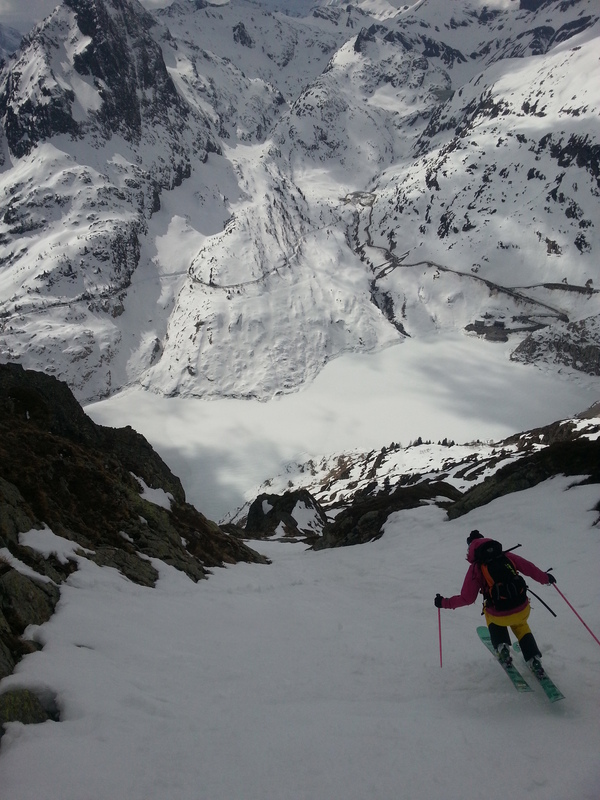 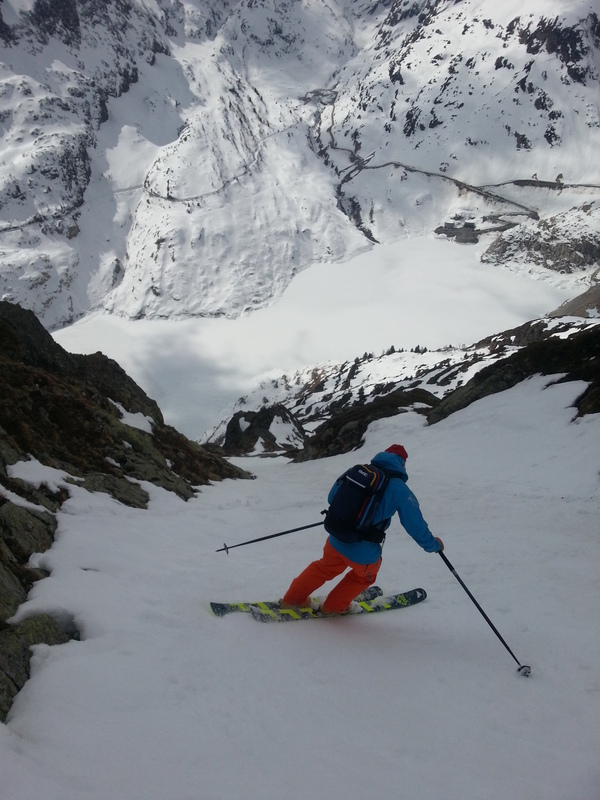 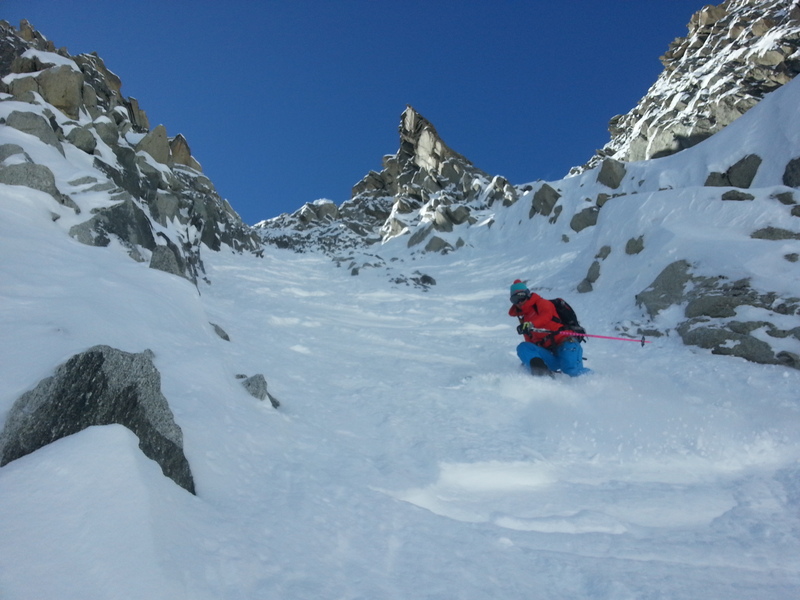 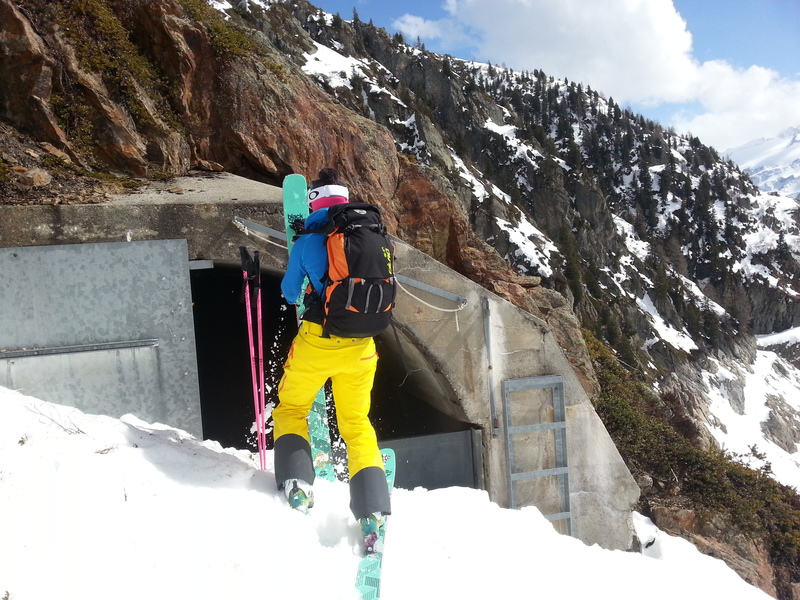 In the couloir it was thankfully a bit warmer and after passing 5 m of rocks at the top we put on our skis on flat corning spring snow. 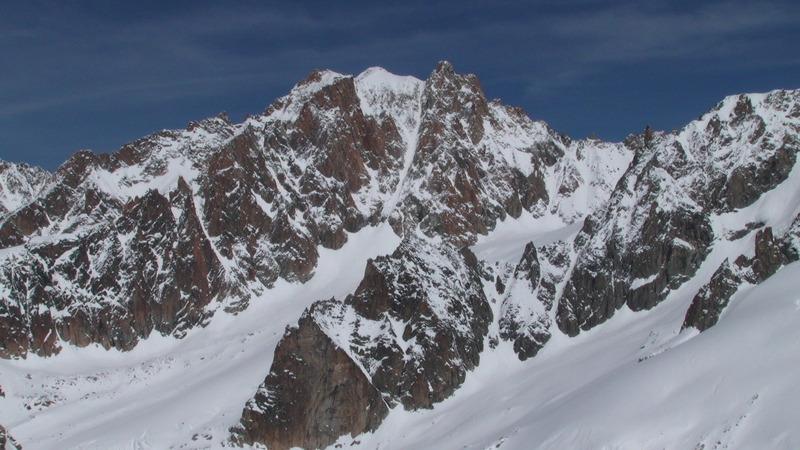 Y Couloir (TD, 45 degrees, 5.1/5.2 600 m) as seen from Col des Courtes. 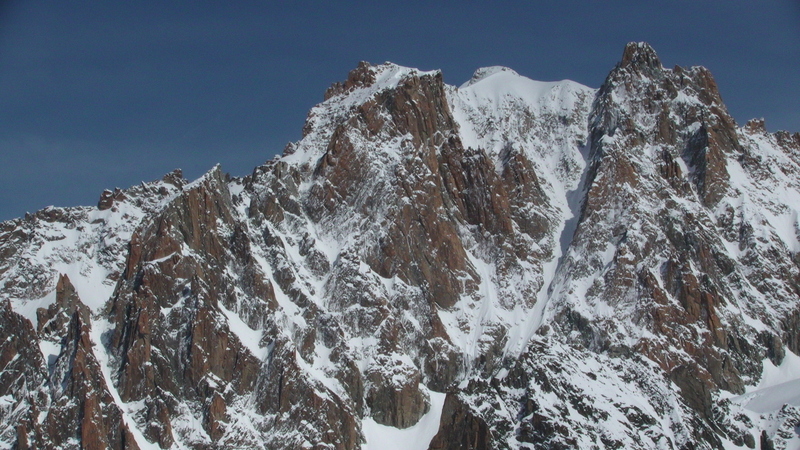 Its the big line branching below the summit of the Aiguille d’Argentiere (3901m). 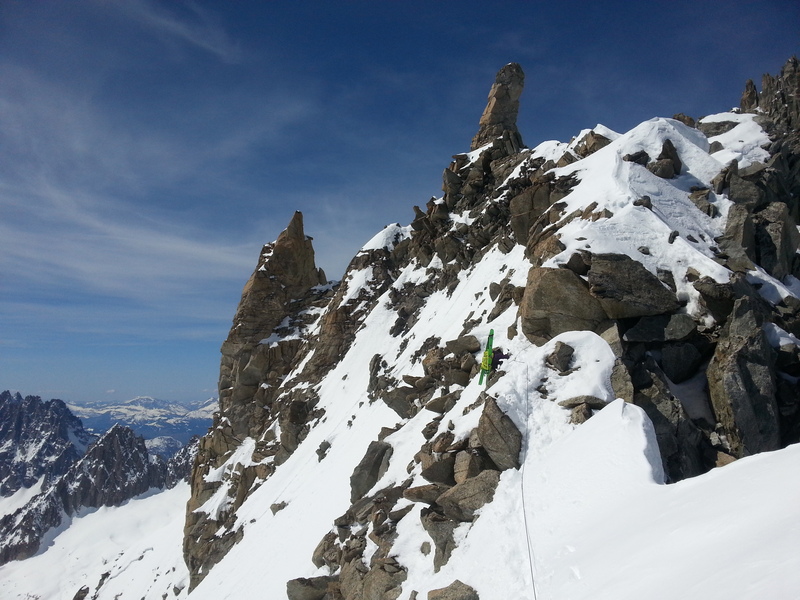 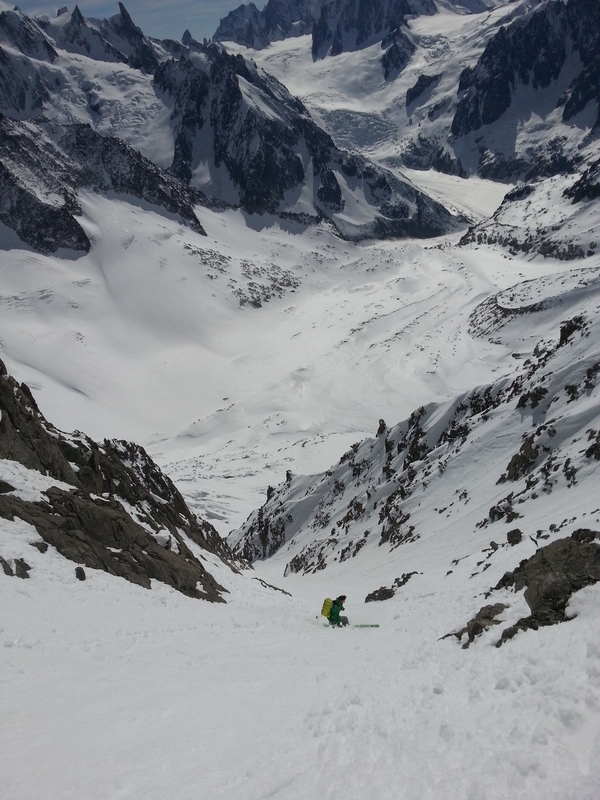 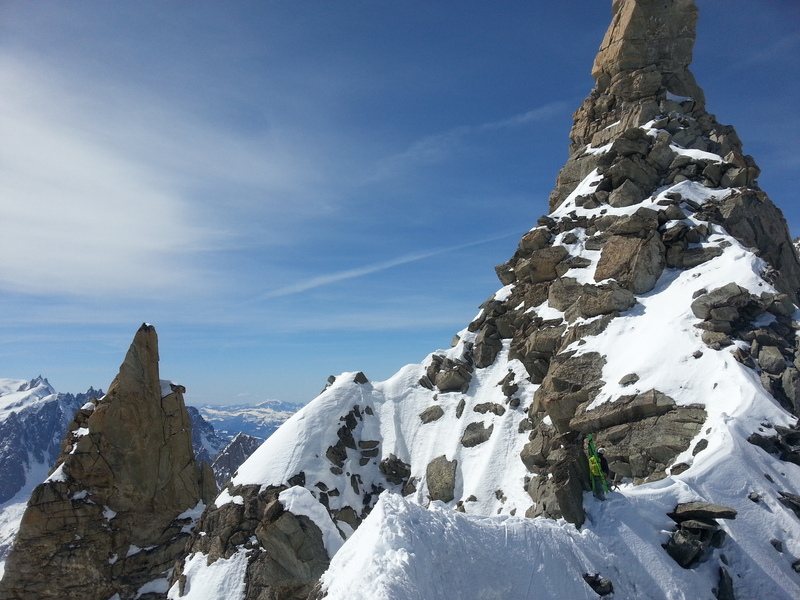 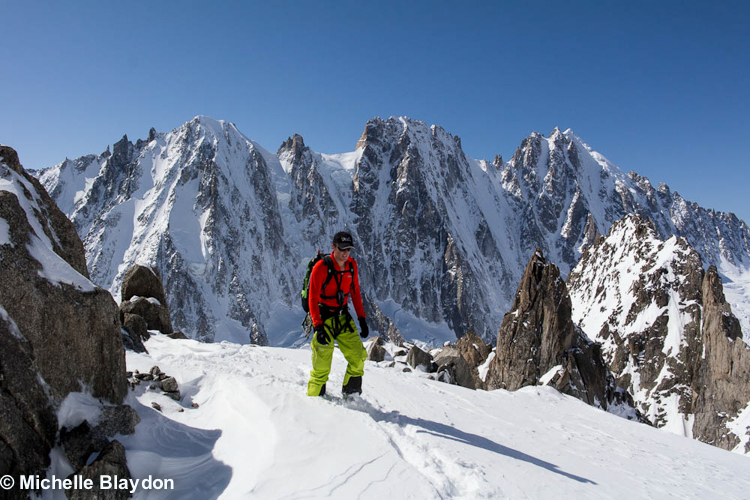 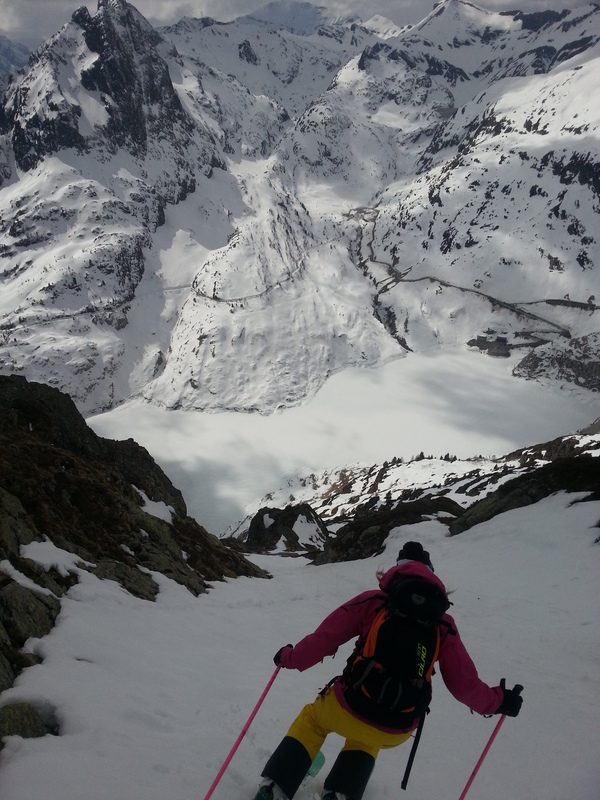 Y Couloir with the 60 m step at the base with the stunning golden granite spires. 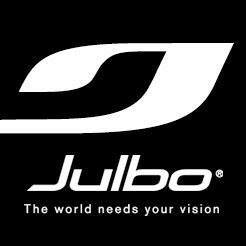 Julbo Aerospace goggles – the ultimate variable venting bootpacking and touring goggle. 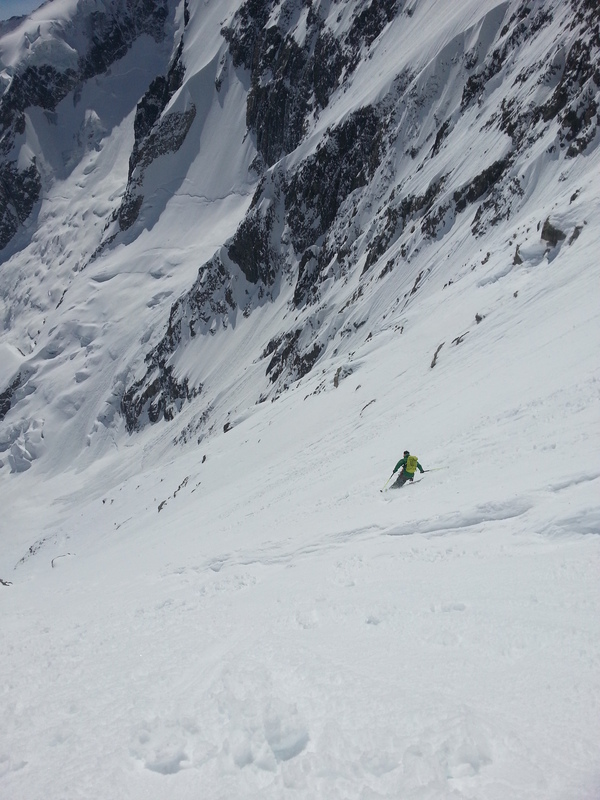 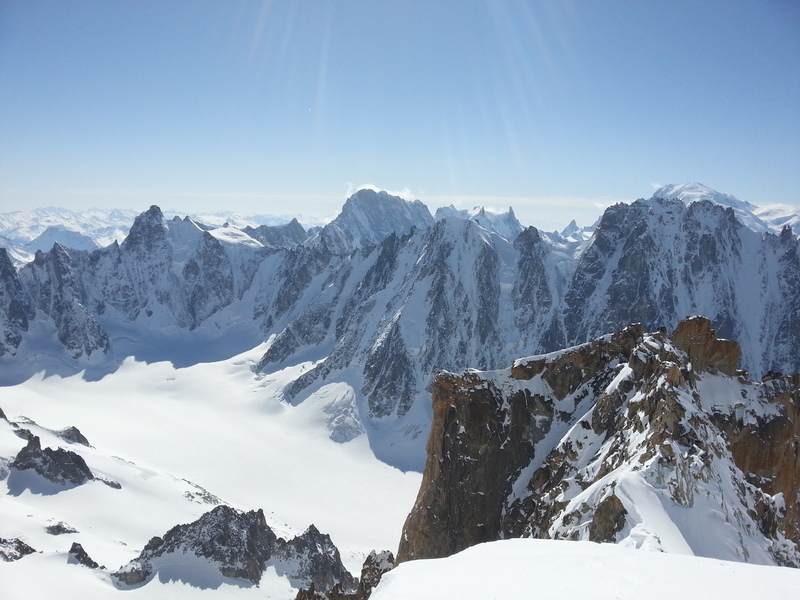 The big lines of Couturier and Au Coeur du Monde or Col Aiguille Verte right hand (1st and only? 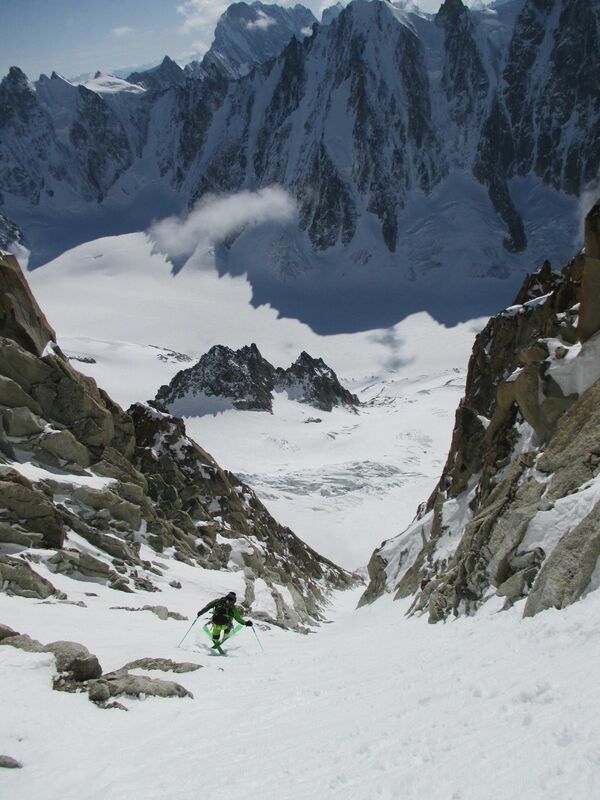 descent by the Scottish extreme ski legends Paul MacLeod and Ewen Moffat with the Dane Thomas Husted in 2001). 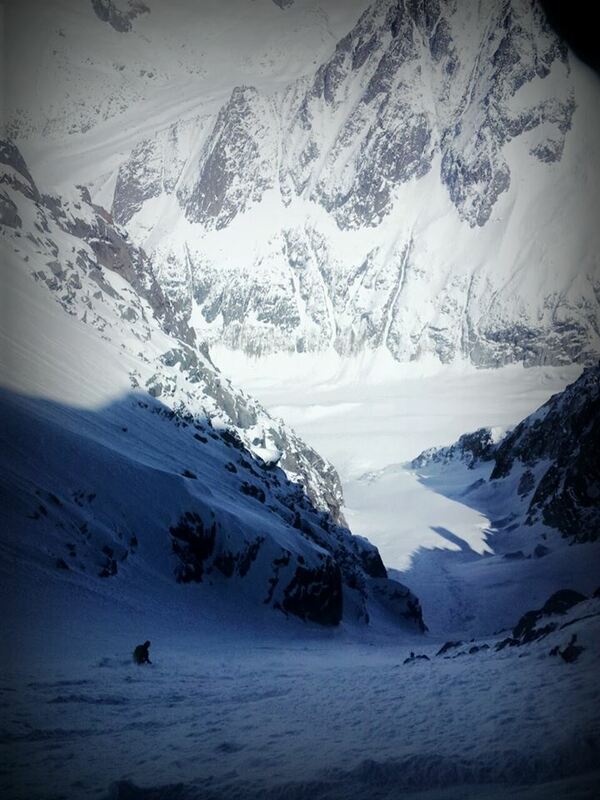 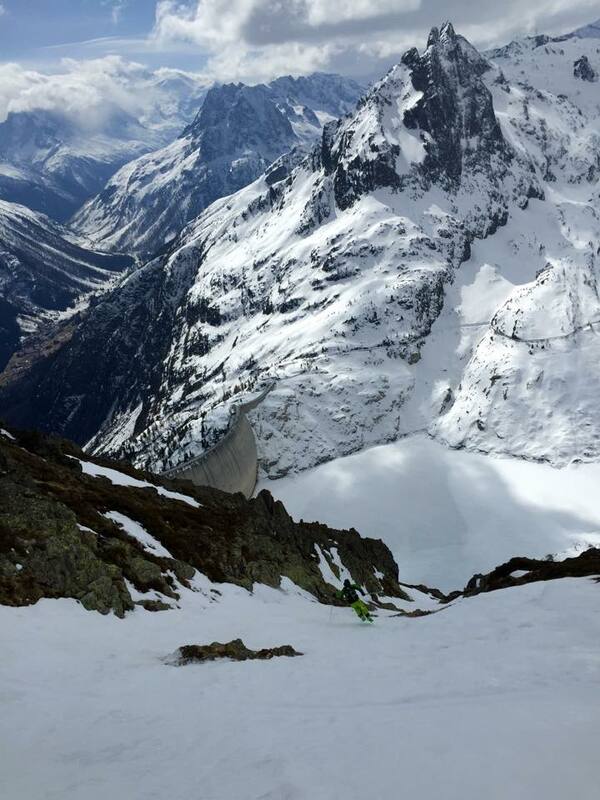 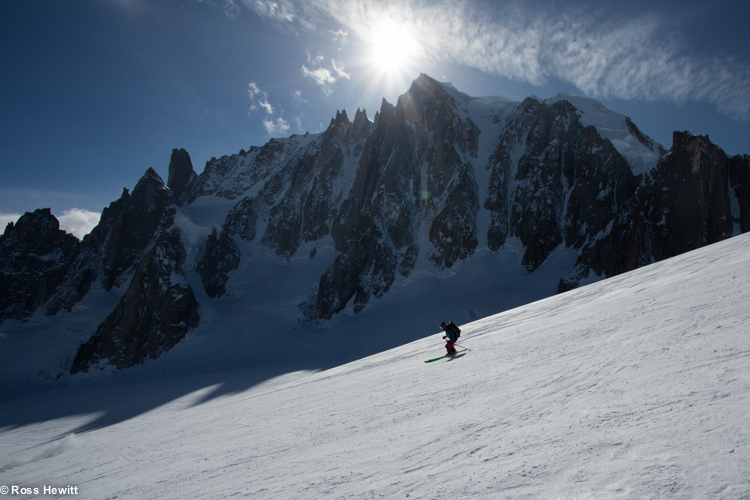 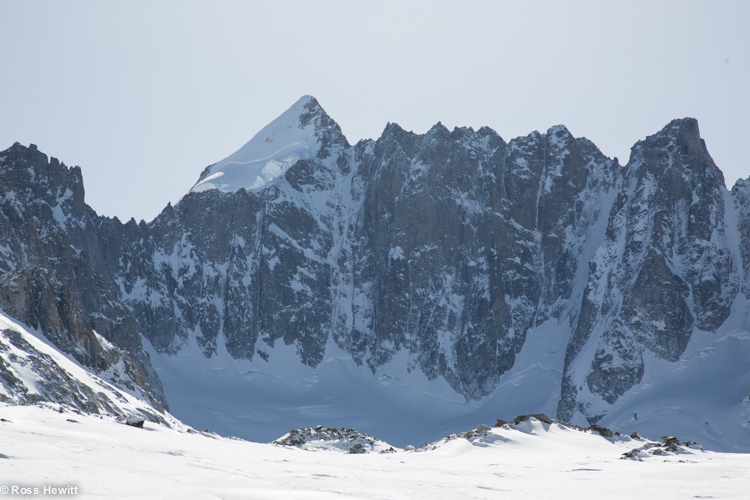 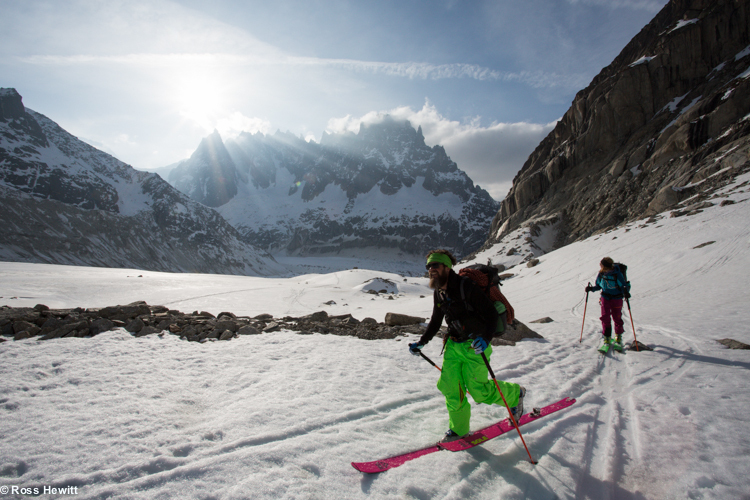 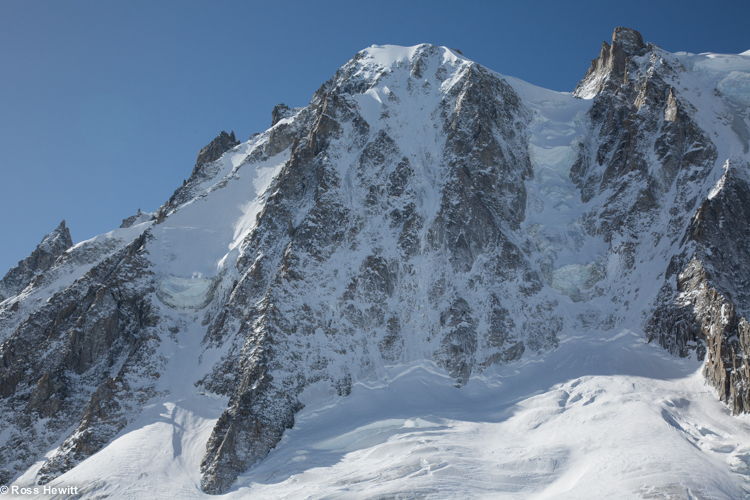 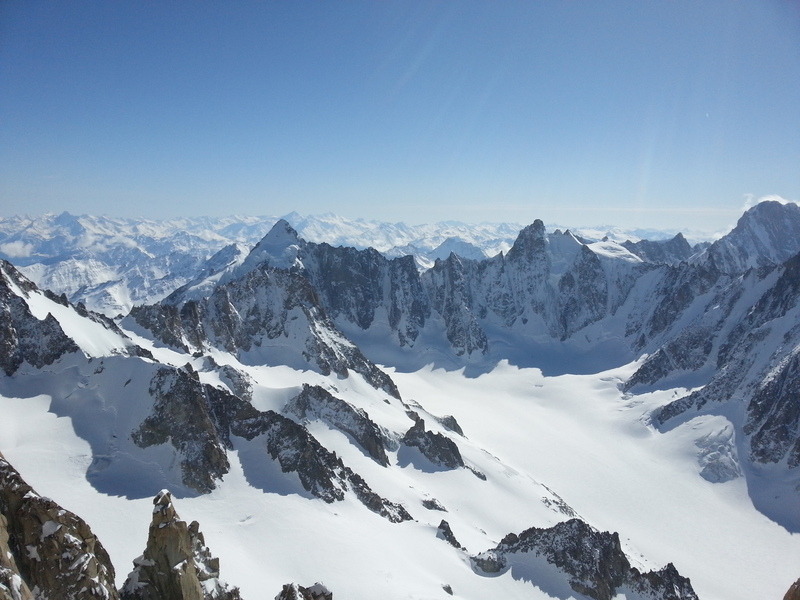 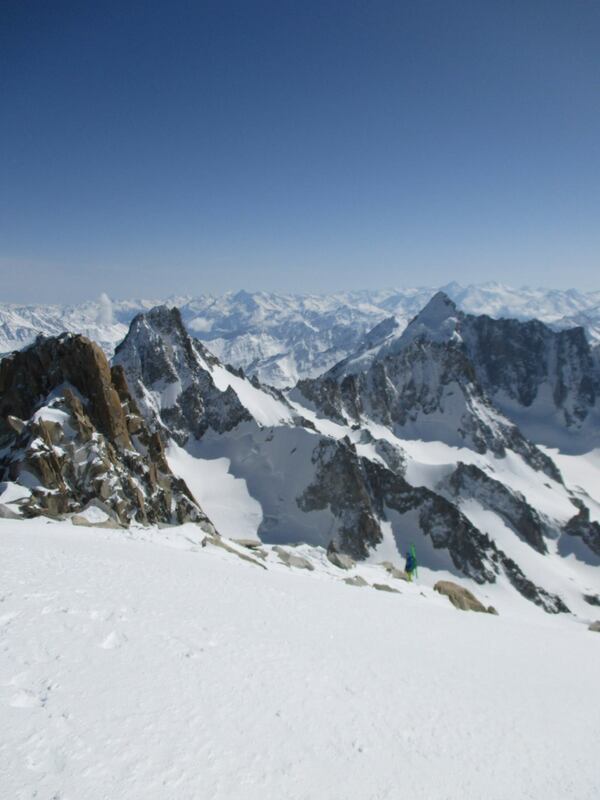 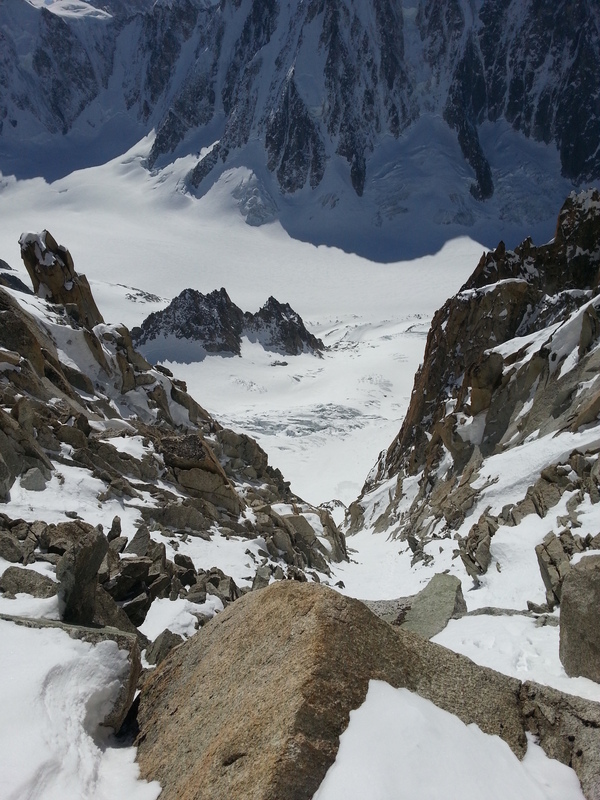 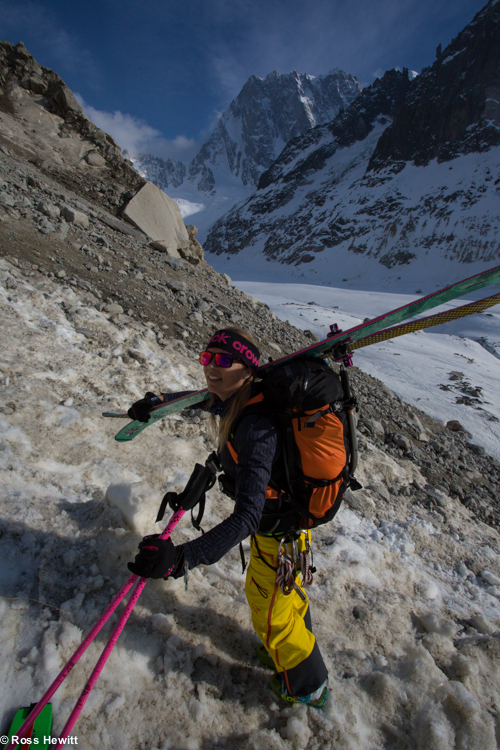 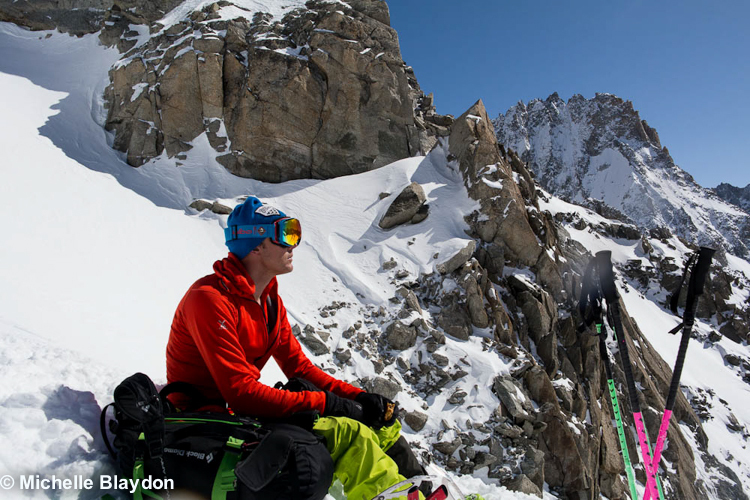 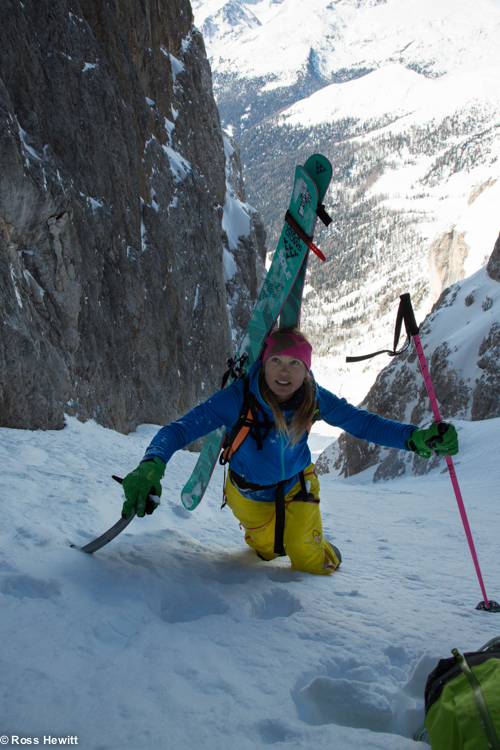 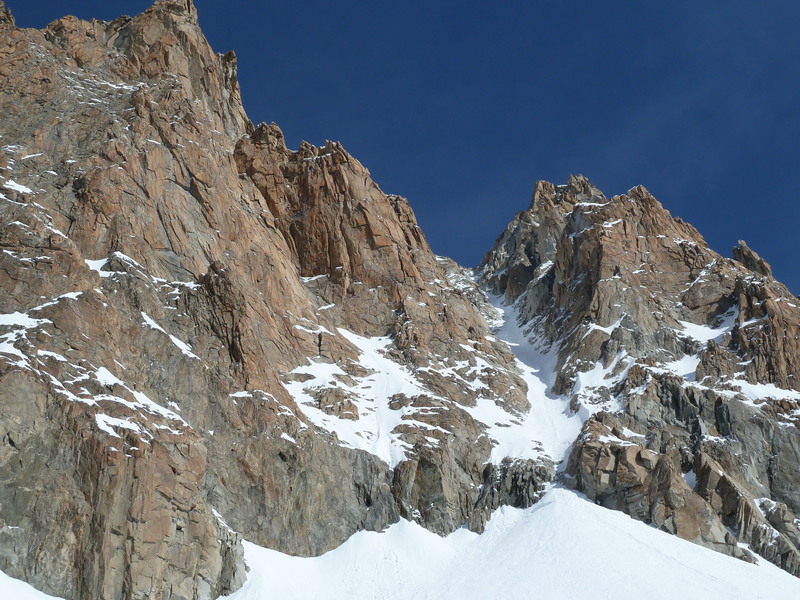 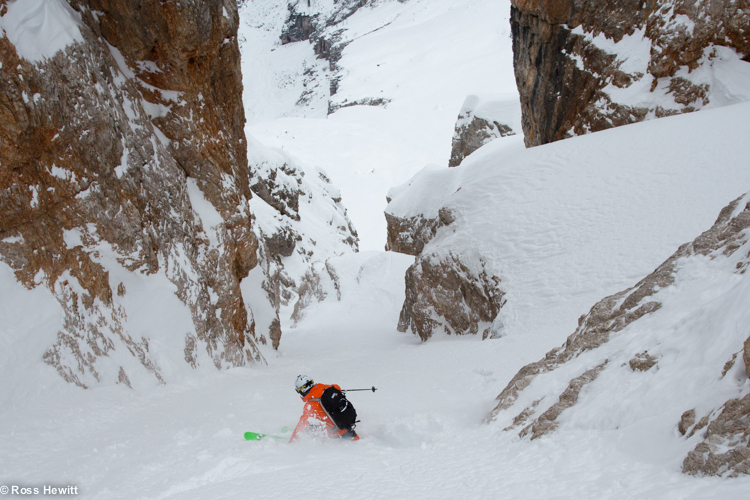 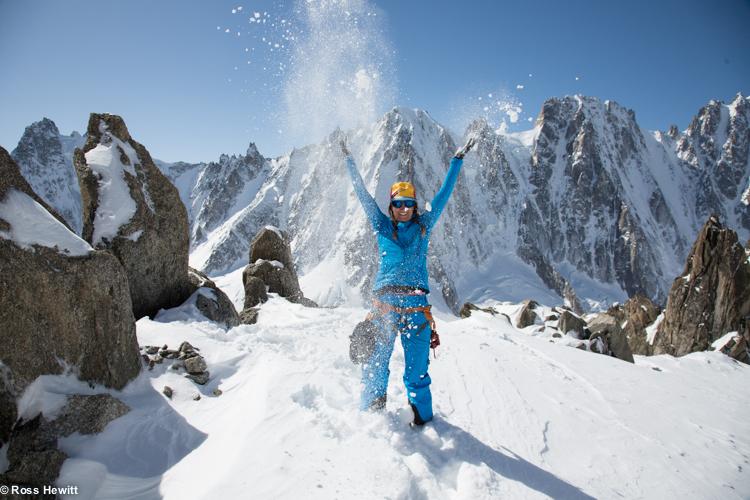 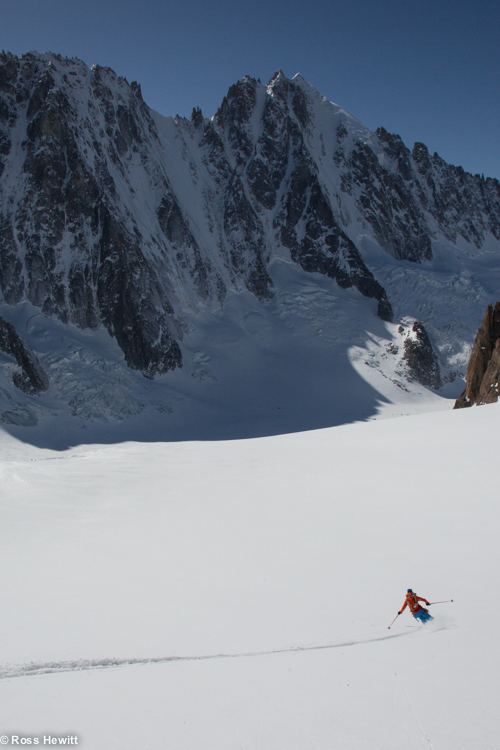 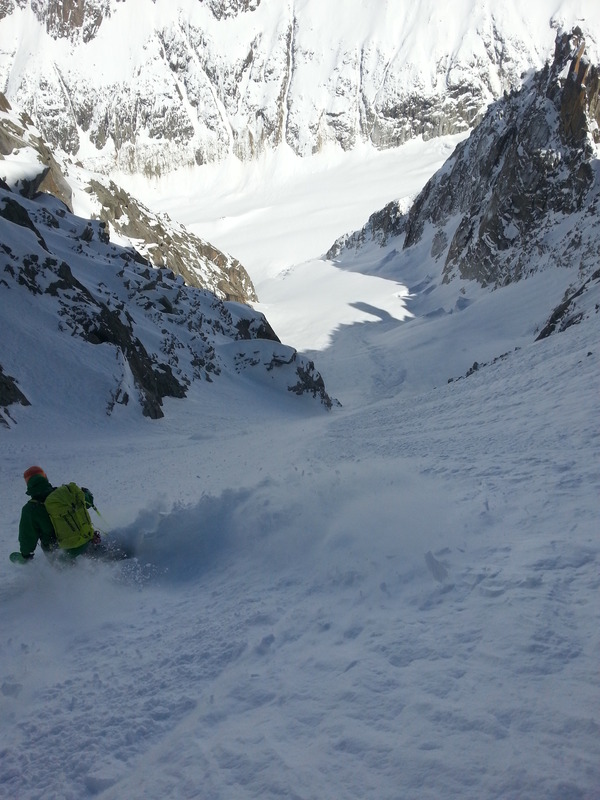 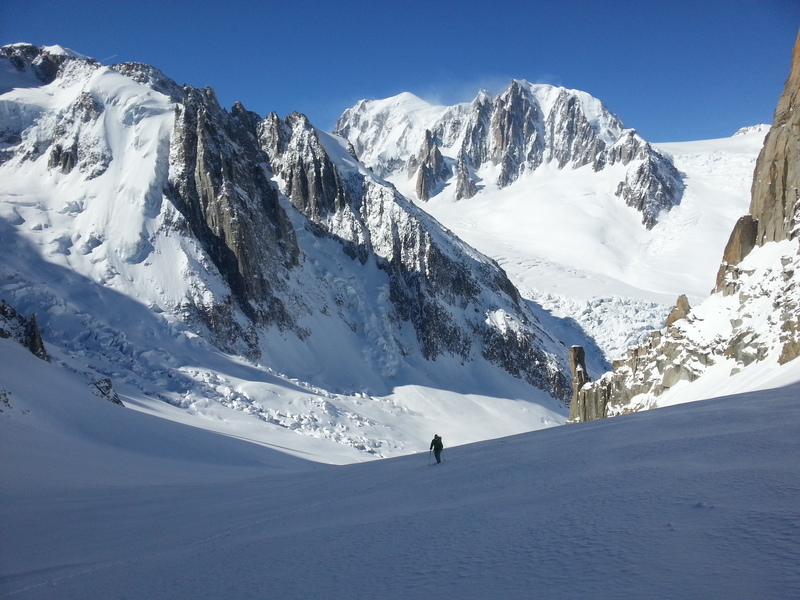 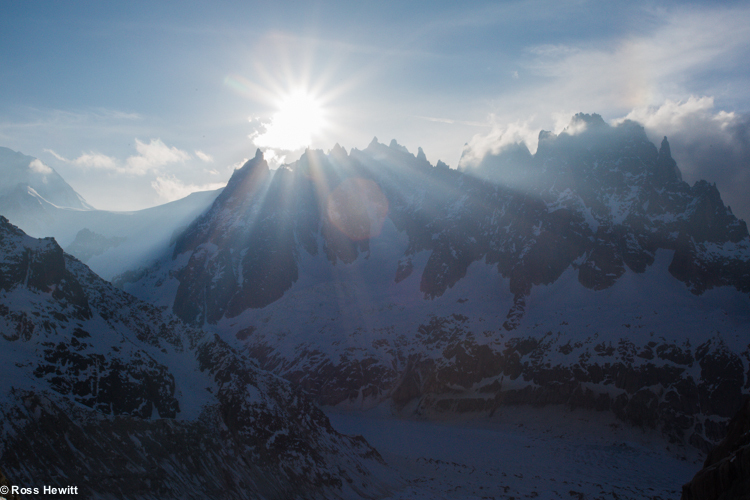 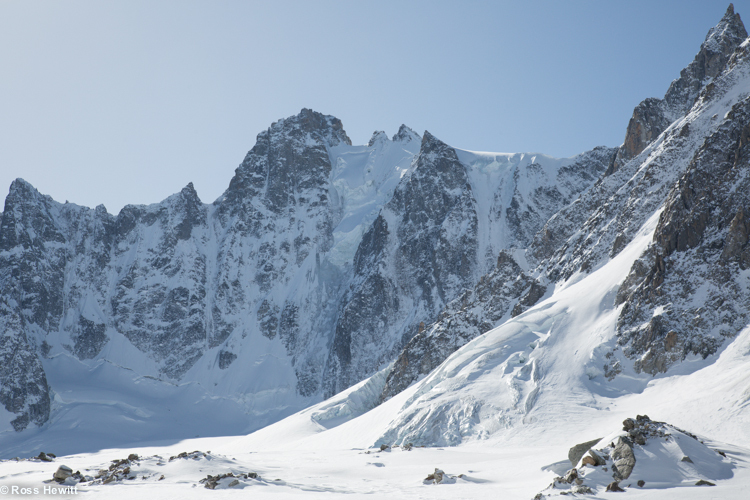 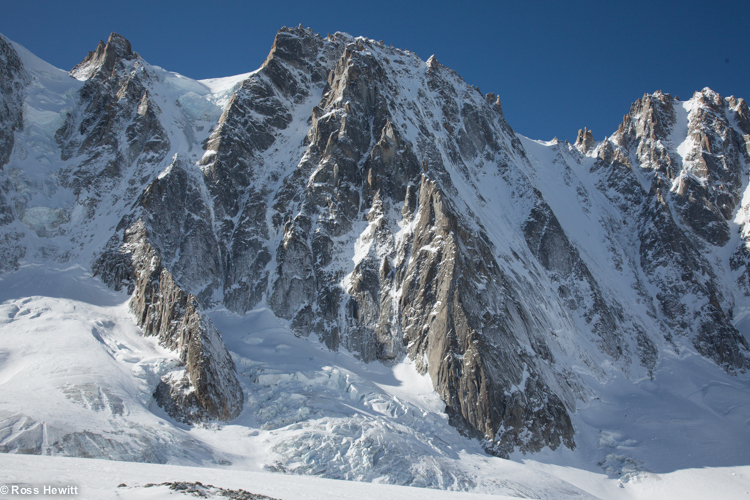 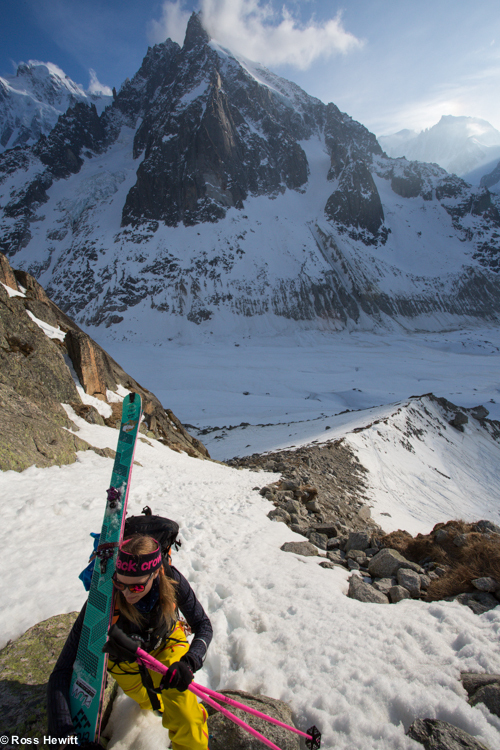 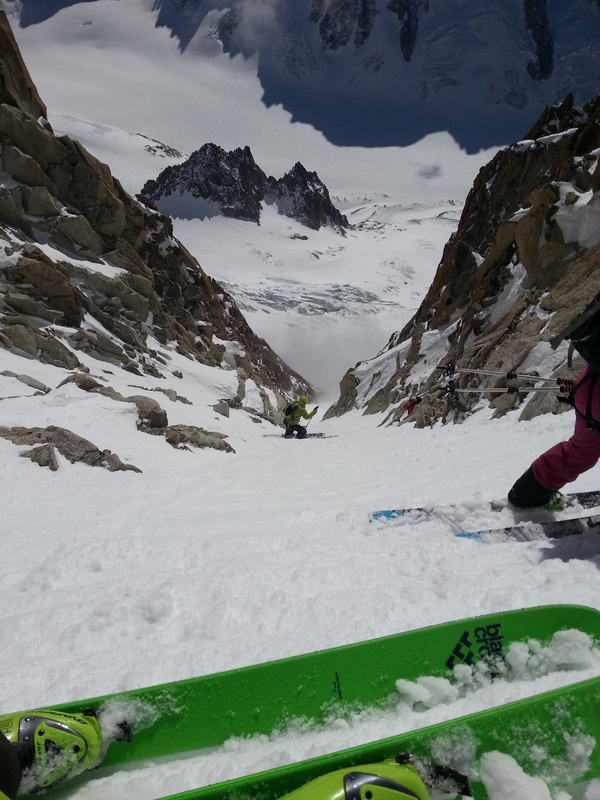 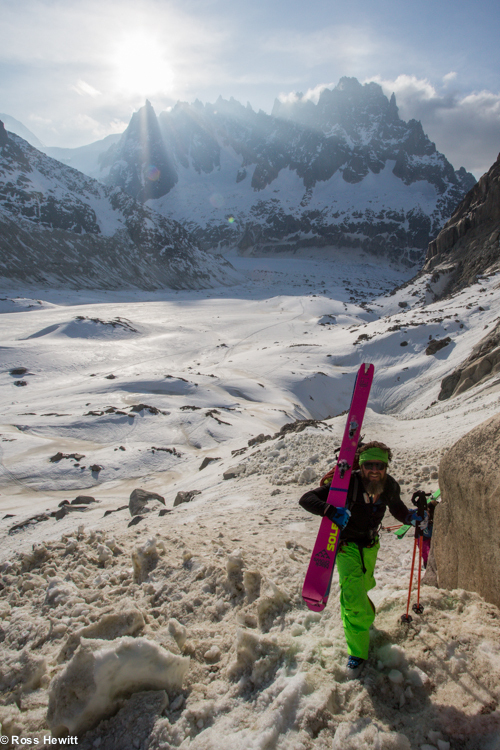 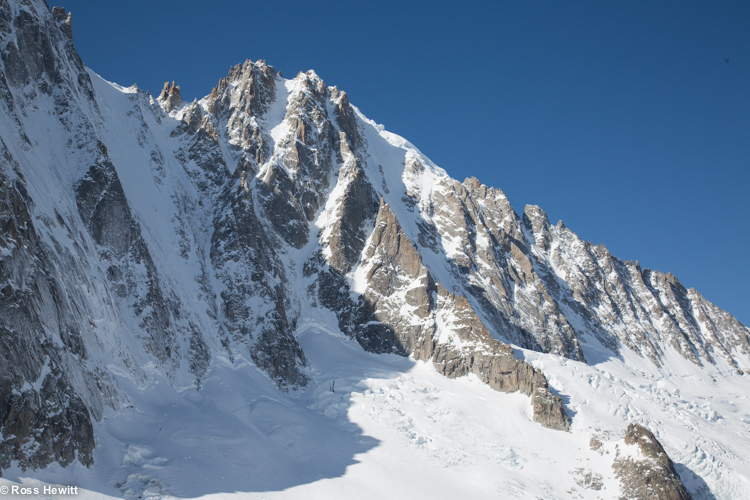 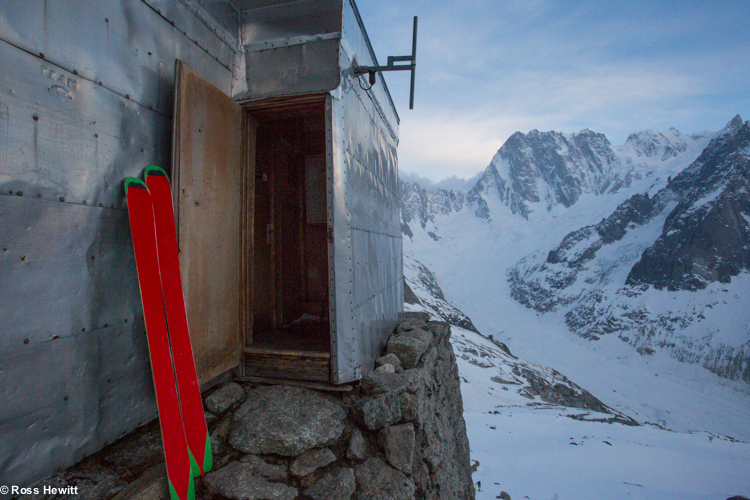 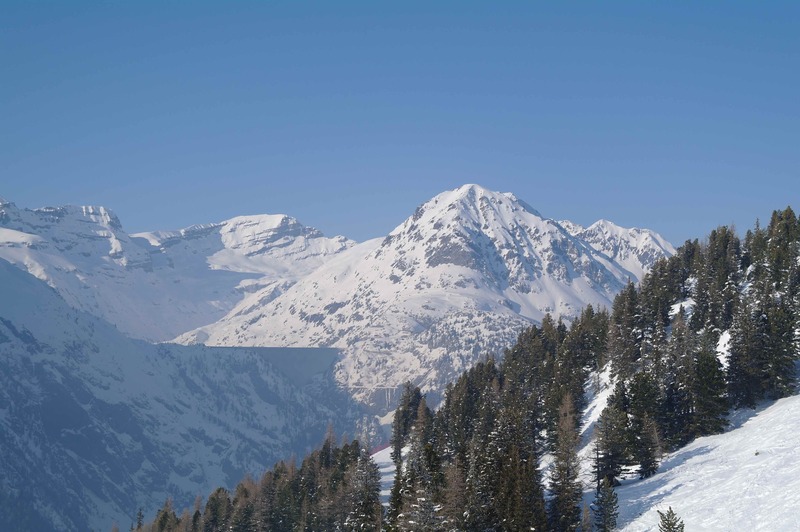 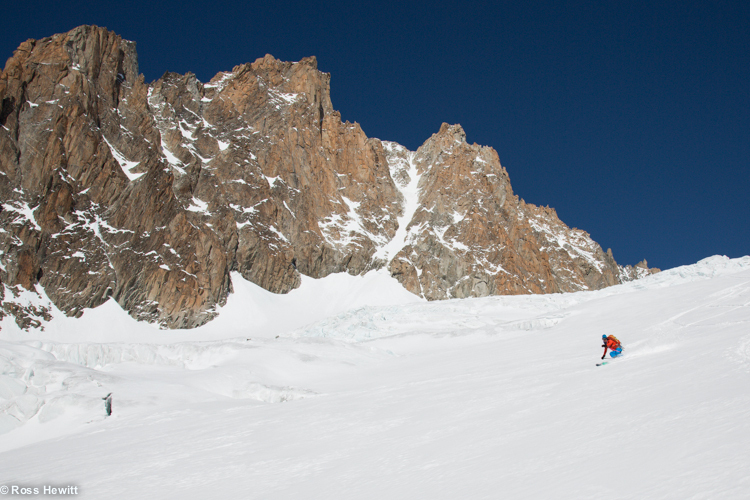 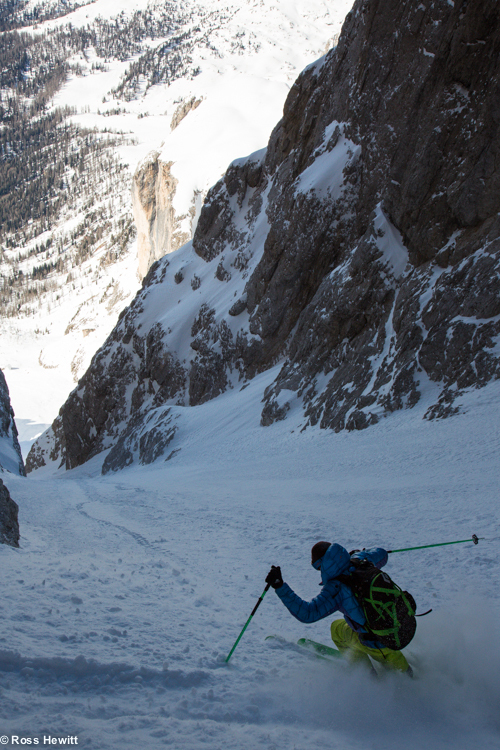 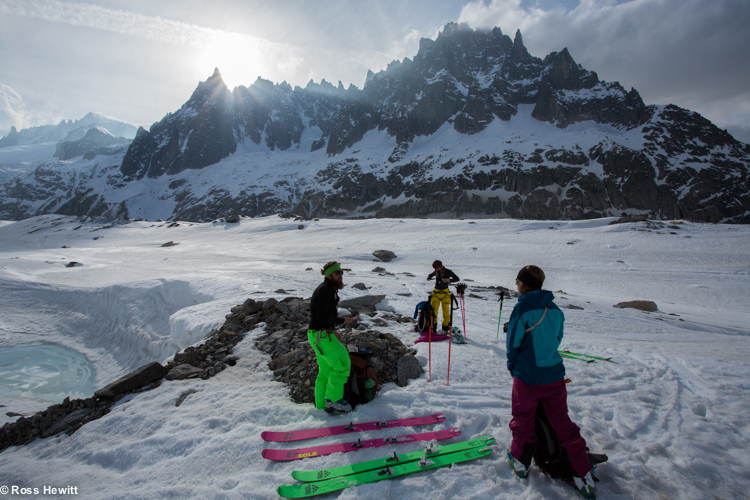 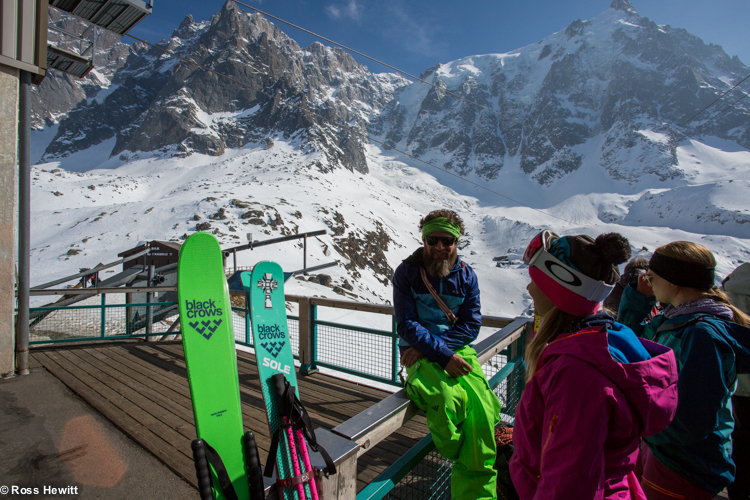 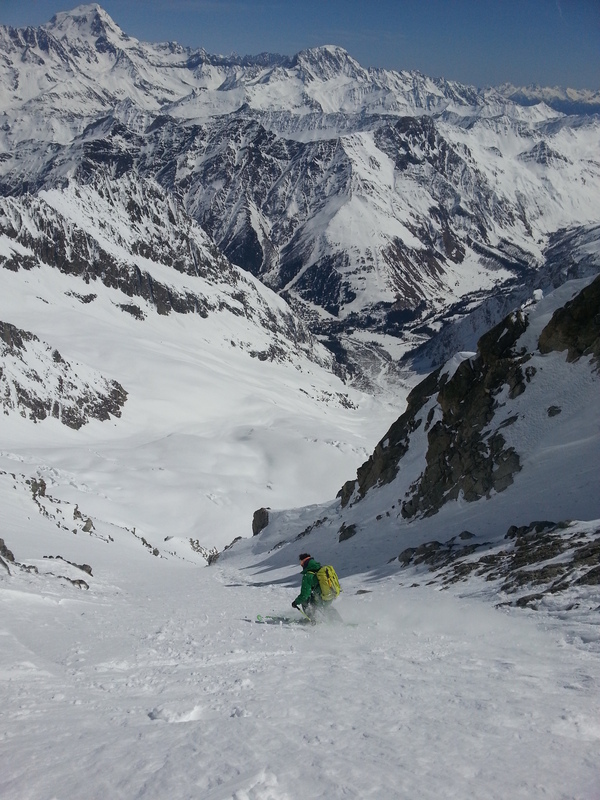 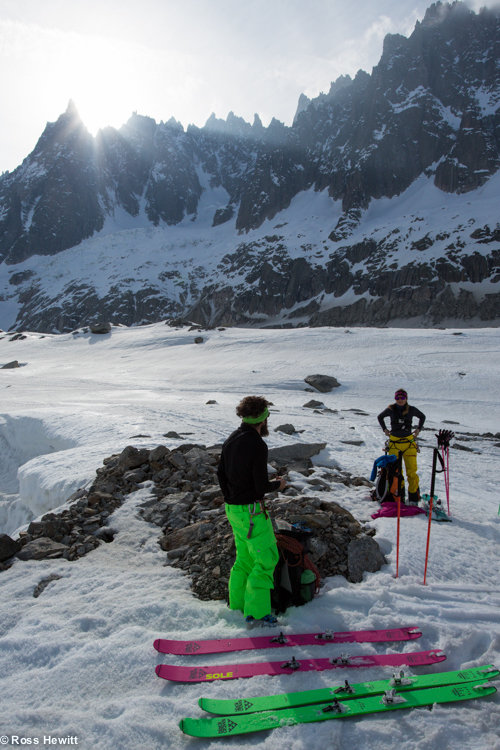 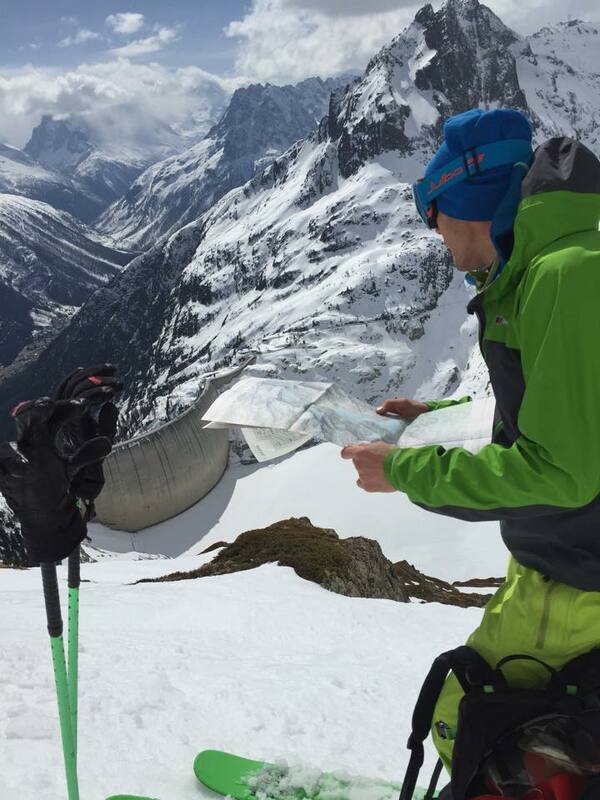 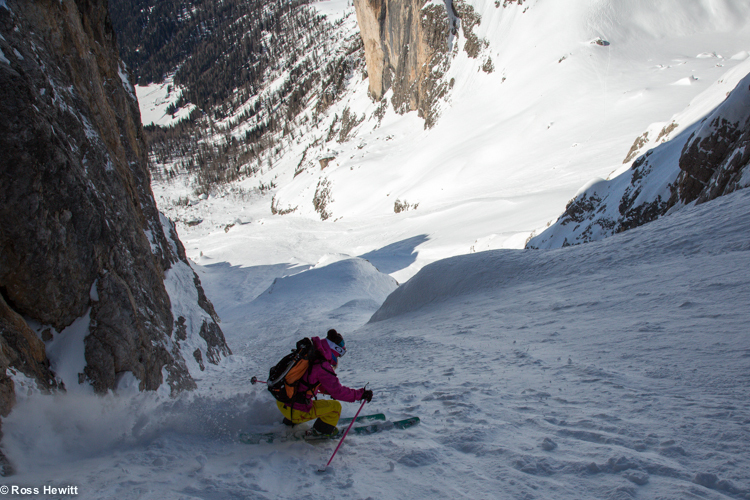 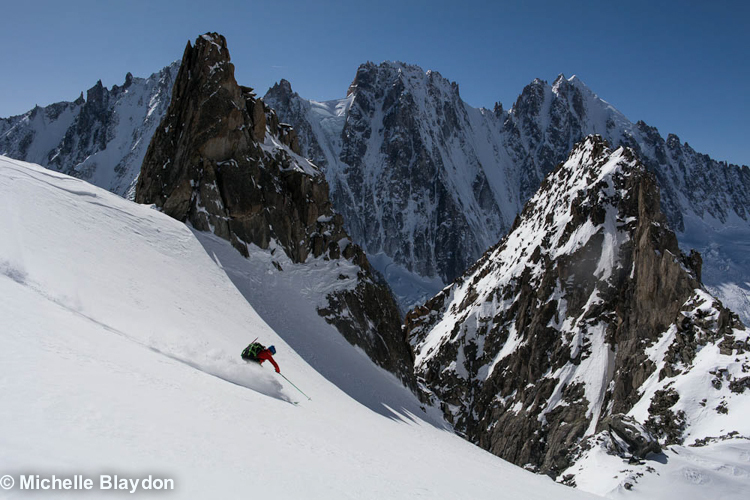 The North Wall of the Argentiere Glacier – a lifetime of extreme ski dreams in one place. 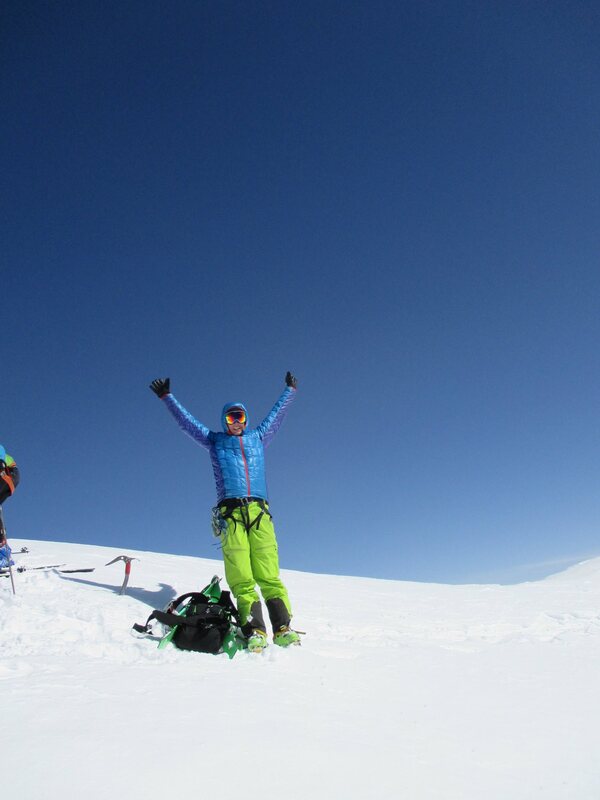 Me happy on the summit. 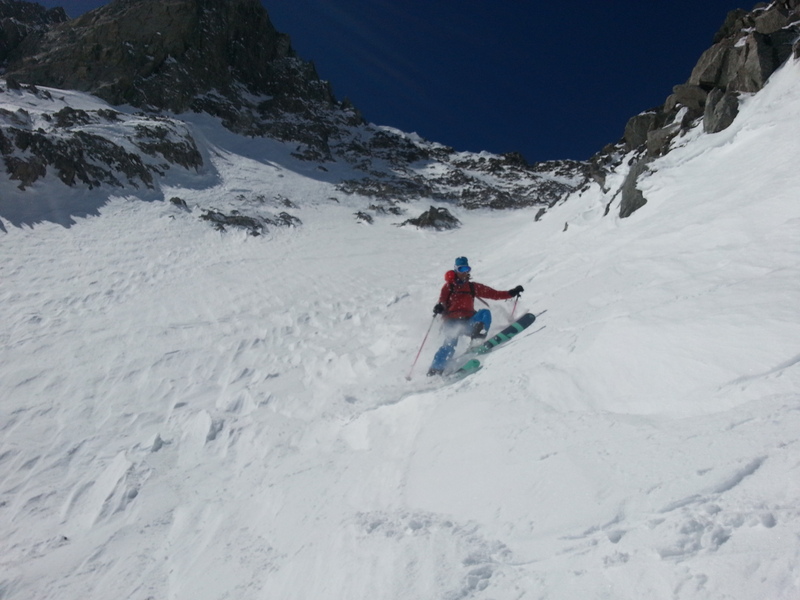 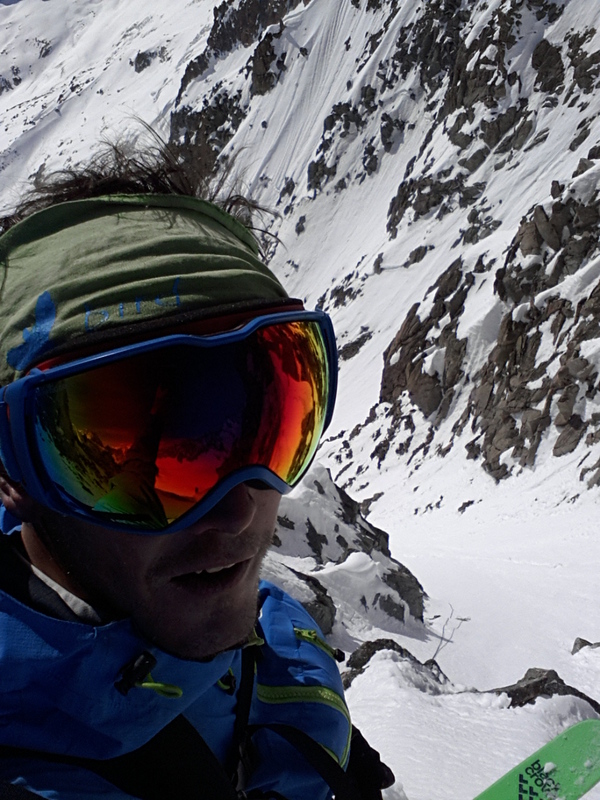 I was really happy to see such good conditions and lots of direct sun. 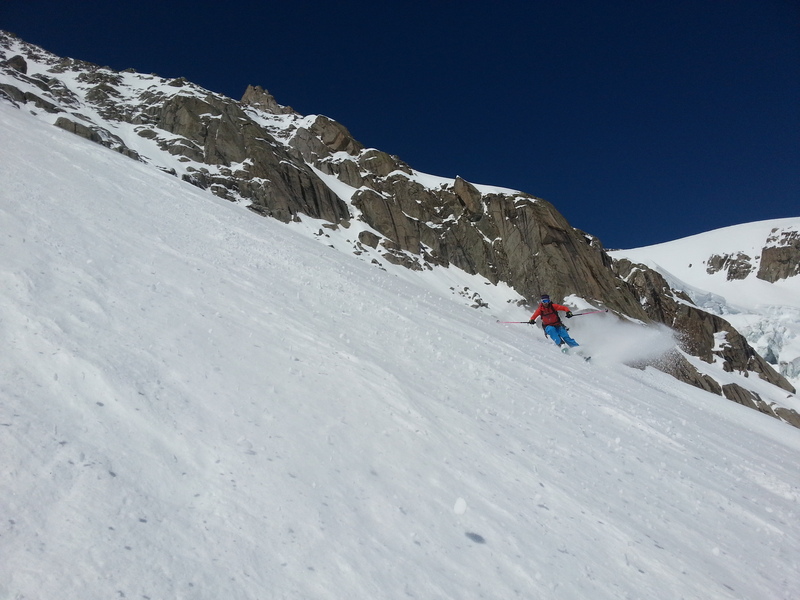 Matthieu skiing cautiously between softer patches. 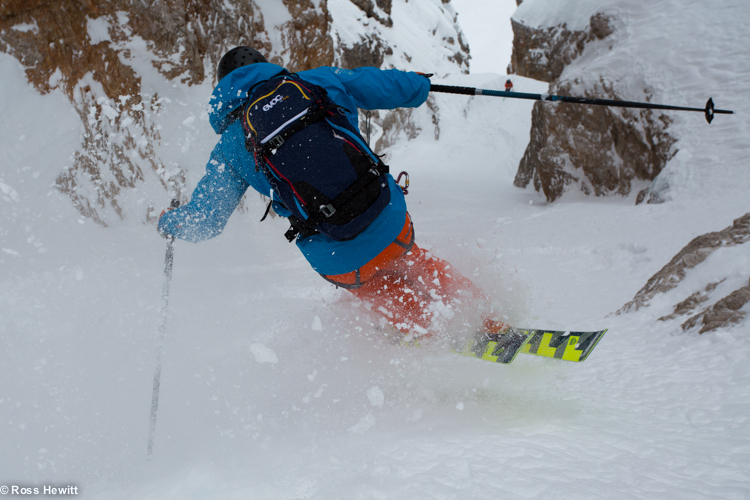 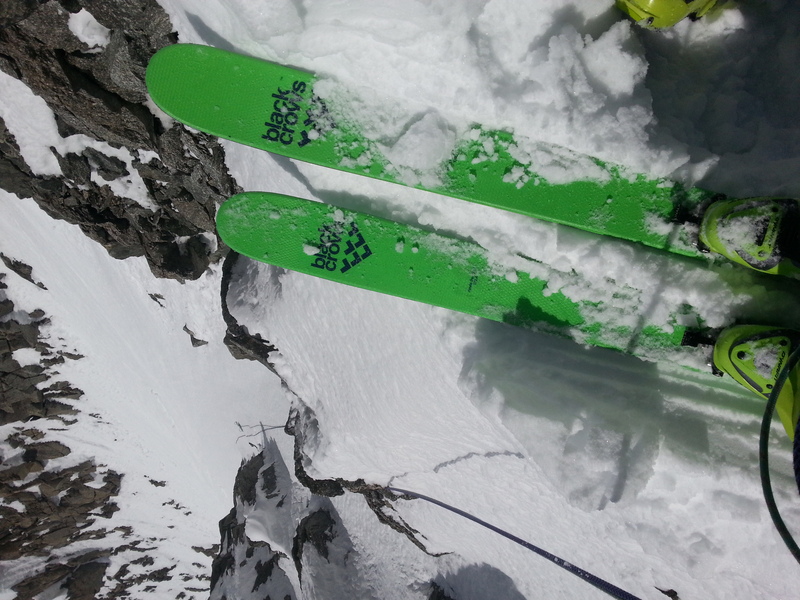 The Black Crows Navis Freebird is an astonishingly good ski. 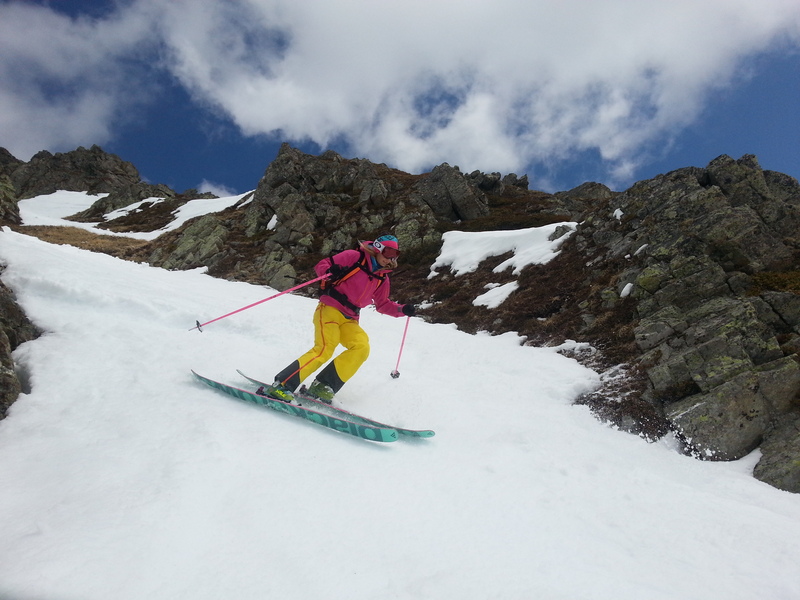 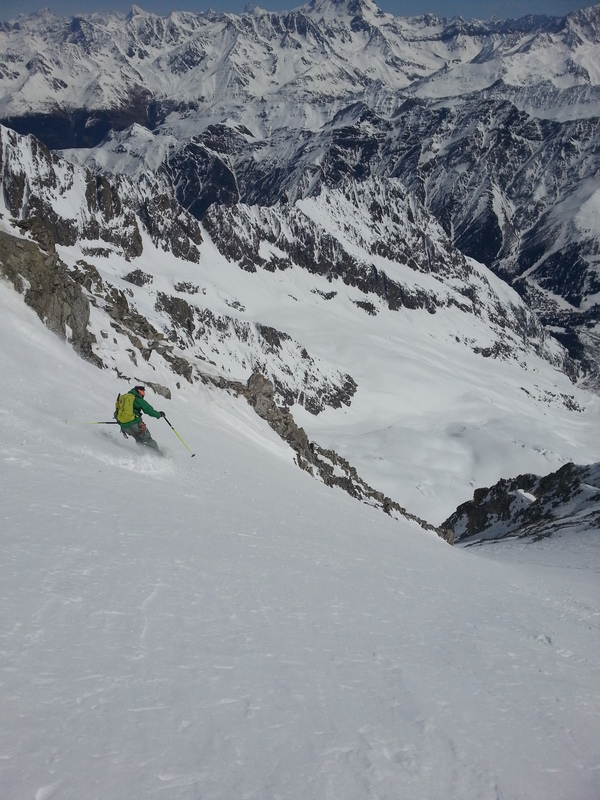 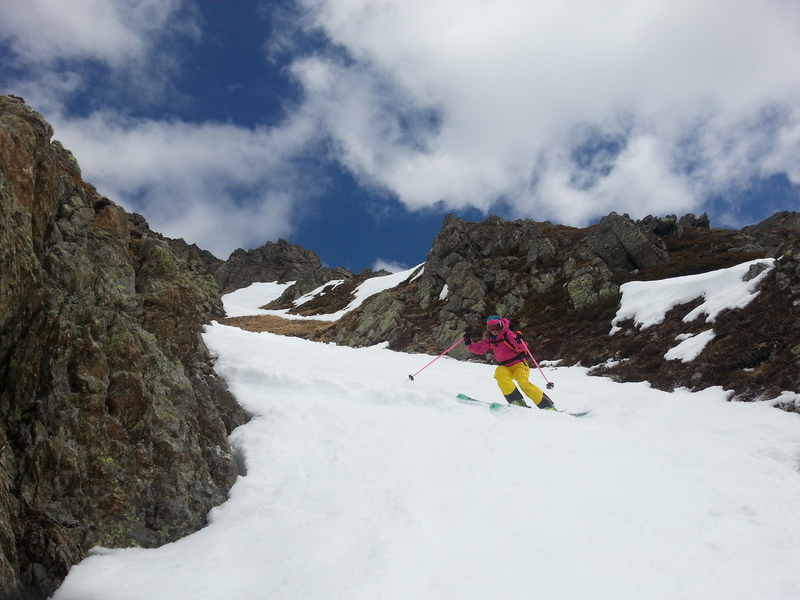 Kirsti skiing ice axe in hand! 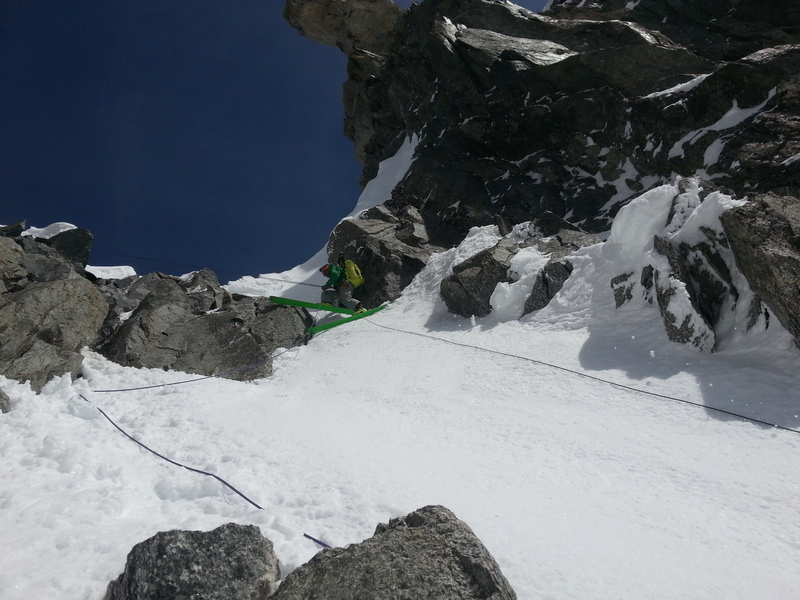 Me in the upper section, Thanks to Kirsti Lehtimaki for the photo. 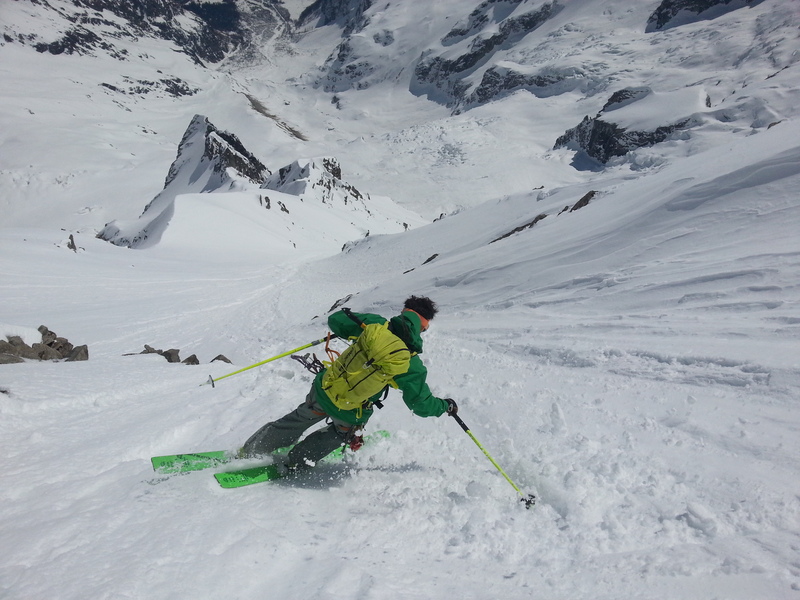 Still on firm snow at this point and putting in the chop turns to avoid any uncontrollable build up of speed.